I acquired an abandoned 2012 GTS after it had spent several winters (and summers) adorning the sidewalk by my neighborhood laundromat. Toppled over and banged up, it looked defeated. 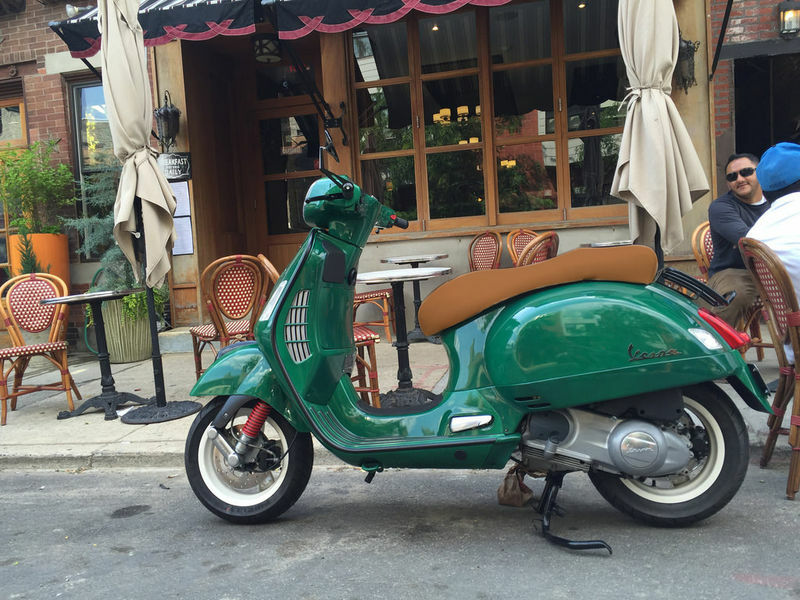 But having recently returned from Greece, where we tore up the mountainsides on Taiwanese “Vespa-Impostors”, I was feeling the symptoms of withdrawal and felt compelled to give this bike a second life. I barely pushed it home, all of 4 blocks away, with the crooked fork and deflated tires adding what seemed to be 600 pounds to its already hefty weight. 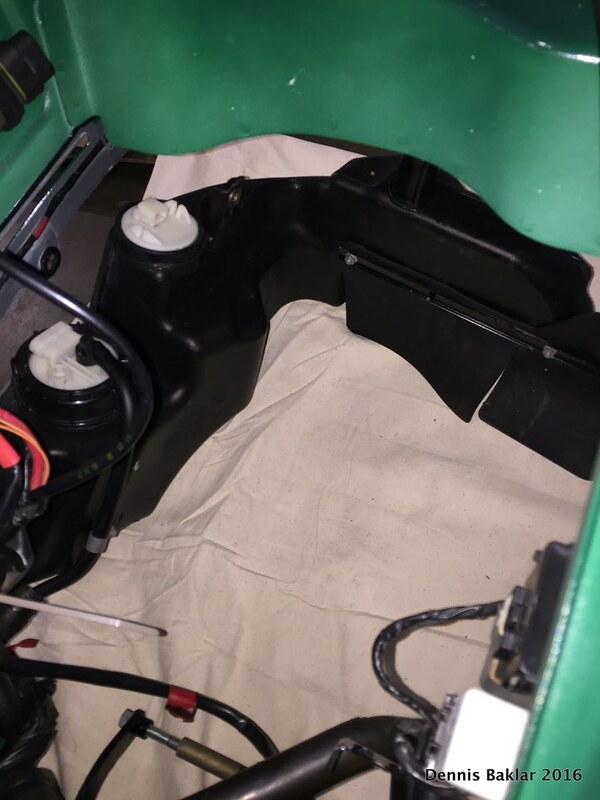 I watched my second ever how-to video on Vespas “Jumping the GTS Battery” after my first video “How to Unlock Seat with Dead Battery” got me into the seat…which to my bewilderment didn’t have the battery in it! I hooked up the jumper cables, toggled the kill switch, crossed my fingers, said a few prayers, and hit the red button. 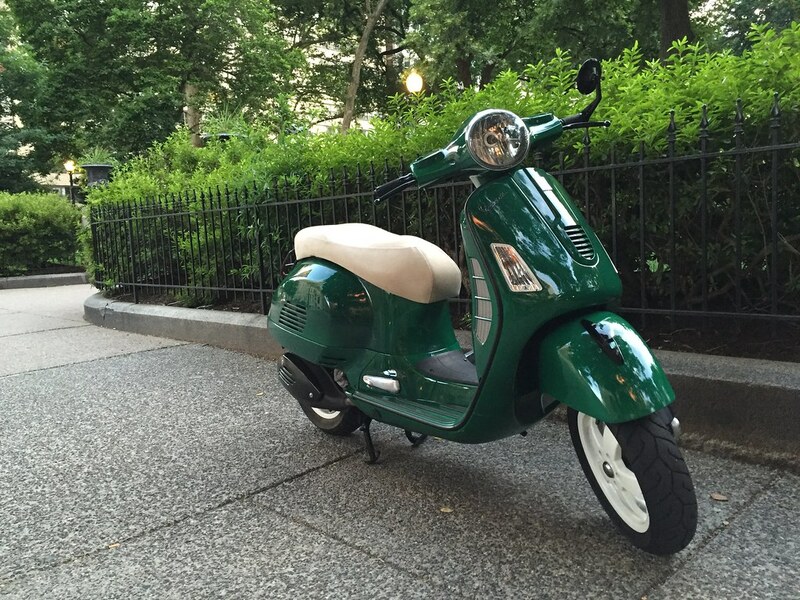 Without any hesitation at all, the engine fired, the Vespa came back to life. 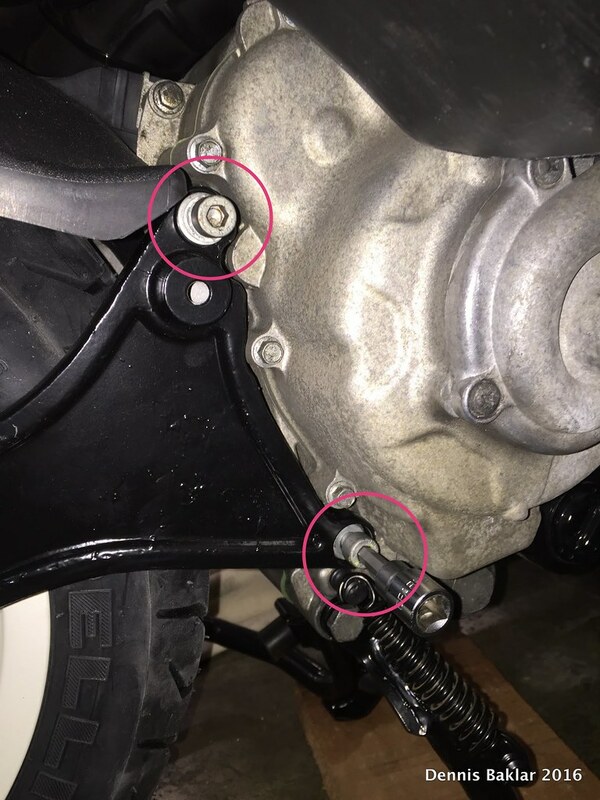 As I began stripping the bike to get to the fork, lots of other things started to bother me. 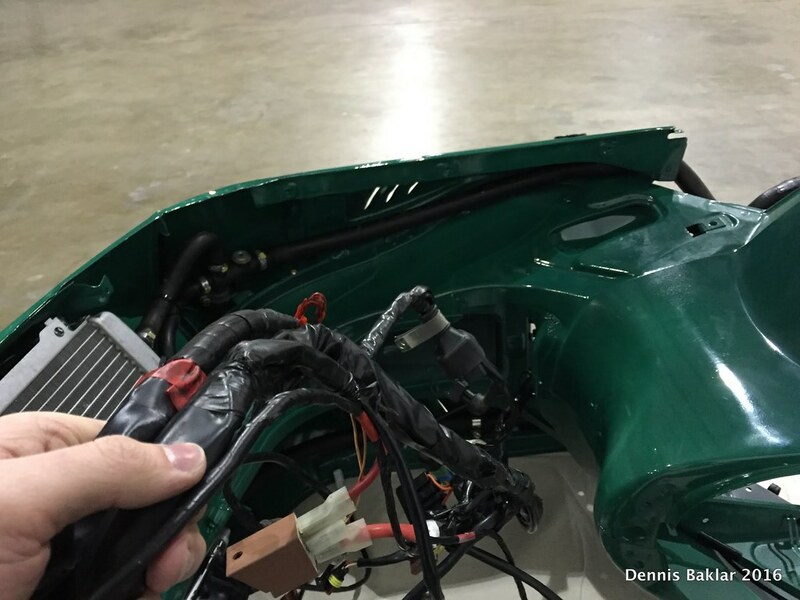 Broken panels. Rust. 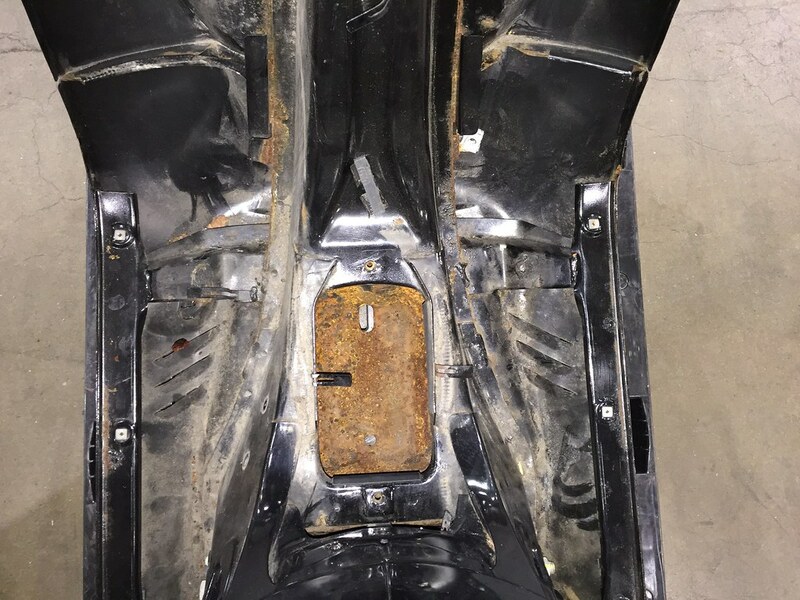 Seat covered in some impossible-to-remove glue. 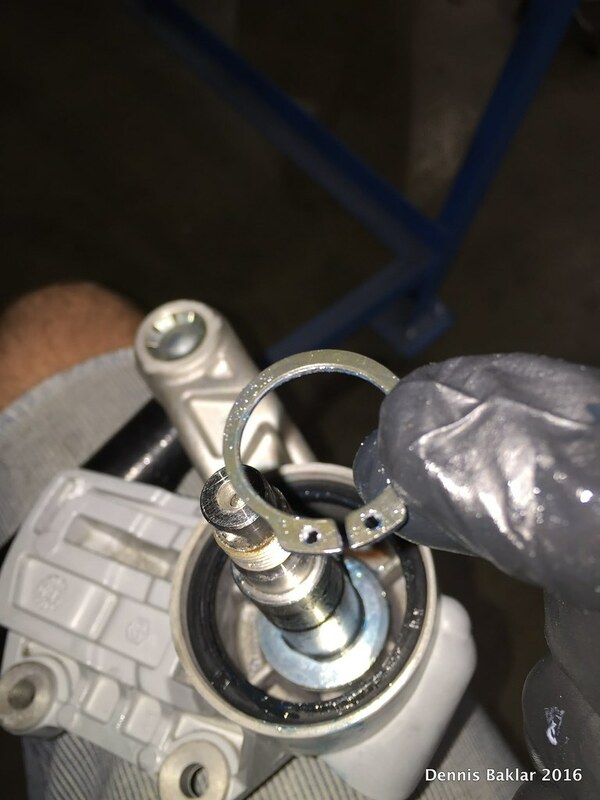 So slowly but surely I began to realize that instead of just changing the fork, I’d go ahead and fix it all. It took a few days for this decision to form, but once it did, I knew it was a good one. I approached the restoration as an experiment, not knowing whether the process was something I would enjoy or simply a treacherous means to a more enjoyable end. 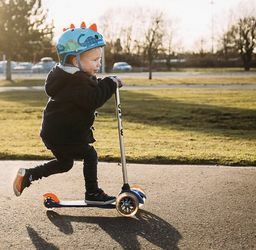 I figured that if I didn’t like it, it would still be a great learning experience, shedding light on the inner workings of this 2-wheeled machine. But if I did enjoy it, then I could possibly do it again someday. With that understanding in mind, I wouldn’t be making any investments into expensive tools but working mostly with what I had. 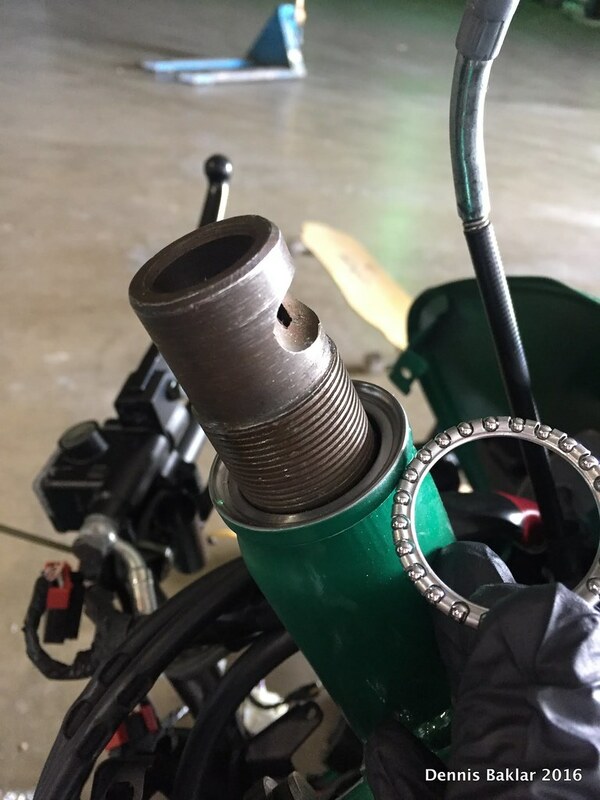 Even though I did end up buying a few specialty tools, I was surprised how much of the work could be accomplished with a common arsenal (I list the tools I used at the bottom of this post). I figured that if my efforts were successful and the GTS ended up looking nice, I would want to keep it around for quite some time. 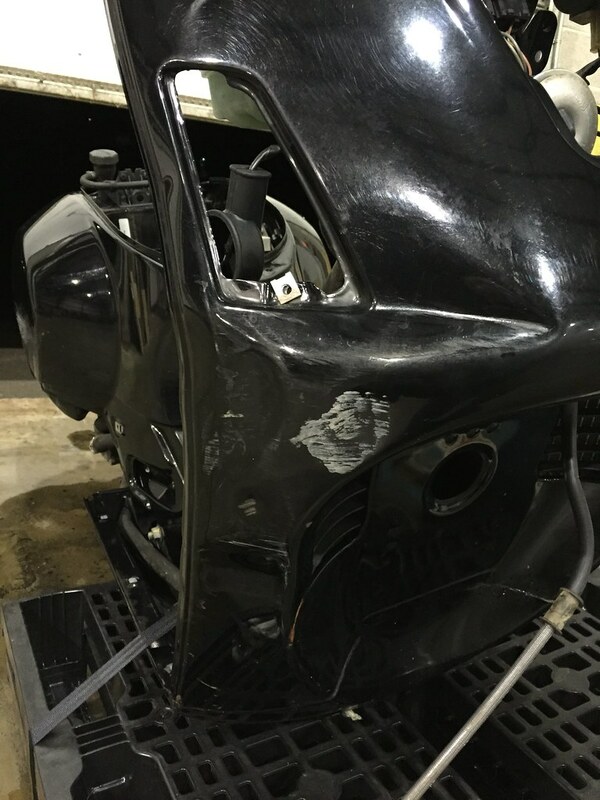 So I decided that the body work should be done in a way that would hold up for at least 10 years. Here are some ‘before’ pictures. 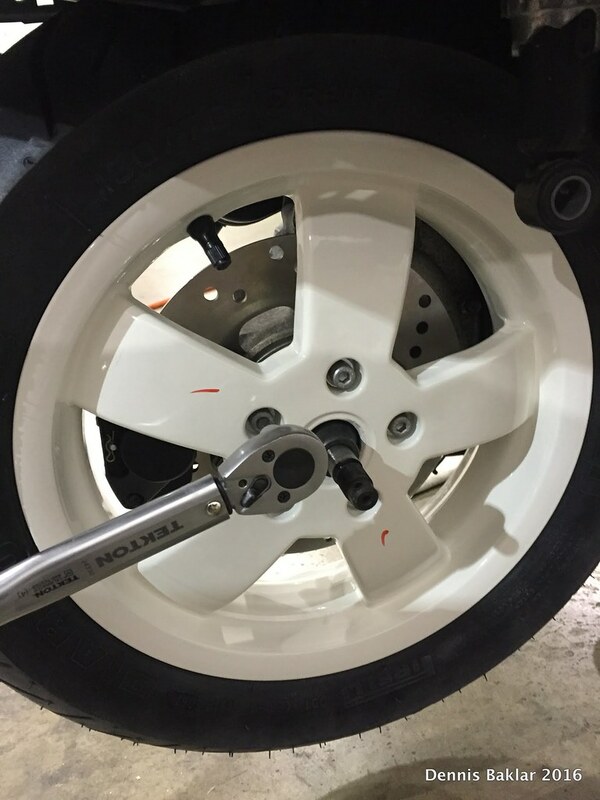 Some people believe that powder coating doesn’t produce as fine of a finish as paint does. 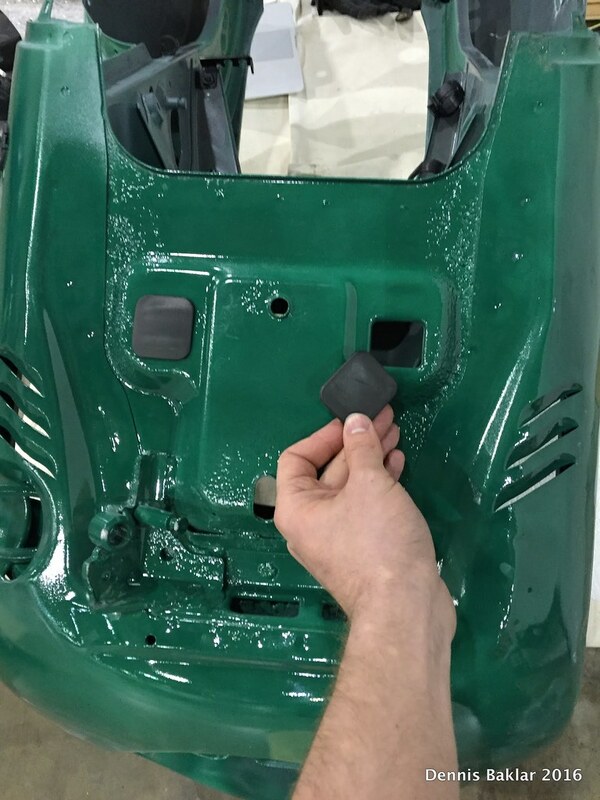 Additionally, plastic parts cannot be powder coated so that creates the new challenge of matching paint colors for the plastic to powder coat colors on the metal. 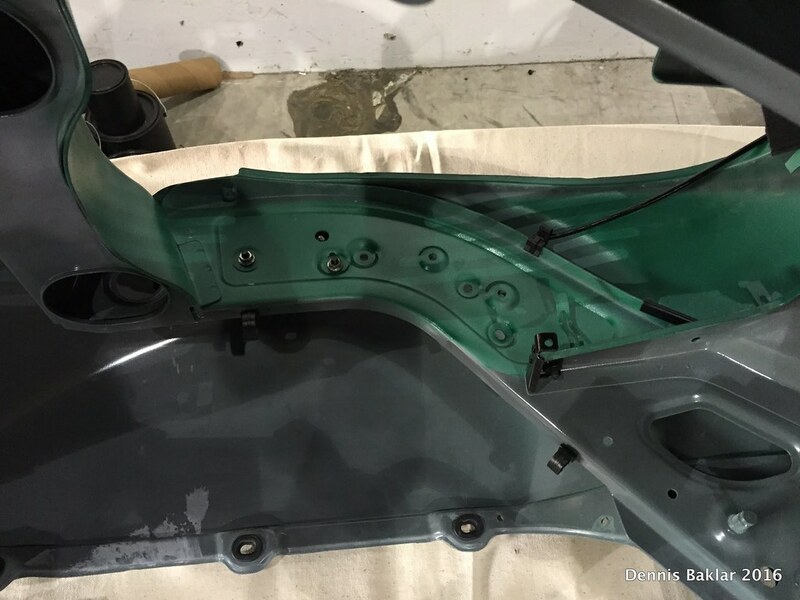 I wasn’t concerned about any of this, since my main reason for powder coating the frame was rust-proofing. 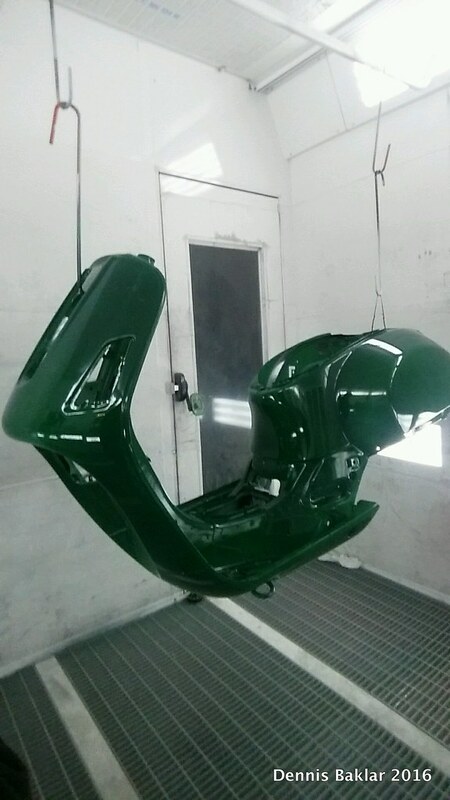 I would paint over the powder coat, which freed me from having to match paint colors. 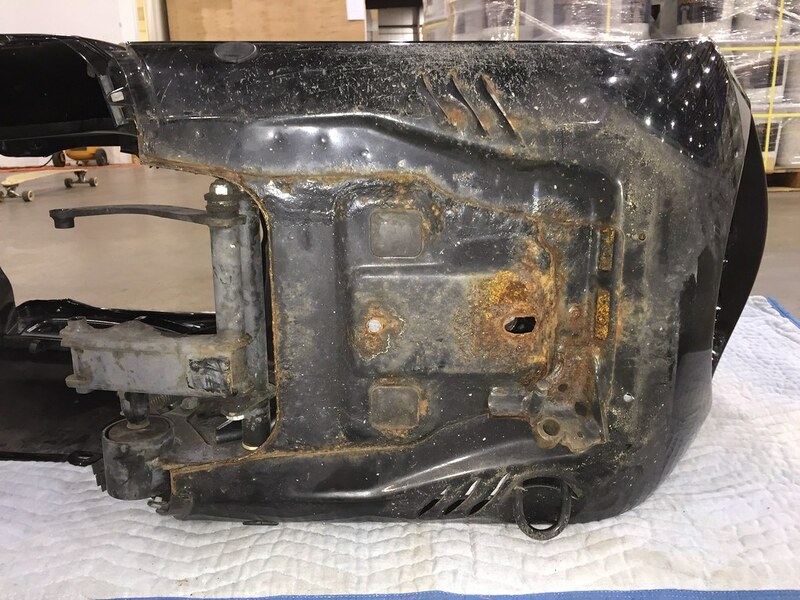 Once melted, the powder coat formed a tough skin on the frame, much thicker than paint, giving me assurance that minor scratches down the road wouldn’t expose the bare metal and make it prone to rust. 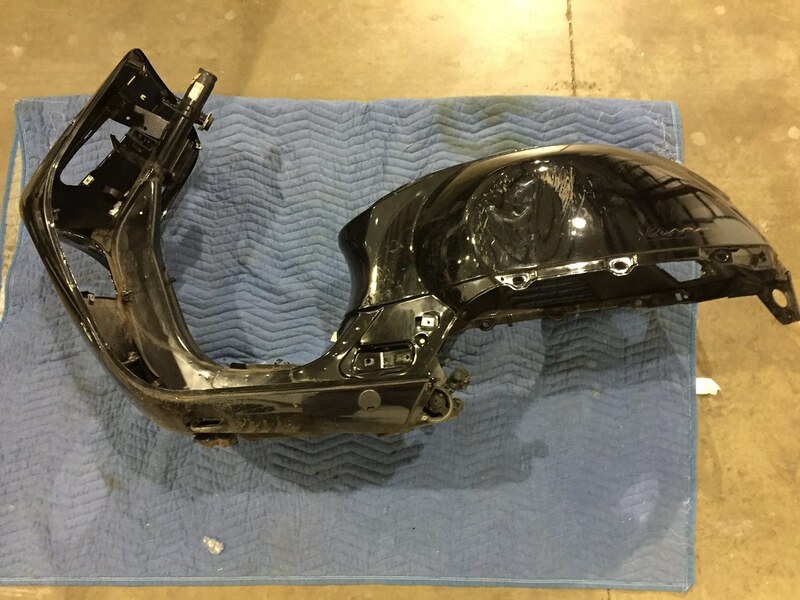 Here’s how the frame looked after the powder coaters were done. It was nice. 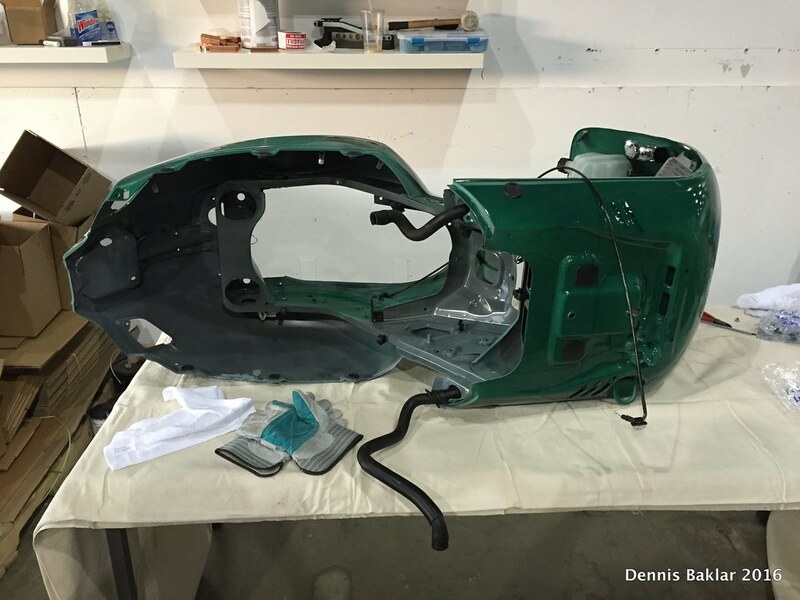 A few days later the frame and plastic panels went to a student in tech school for painting. While painting was underway, I worked to prepare the other components. 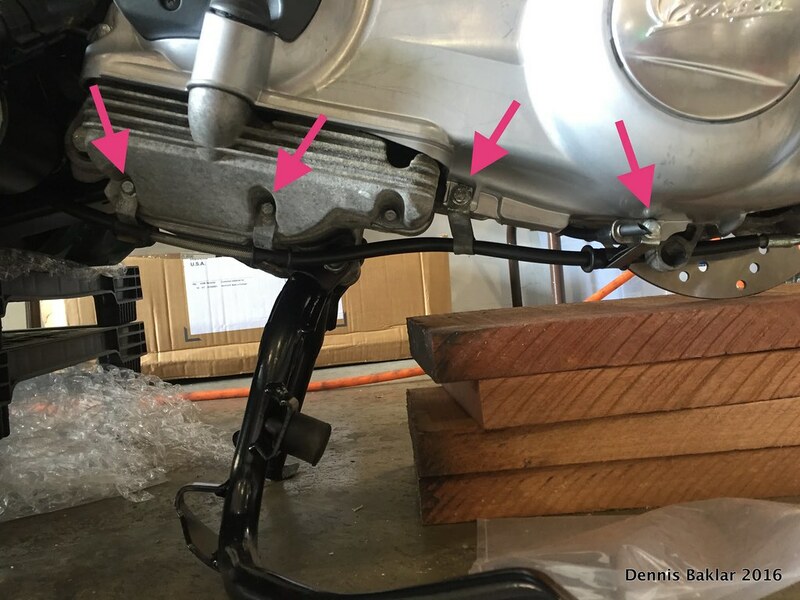 Many parts were damaged (bent fork, rusted calipers) so I ordered new ones. 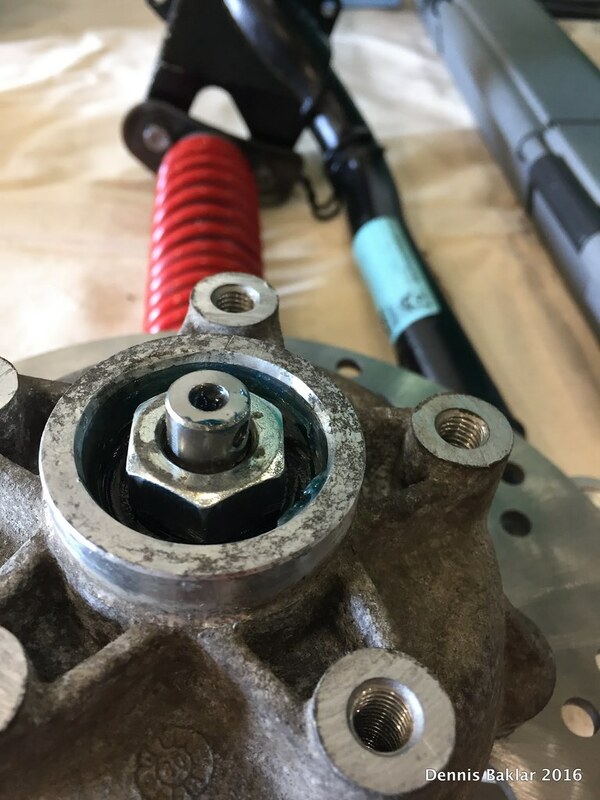 When deciding whether to rebuild or replace various parts, I did a very basic cost-benefit analysis, and in most cases it was faster and cheaper to get the new part instead of messing with the old one. 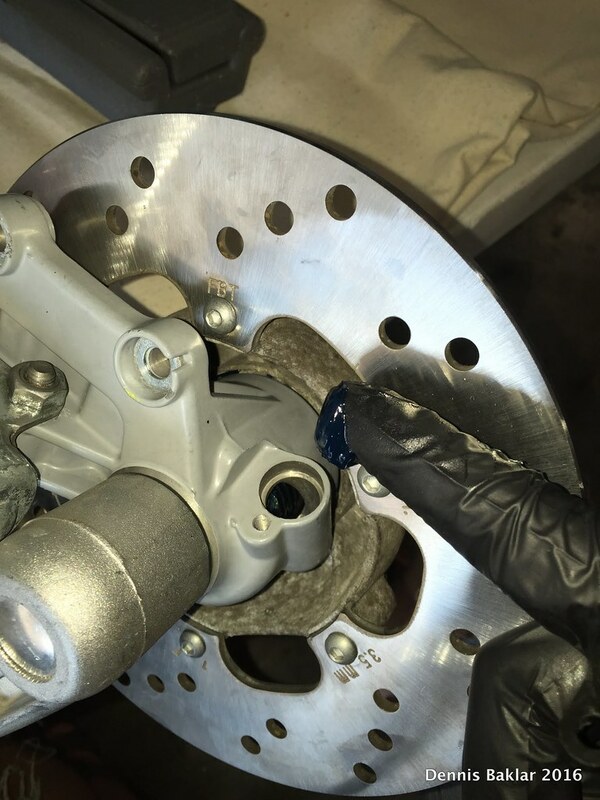 Rebuilding the calipers, for example, would have required a special tool, new fittings, $70 worth of powder coating, and at least several hours to complete the process. 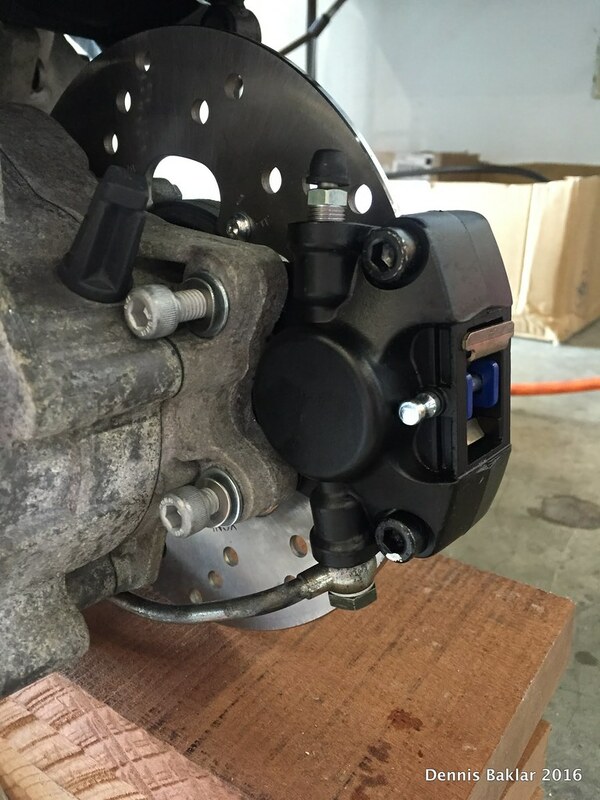 Two new calipers cost me $130 and a few clicks of the mouse. That’s my logic. I decided to leave the engine alone. 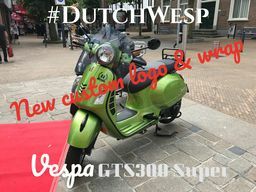 Prior to beginning this project I had taken the GTS to a local Vespa mechanic who confirmed that the engine was in good shape and probably the “only good part of the bike.” It was an important verdict, because had the engine been bad, the project would probably not have been worthwhile; it would have been easier and cheaper to buy a gently used GTS instead, or restore something vintage that can’t readily bought. 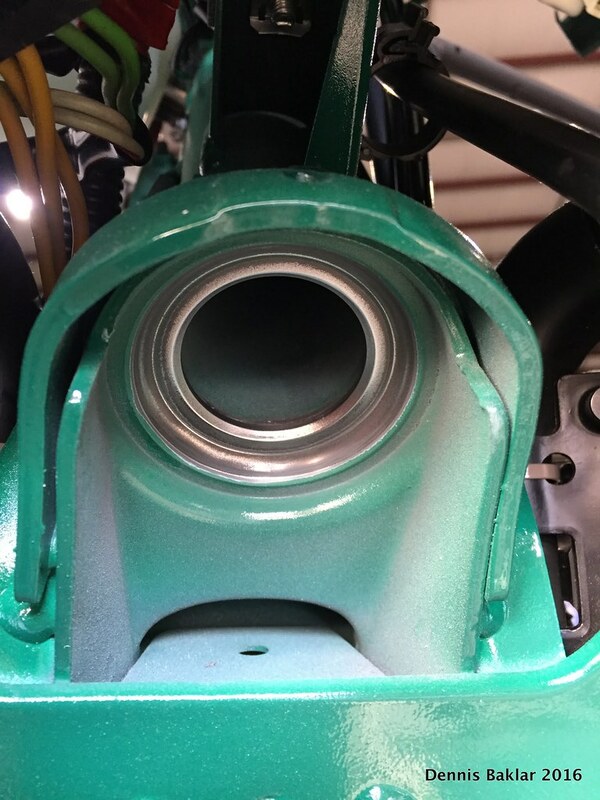 The engine casing, along with other aluminum parts, like the front hub, had heavy oxidation from spending several years under the weather, but that was purely cosmetic, and in my opinion, an honest throwback to the Vespa’s roots. 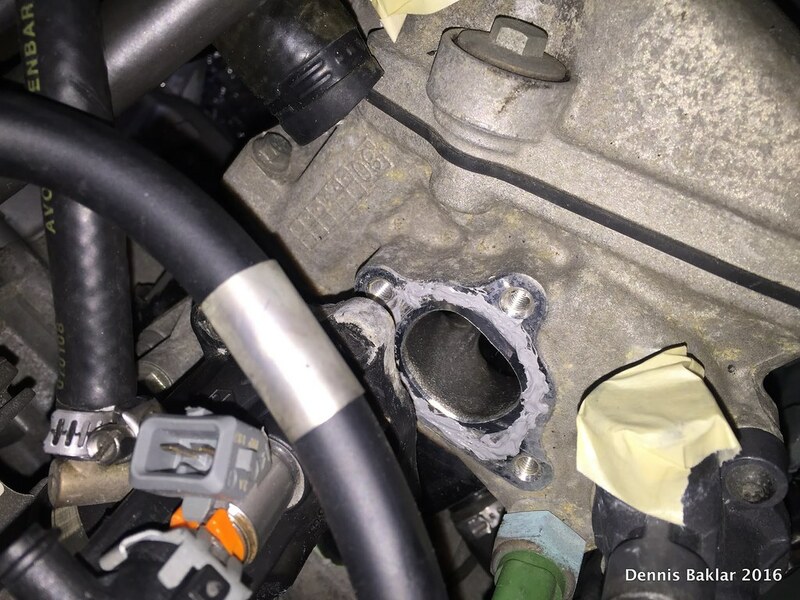 Had I decided to clean up the casing, I would have needed to take the entire engine apart, remove all bushings and non-metal parts and send it off to a vapor-blaster (here’s why vapor blasting is ideal for engines over sandblasting http://www.vaporblasting.biz/). 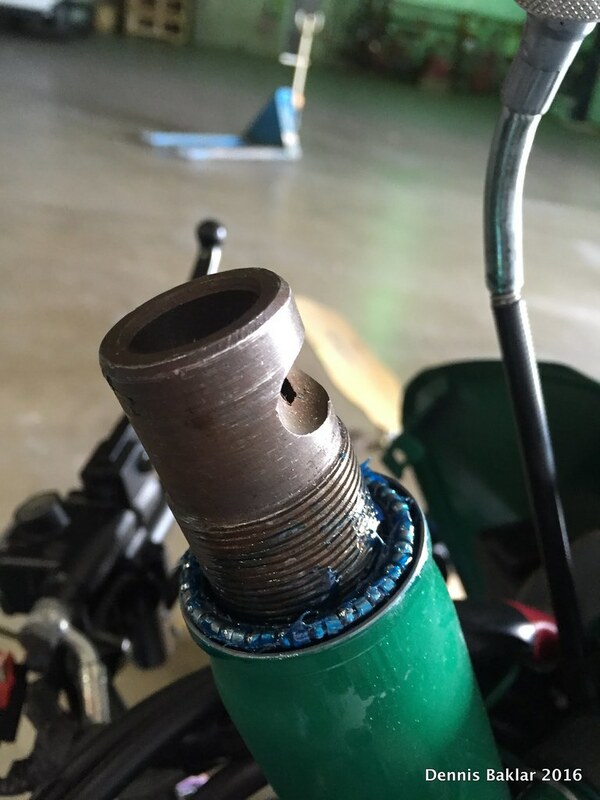 A 3-year old engine didn’t warrant this type of overhaul in my non-expert opinion; besides many more things could have gone wrong had I decided to f$@# with it. 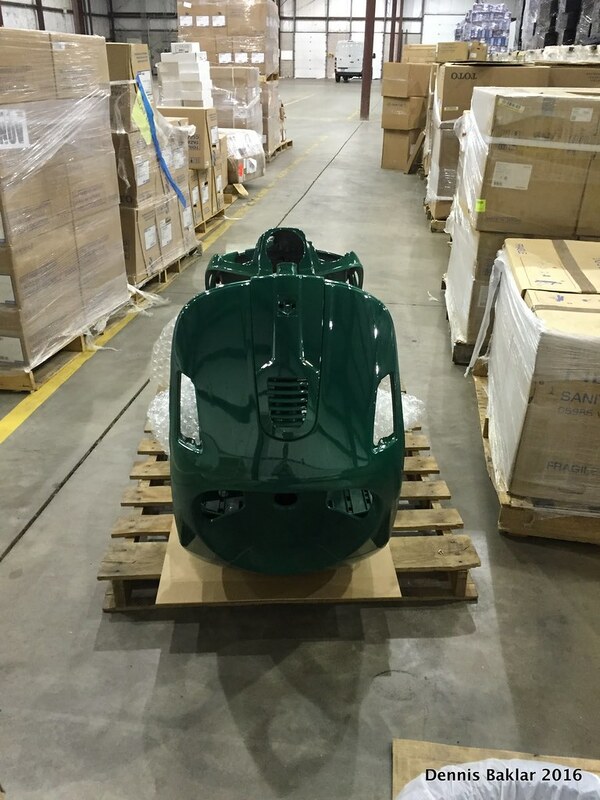 When the painted parts returned returned, a new breed of Vespa emerged. 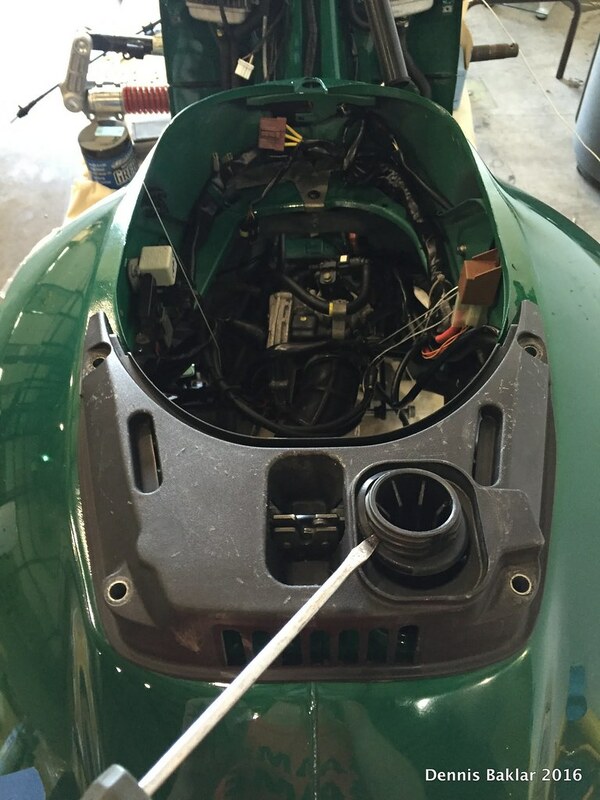 Enter British Racing Green. I admit that, initially, this wasn’t my color of choice. But the painter brought it up as an option and seemed very excited about it. I figured I’d let him have his way, since he’d probably be more excited to paint something he likes, than not. At the end of the day it was a good choice. He did a pretty decent job and I was happy with the unusual color. So without further ado, we begin…I hope you enjoy! At this link, you will find a folder with text documents, each referring to a step of the disassembly process. For each text document, there is a matching folder of images to reference. 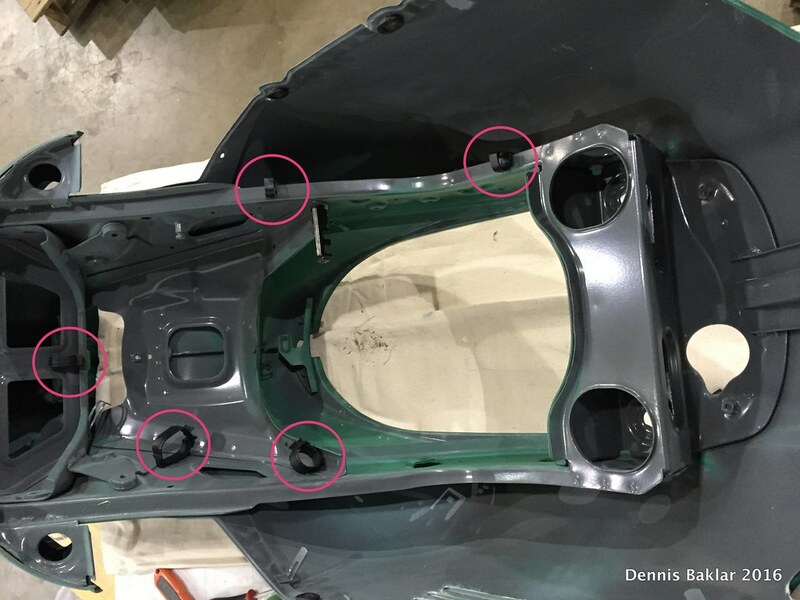 I photographed and annotated the disassembly process in great detail, which helped me later when putting everything together. 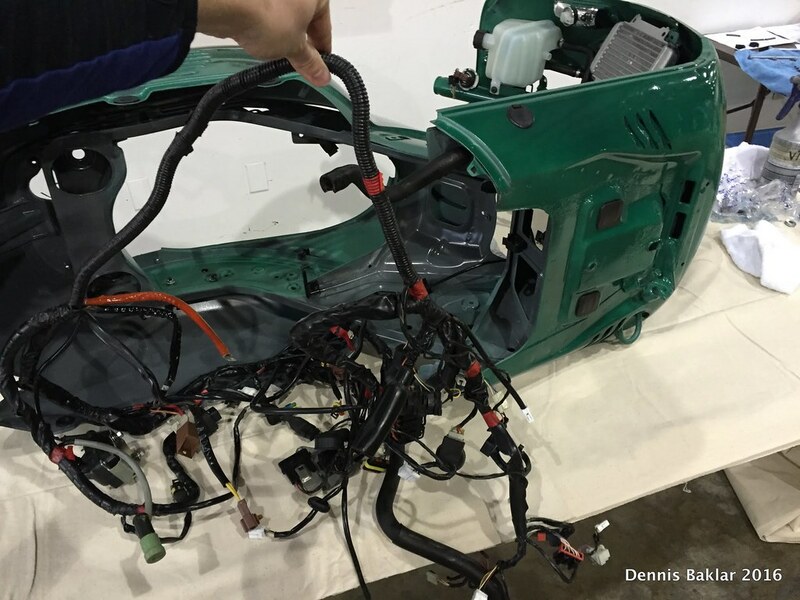 During disassembly, I worked in stages, taking pictures and making notes in a text file. Before going to the next stage, I would review the notes and mark which pictures correspond to each step. I highly advise others to try this method for their projects. I cleaned the parts and prepared everything in boxes, arranged by system (i.e. 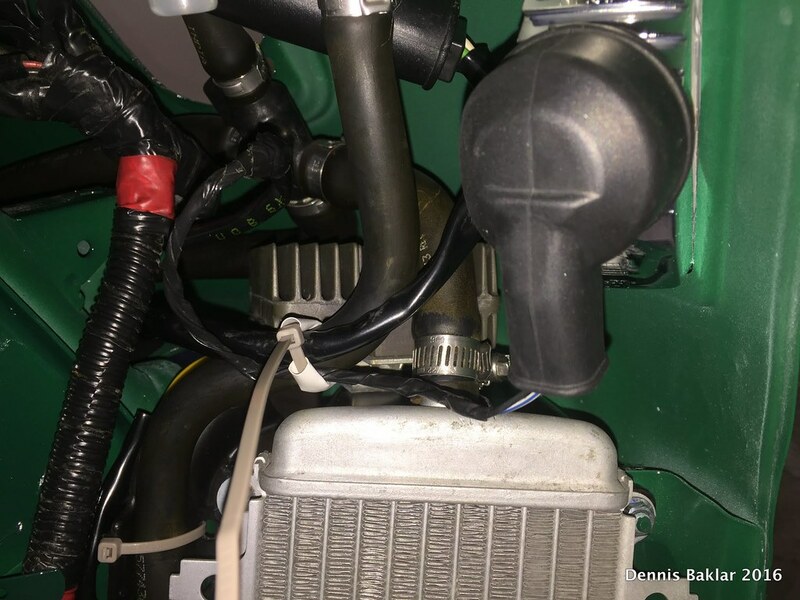 fuel, cooling, electrical, etc). And then, then the fun began! I tend to begin everything with the end in mind. For me, it’s a small symbolic step that sets the tone for the entire process ahead. 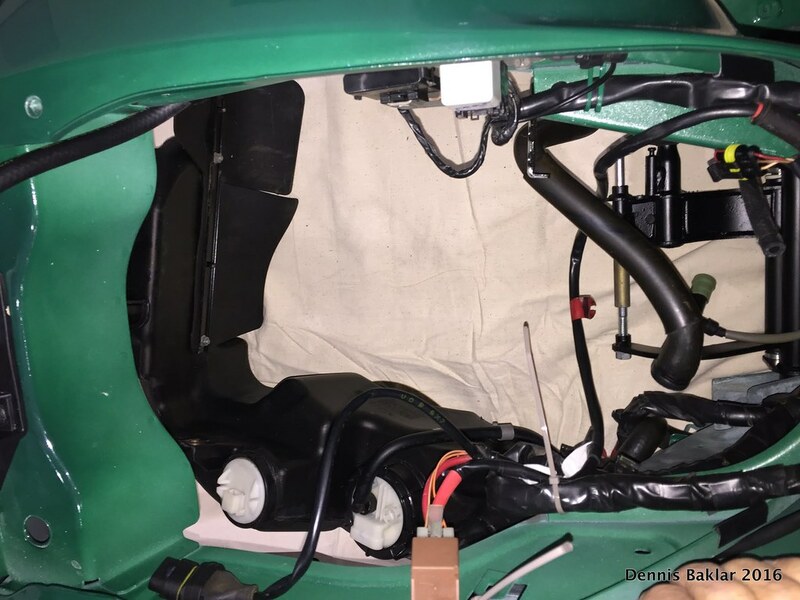 Since, the end goal was to start the Vespa and ride, I installed the ignition lock first! 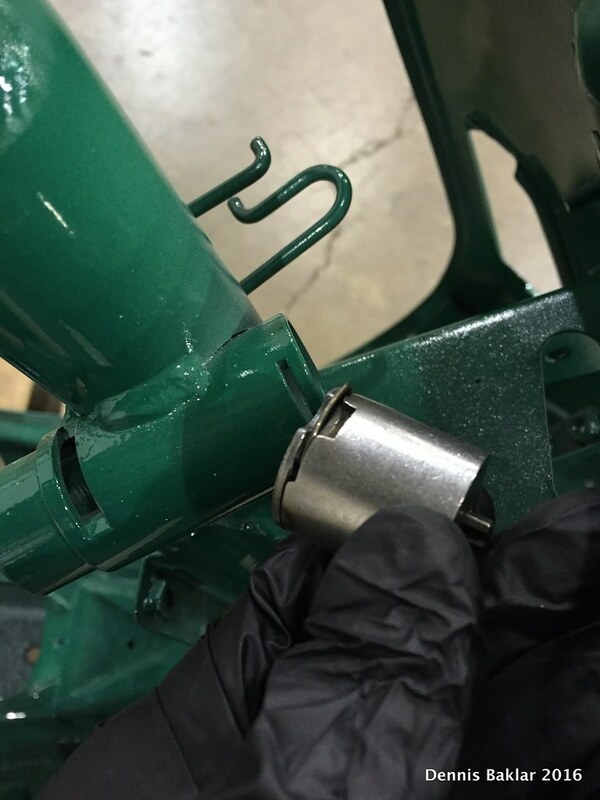 When the lock cylinder goes into the frame tube, the retaining clip faces upward through the hole for proper alignment. 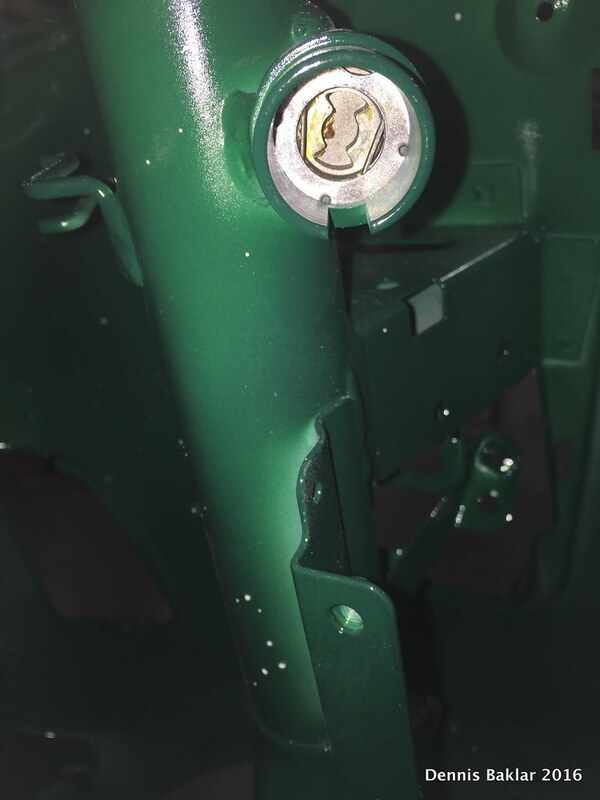 Aligning the prongs on the face of the lock with the holes of the cylinder. It just snaps right in! 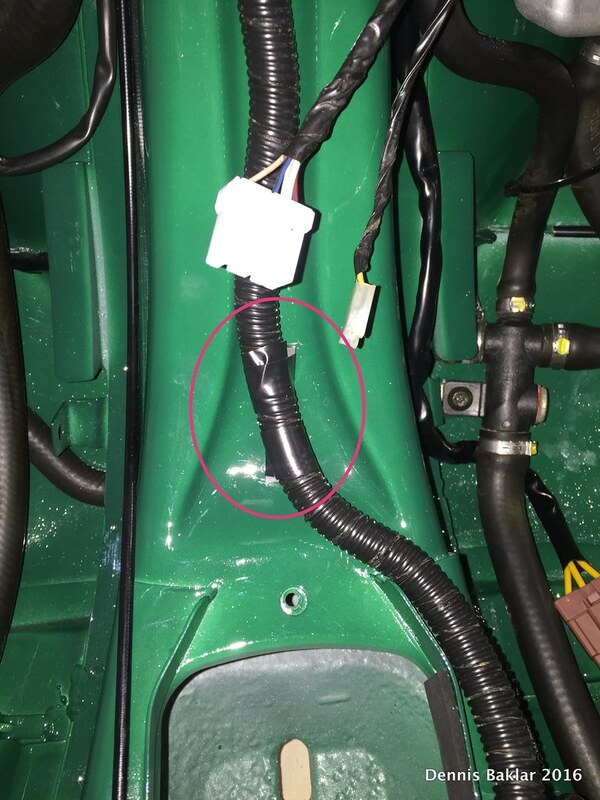 Throttle cable mount attached by single screw. 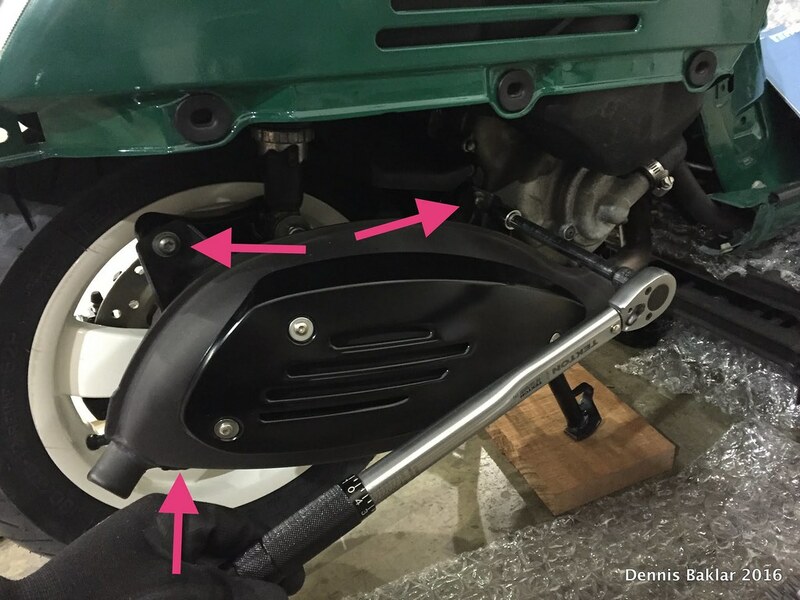 Covers snap into frame but will need to be removed later to tighten swing arm bolts. 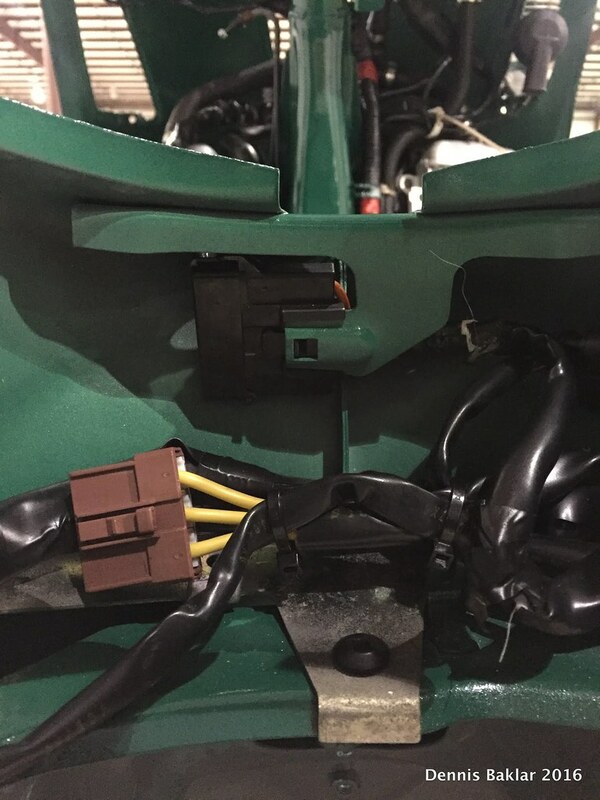 Beginning to install wire harness clips. 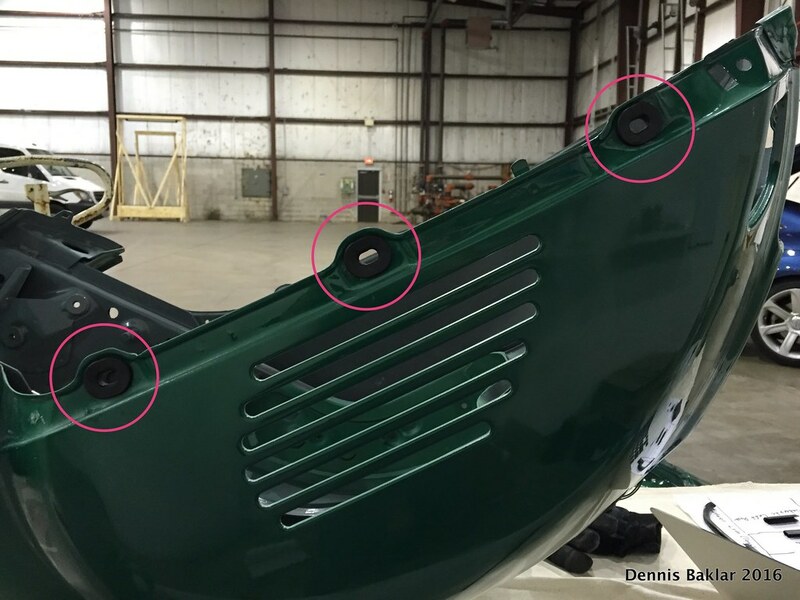 You can reference the Disassembly link above for even more detailed photos of locations. 5 clips on the underside of the frame. It’s important to use the correct ones in each place, as the sizes and shapes vary. 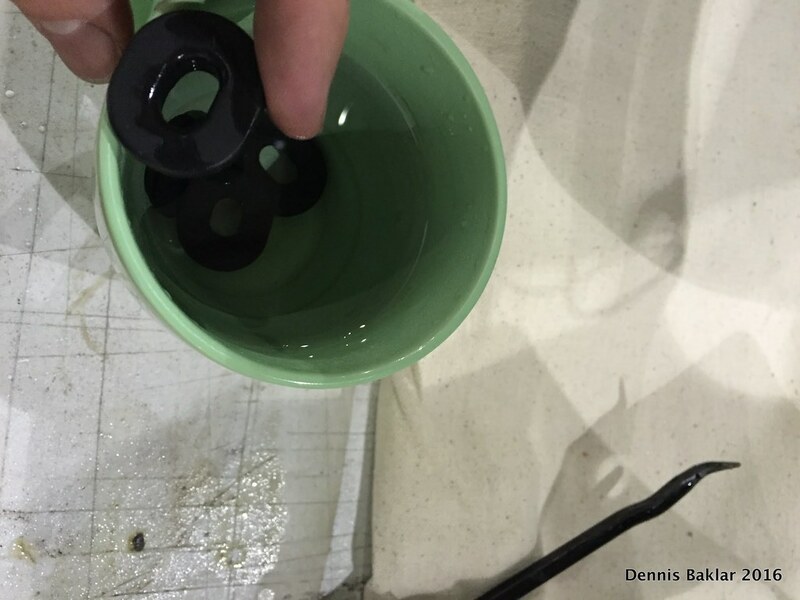 Soaking rubbers in hot water to make them softer and easier to install. Plugs for the underside. Not sure why those holes are there in the first place. 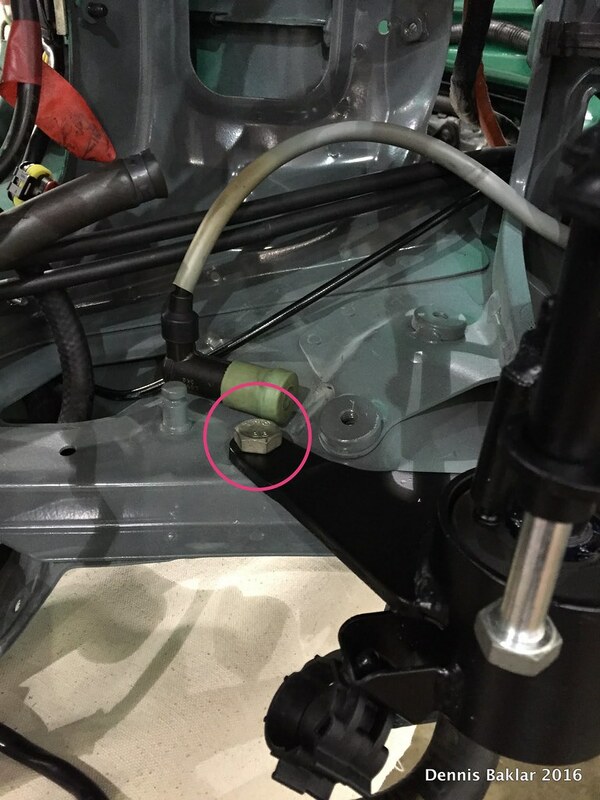 Another clip on Right Hand side of engine bay. This one is for the diagnostic cable terminal. 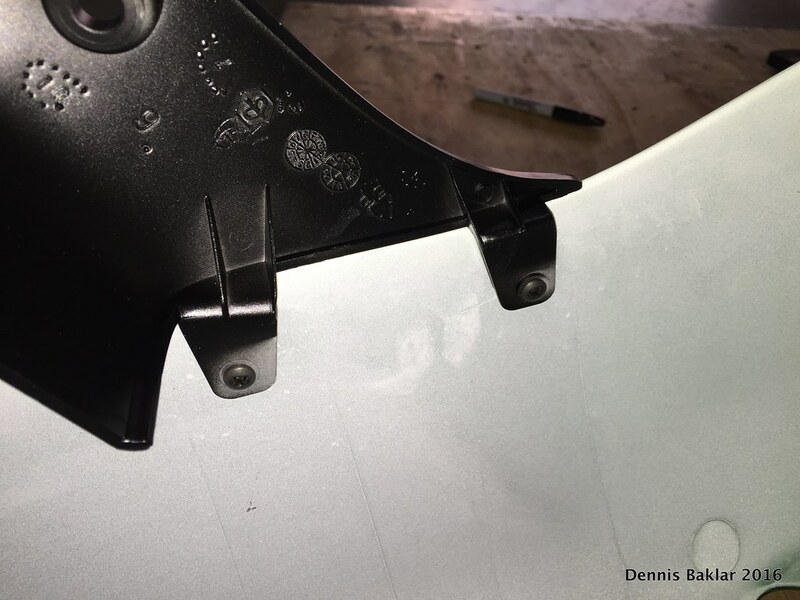 2 protectors wrap around the metal edges here to prevent the sharp metal from abrading the wires. Longer one of the 2 goes on Left Hand side. 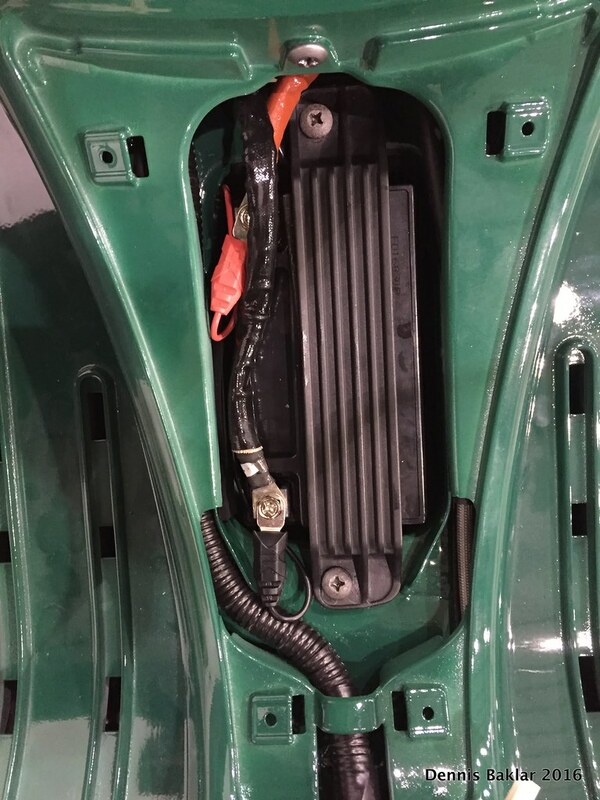 Foam dampener on Right Hand side of battery compartment and a metal protector on the rear side. At this point, I also preinstalled all the Tinnerman clips (speed nuts). 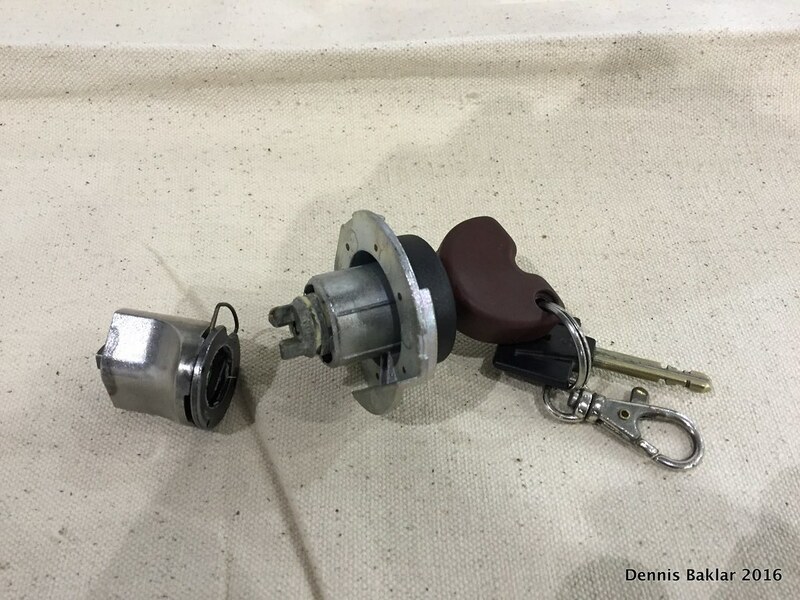 Check my disassembly link above to see the locations. 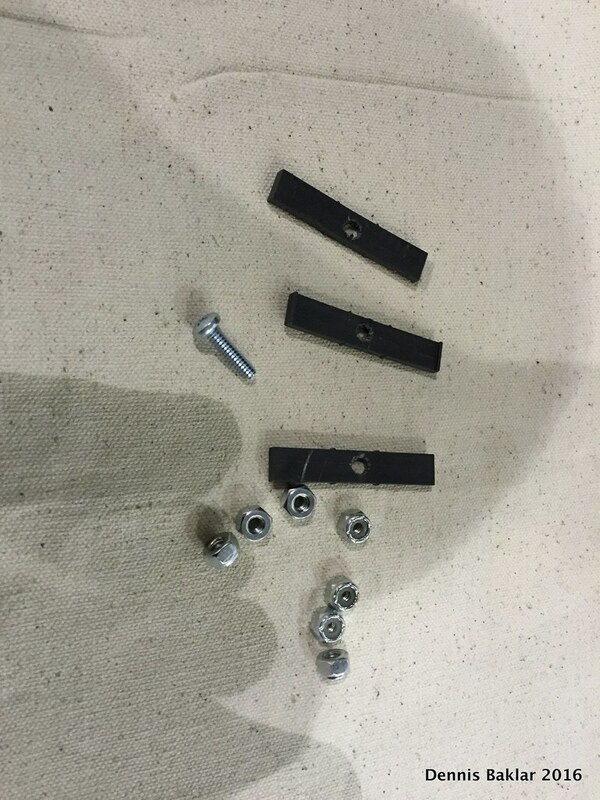 The clips are of various sizes. 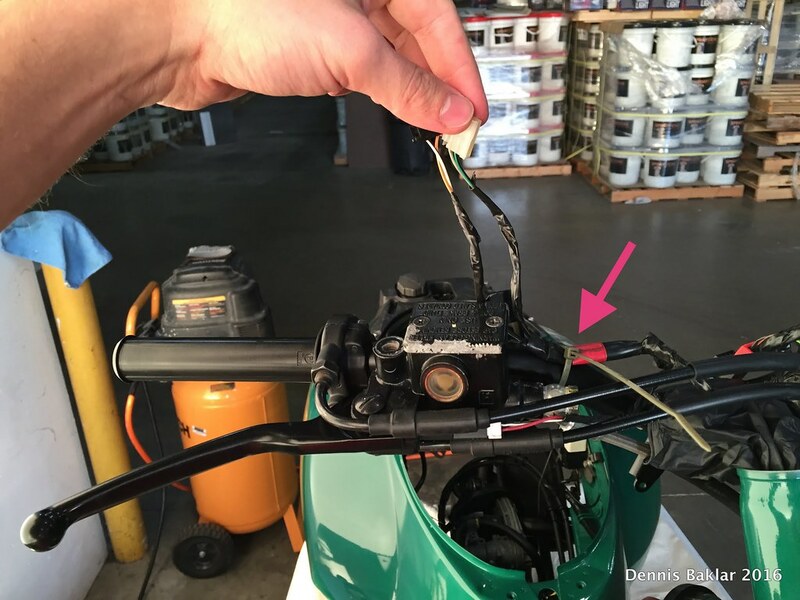 If unsure which one goes where, check a parts diagram on ScooterWest.com. 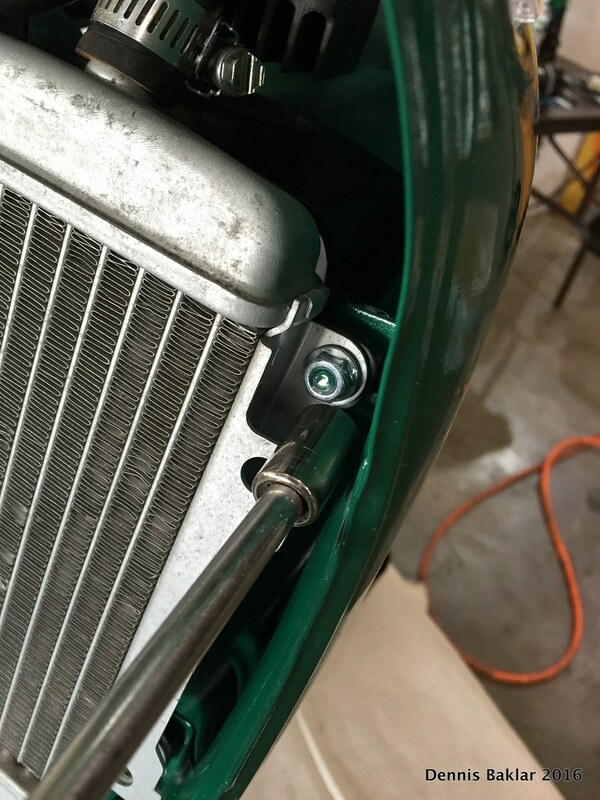 Radiator "gills" slide over the screw posts. 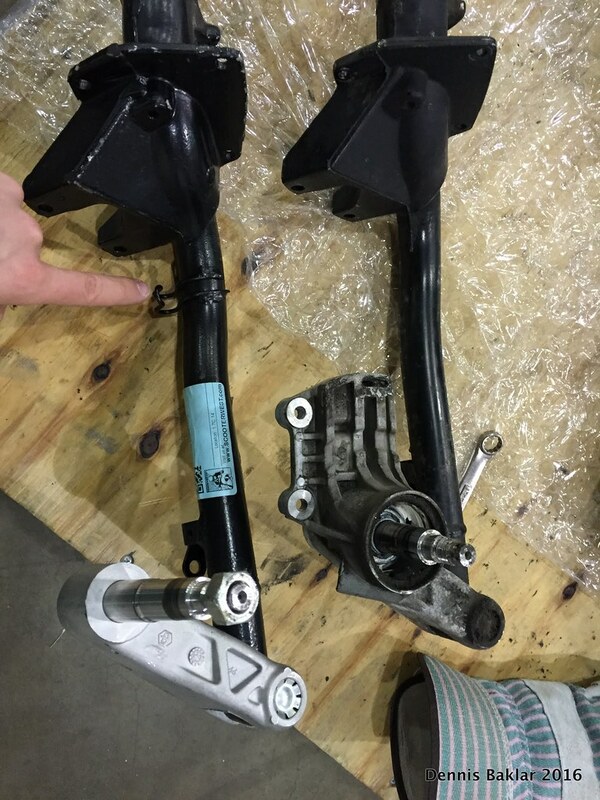 The right one has the ECU. I’m not screwing these down yet. Installing the cooling components. During disassembly, I took apart the cooling system in 2 parts, Left and Right to make it easier to assemble later. I’m pre-fitting the hoses but not tightening anything just yet. 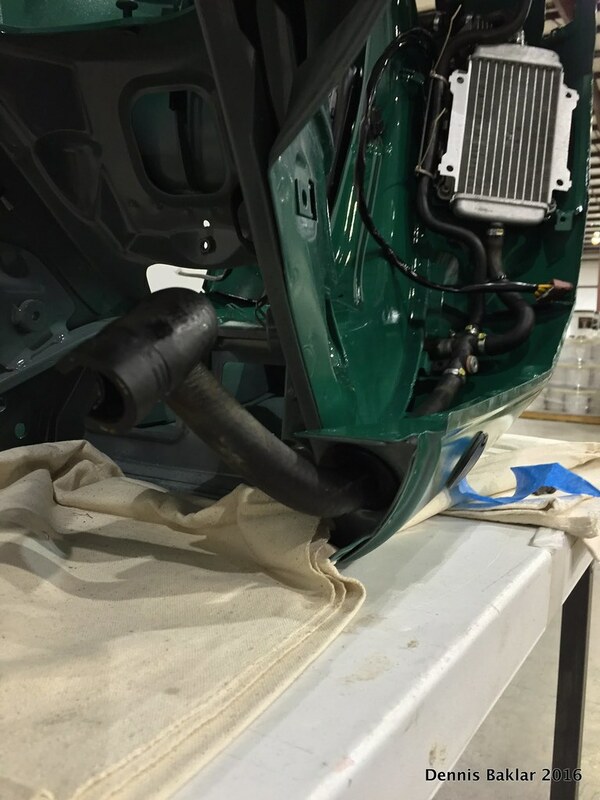 Radiators slide over the "gills". 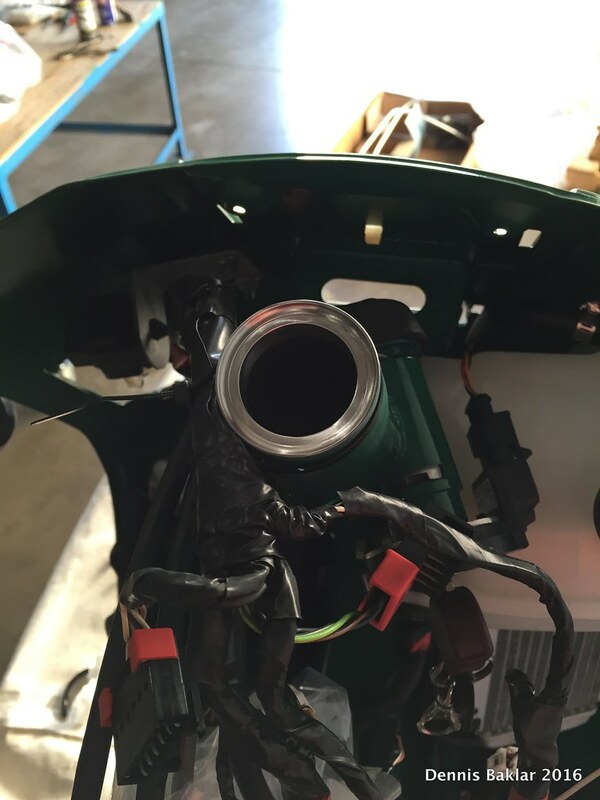 Connecting Right Hand and Left Hand side of cooling system at junction on bottom right. 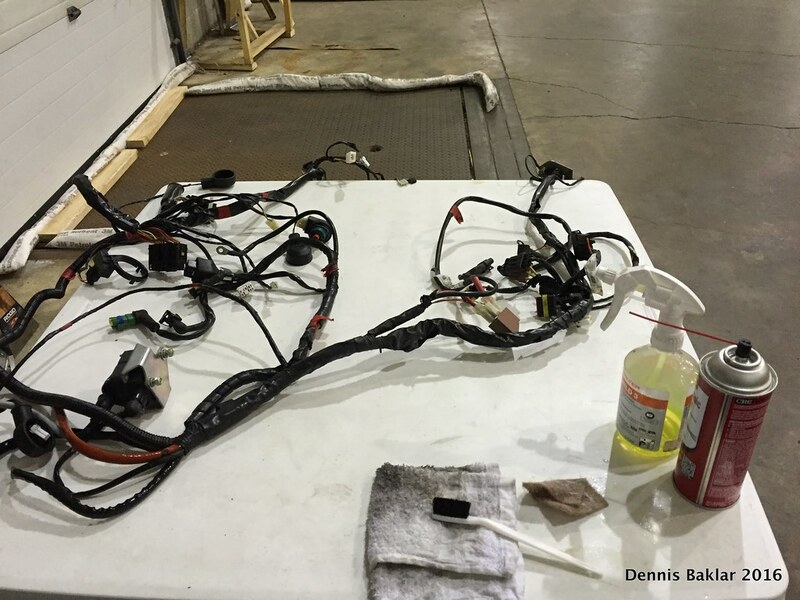 Soaking the protective rubber rings in hot water and sliding over the tail ends of the coolant hoses. Now, I’m tightening the radiators to the frame. Each radiator takes 3 nuts and 1 screw. 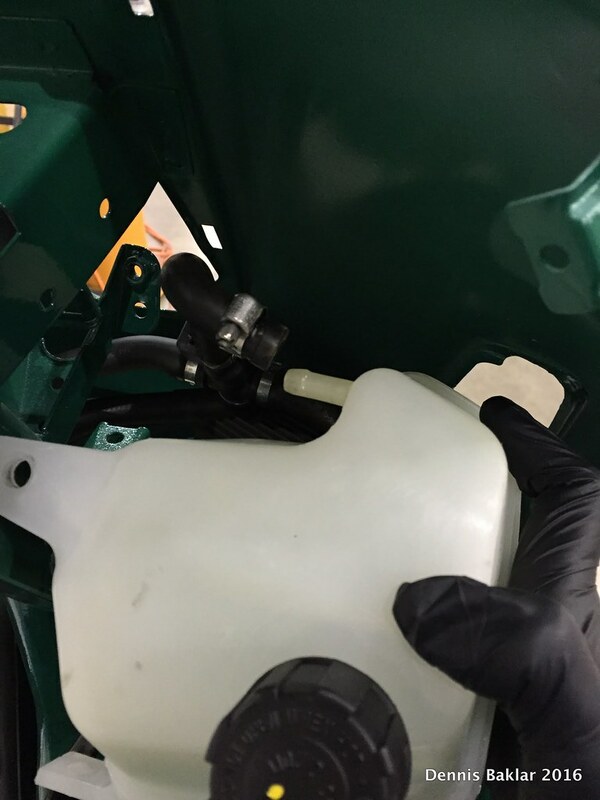 I put 2 zip-ties around the coolant tube to secure it to the plastic "gills." 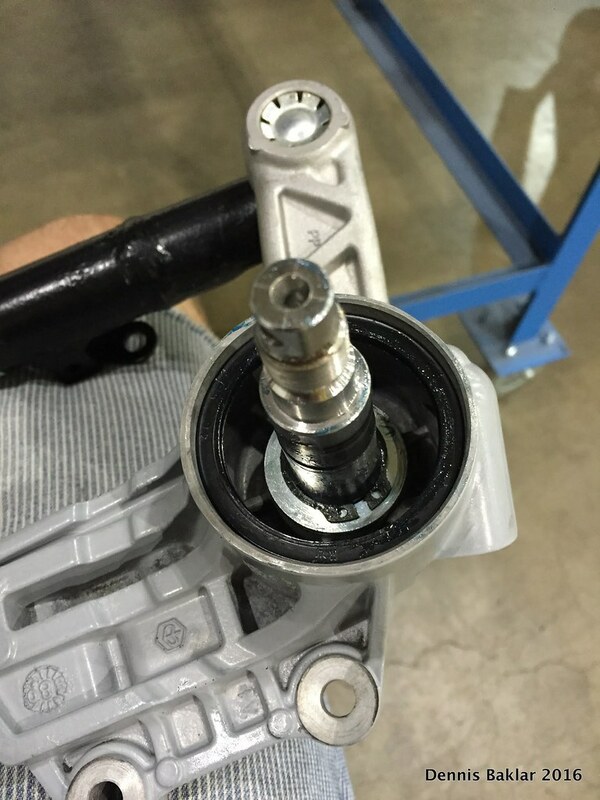 Seat release actuator attaches with 2 nuts. 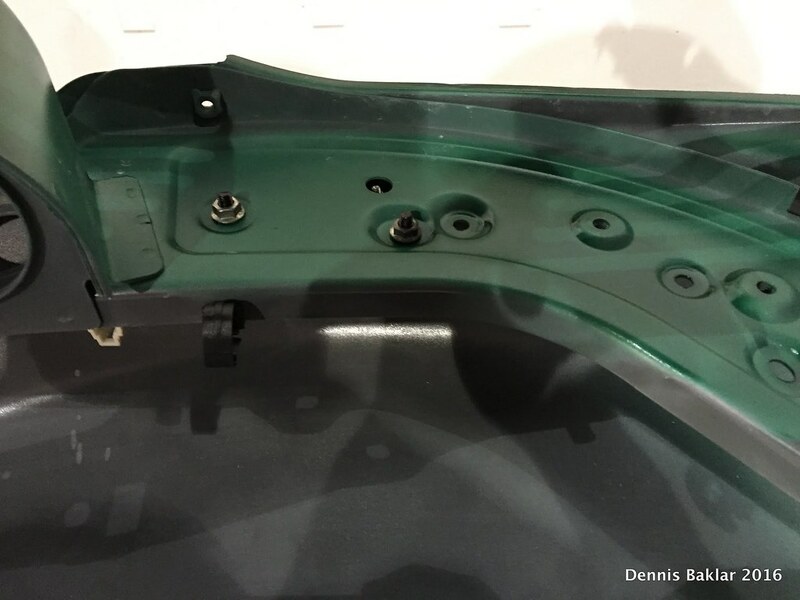 Underside view of seat release actuator. 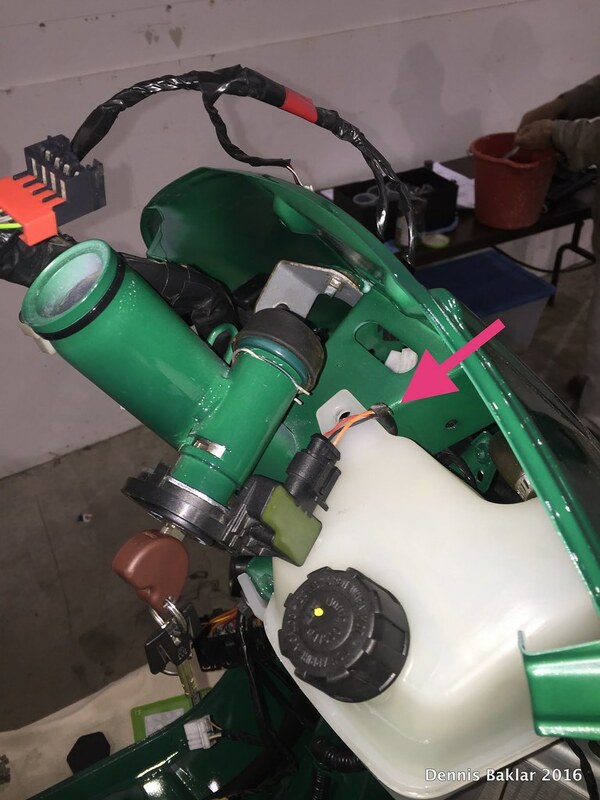 Cable from the actuator exits through a tiny opening at the top Left Hand side of frame. 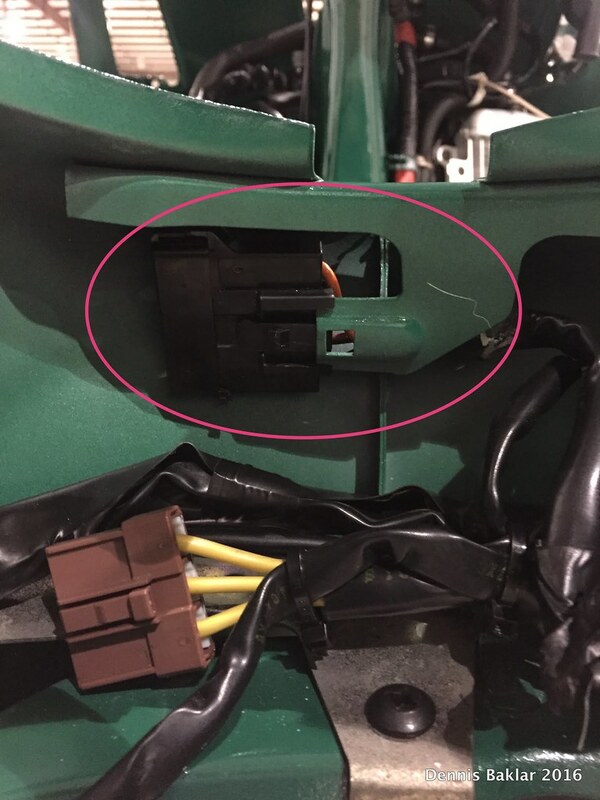 The other end of the seat release cable (for the manual mechanism in the glovebox) goes through the hole. 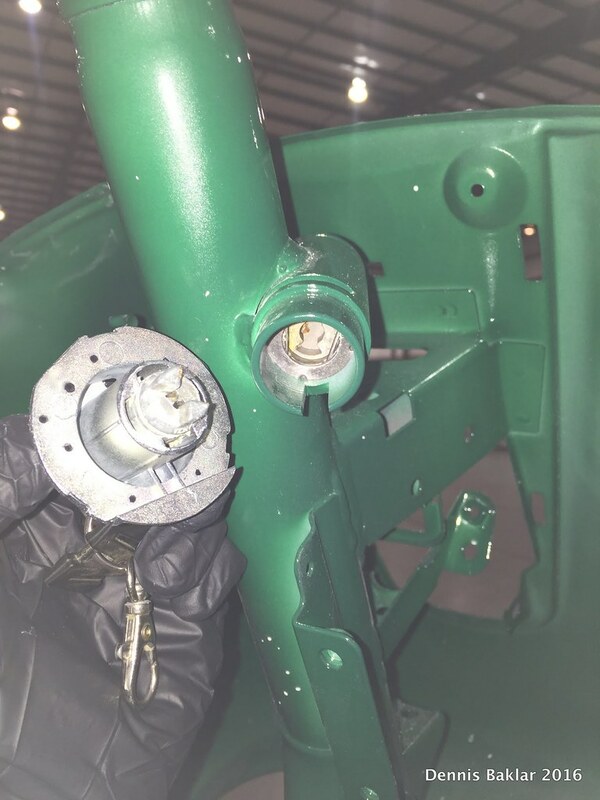 It’s a good idea to disassemble the swing arm and lube all the rotating parts with grease. 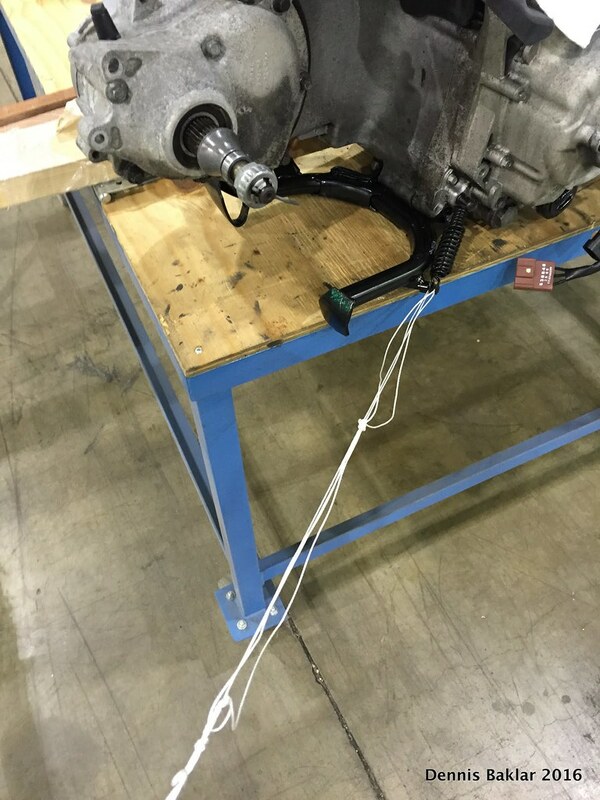 Time to connect the swing arm. It fits very snugly into the frame. 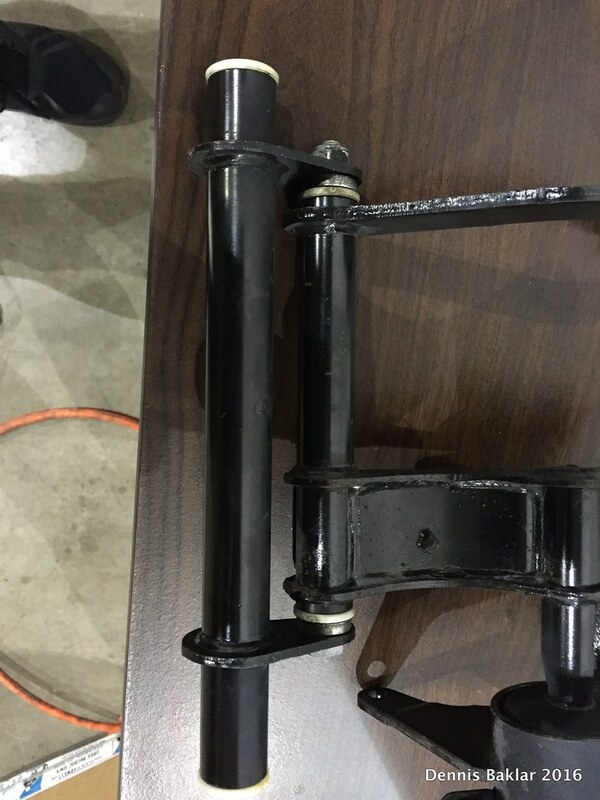 Putting the swing arm assembly into the frame like so, and securing with 2 bolts. 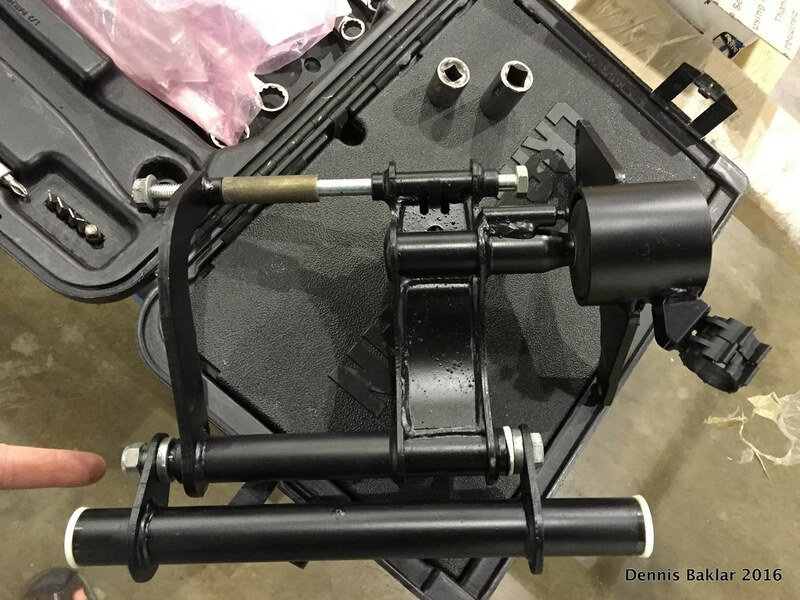 A long bolt enters the frame from the left, goes through the entire swing arm assembly as shown, and exits the frame on the right, where it gets a washer and a nut. 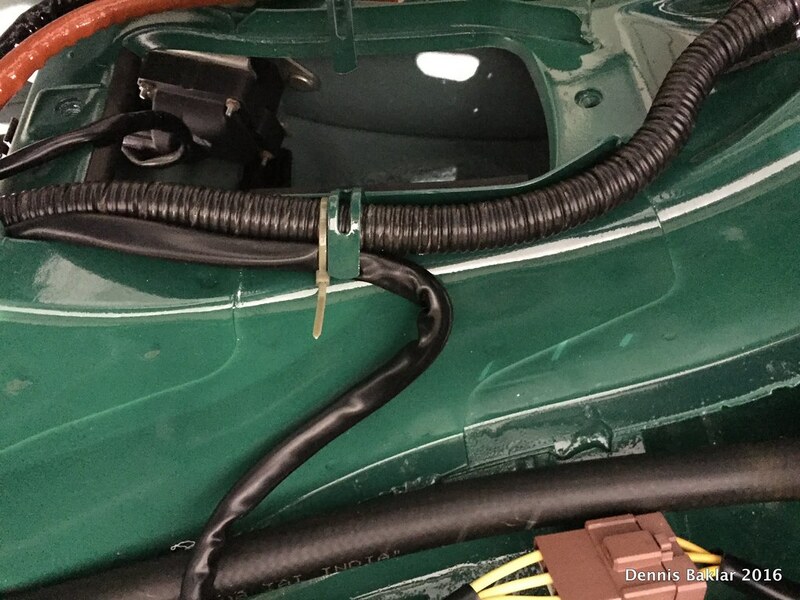 After 3 hours of scrubbing the wire harness with electrical cleaner and compressed air, it looks good as new. Skateboard delivery is essential to success. 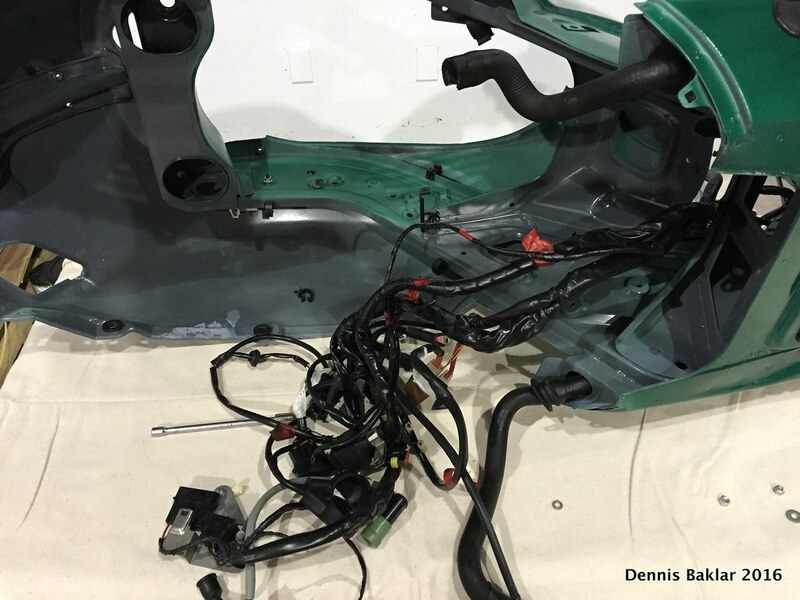 The wire harness feeds in from the front only. Trust me. I tried it both ways. 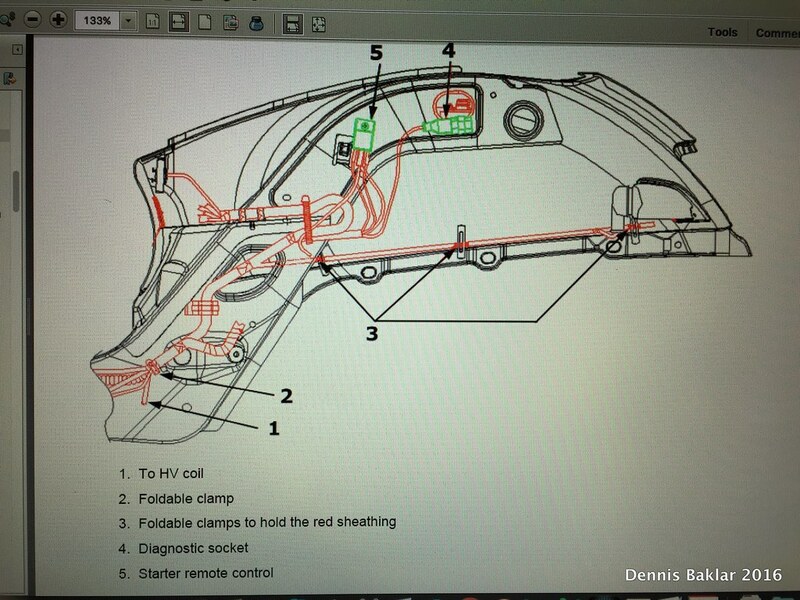 The proper position is once the red and black battery terminals are located as shown and the HV coil (in my hand) is over the battery compartment. 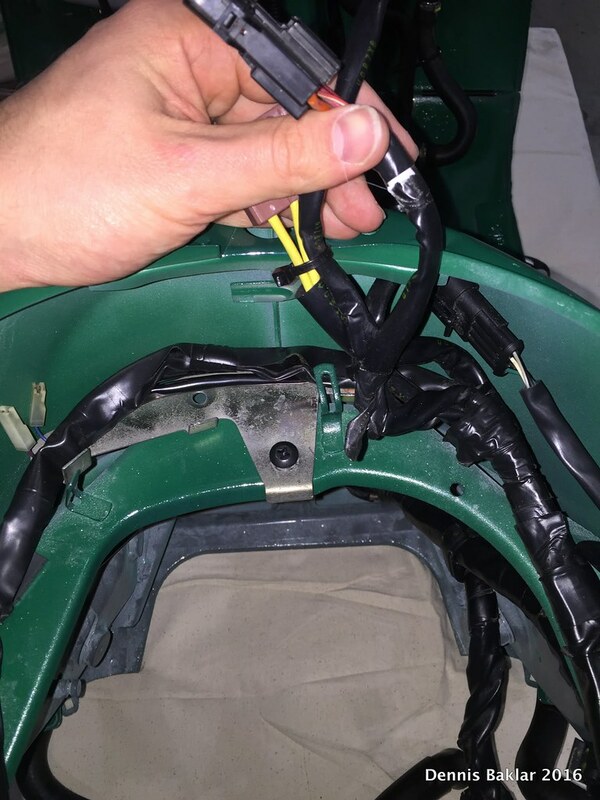 Securing the HV coil to the Left Hand side with 2 nuts. 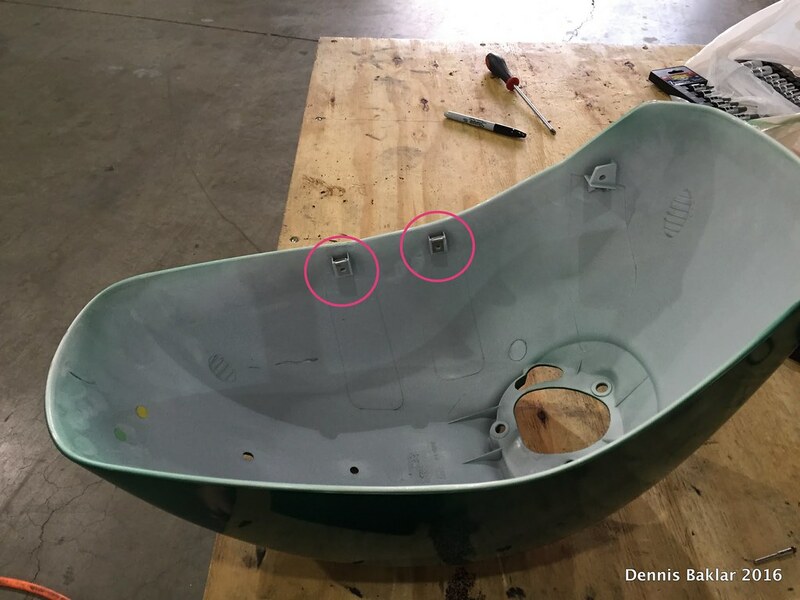 There are 3 places on the frame that have rectangular plastic tabs to which the wire harness is secured with electrical tape. These are the most random things ever and all 3 used to have a single tab (where the hole is now). 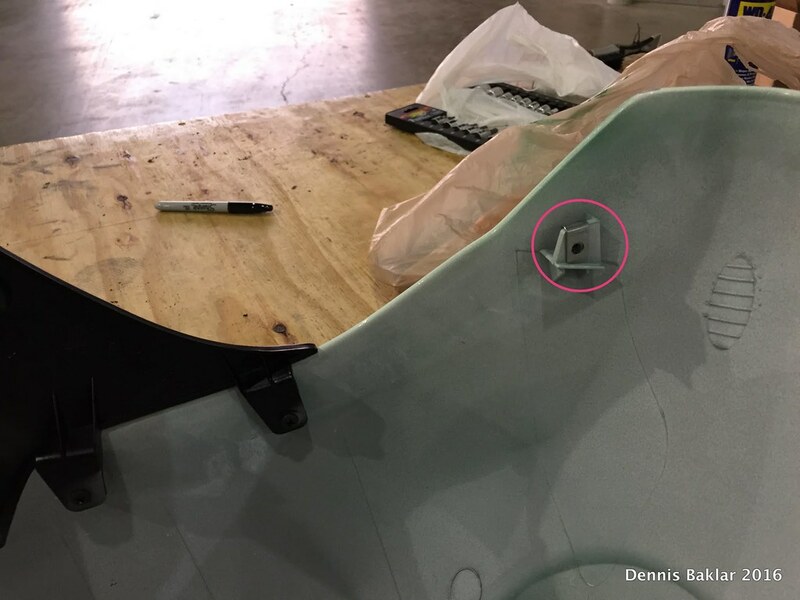 The tabs snap into holes in the frame. But during disassembly all 3 tabs broke off for me. 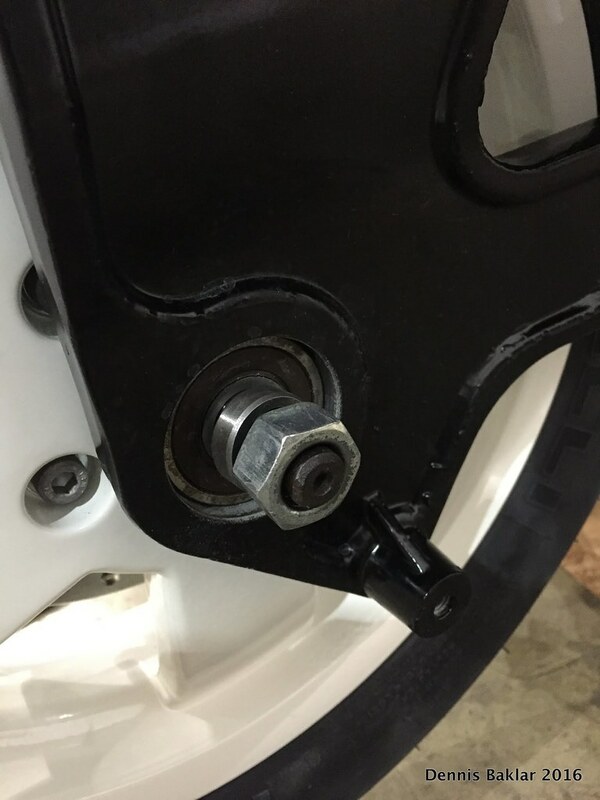 These parts are not readily available; so I improvised…I cut the remaining piece of tab off to get a flat surface, drilled a hole in the center, and secured to frame with bolts and lock-nuts. 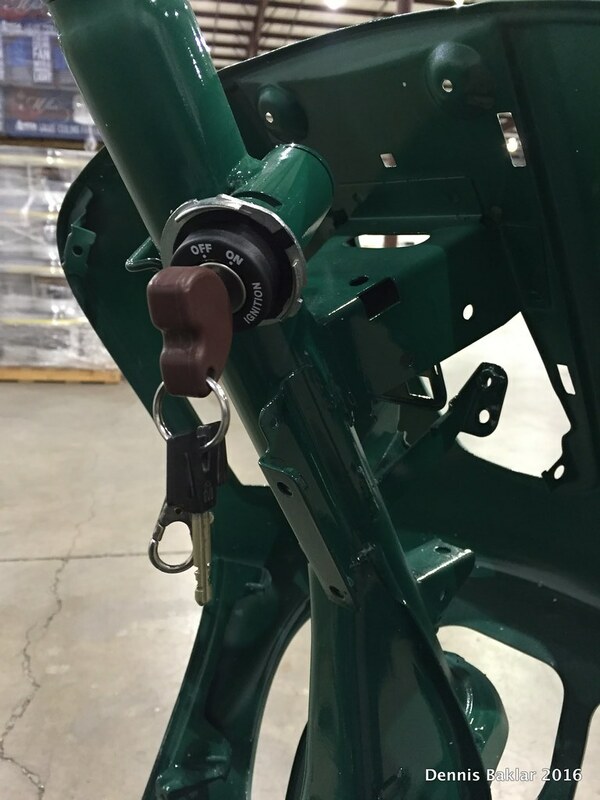 There just happens to be enough space in all 3 locations to get the lock nuts in place. Here is one of the locations. 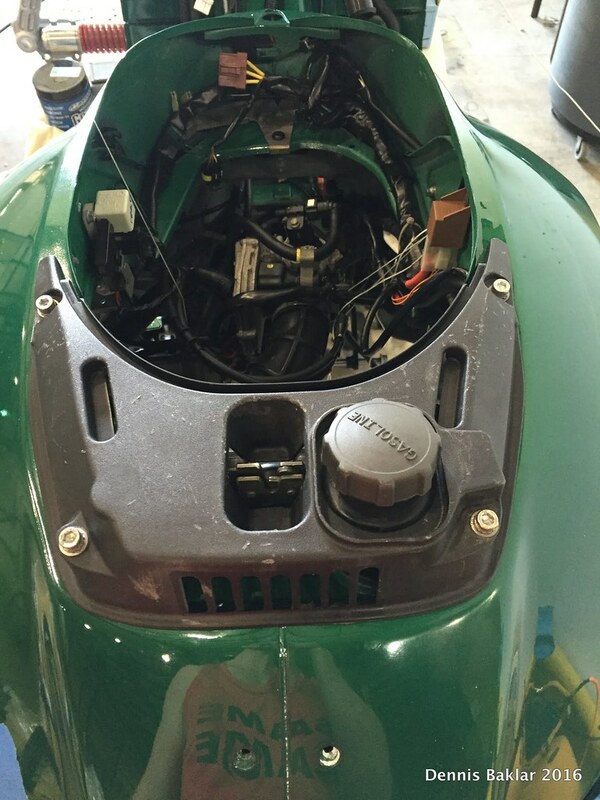 The other 2 are at the Right Hand and Left Hand side of the engine bay towards the front. You'll see them later. BTW, this is what the wire setup looks like at this point. 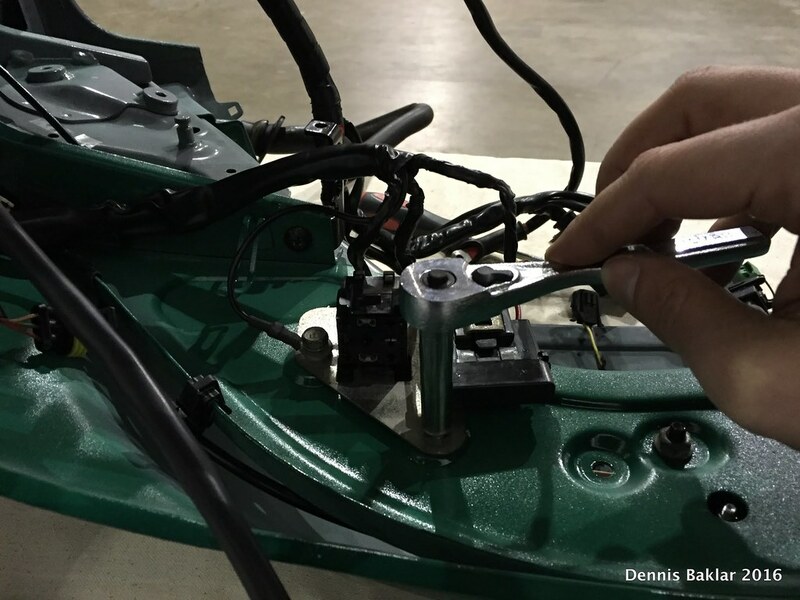 Folding over the metal tab to secure the main harness cable to the frame. 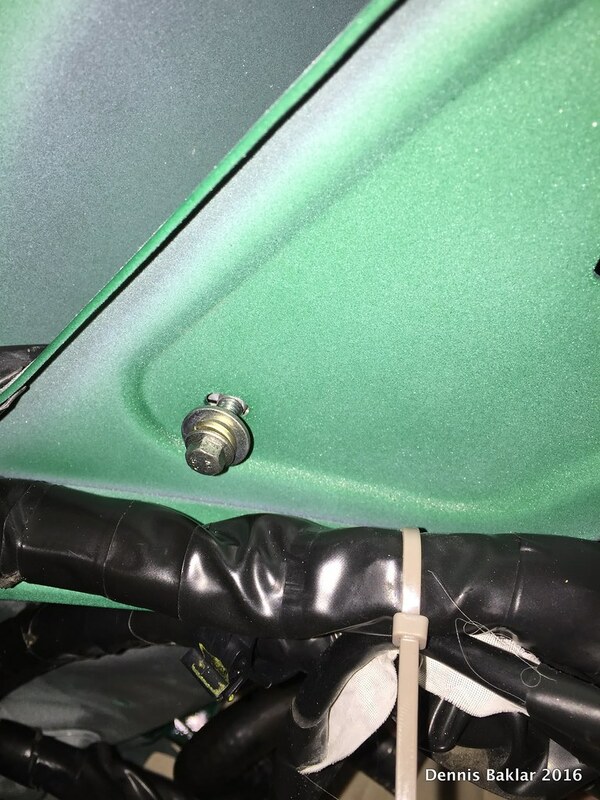 I routed the harness upwards and secured in 2 more locations. 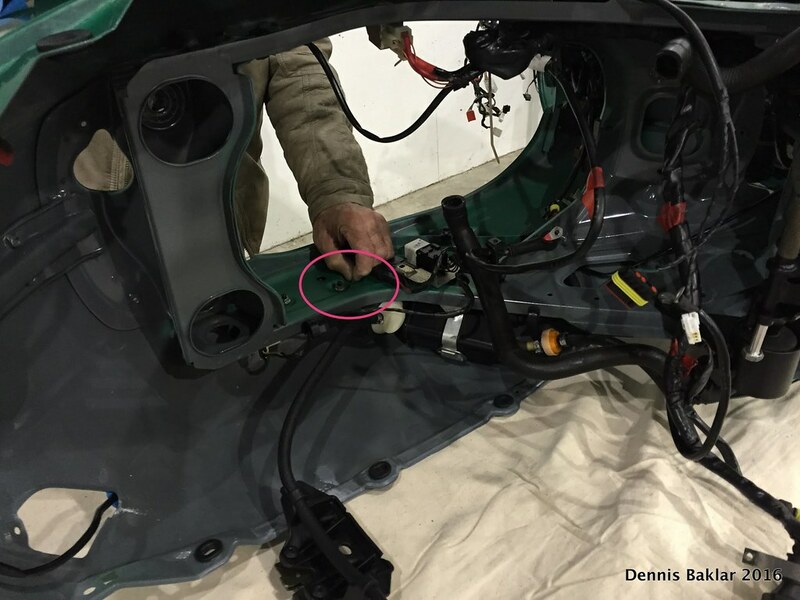 There is be a red band of tape on the harness next to the upper clamp location. 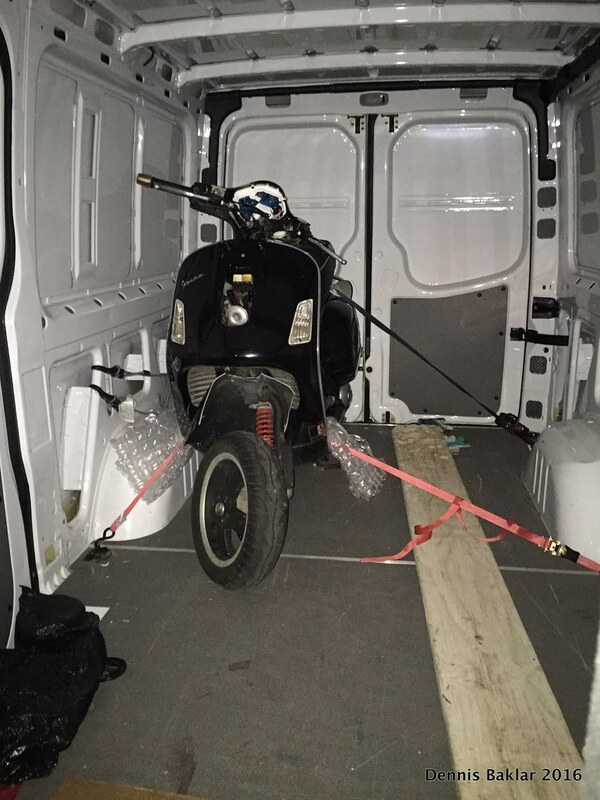 Thanks Piaggio! 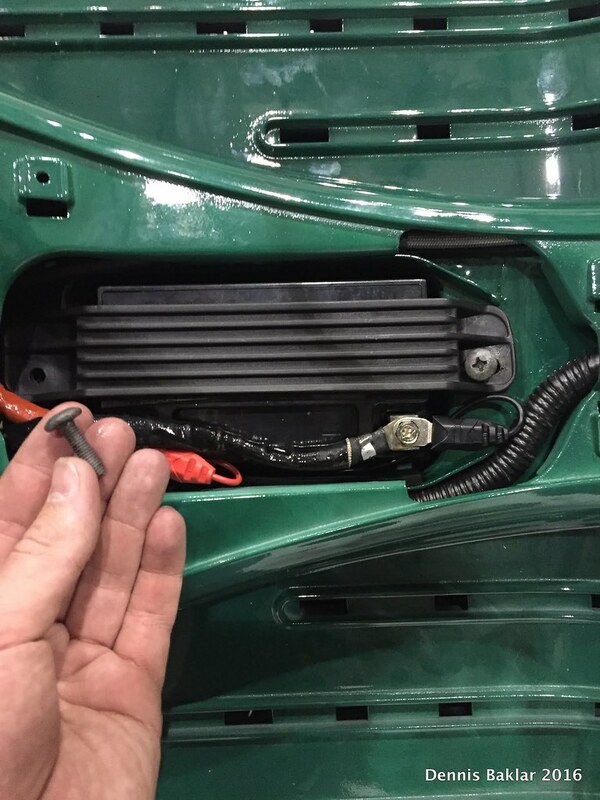 Connecting the turn signal module with 2 nuts. 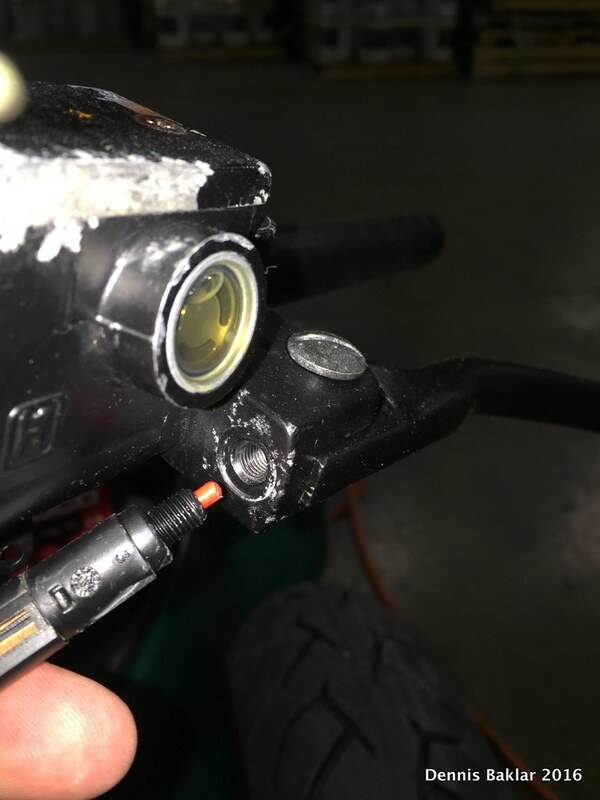 Snaping the relay holders onto the frame and pulling out the horn connectors (Black and Yellow). 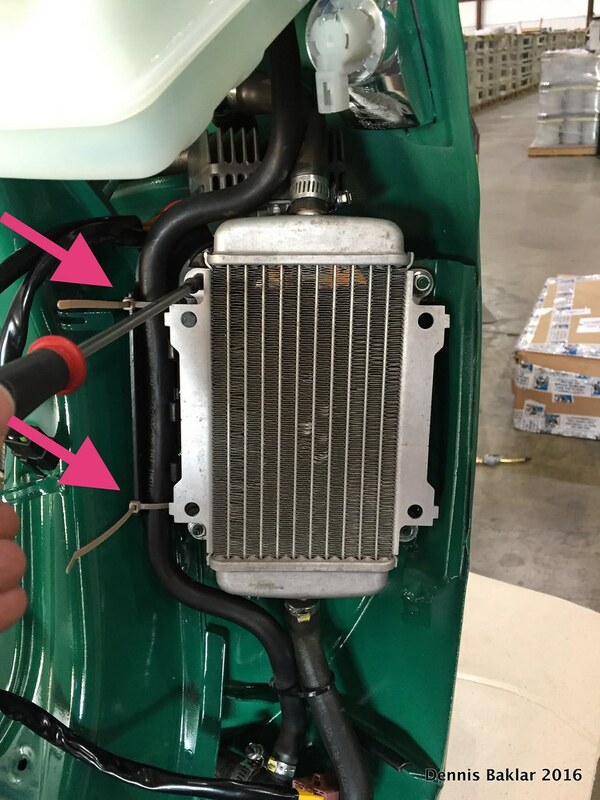 Pulling the connector from the Right Hand radiator "gill" and connecting it to the matching one from the wire harness. 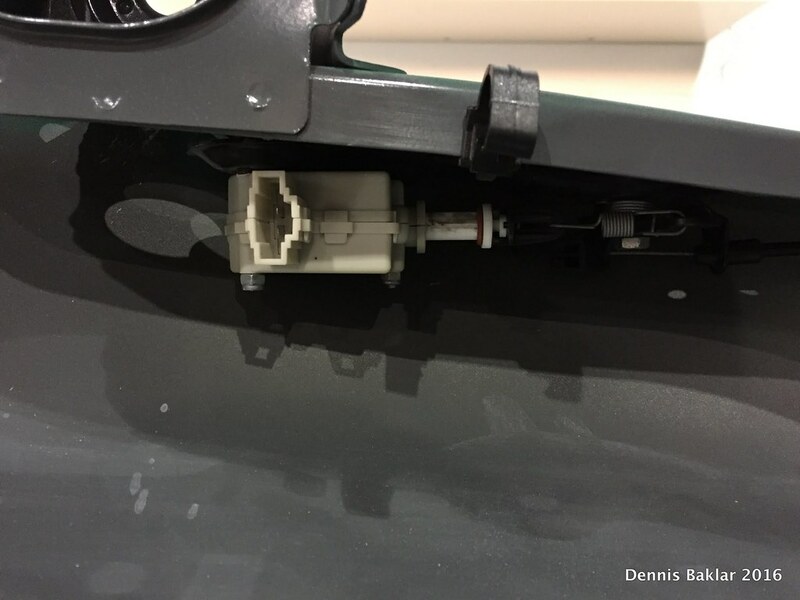 The zip-tie will keep the thinner cable from sliding away. I gotta keep it professional! 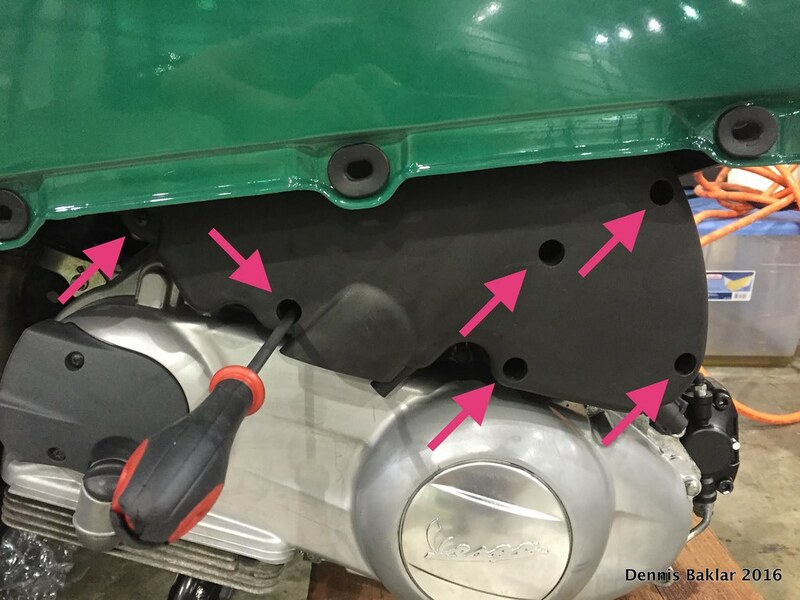 These diagrams in the Vespa workshop manual are immensely useful. 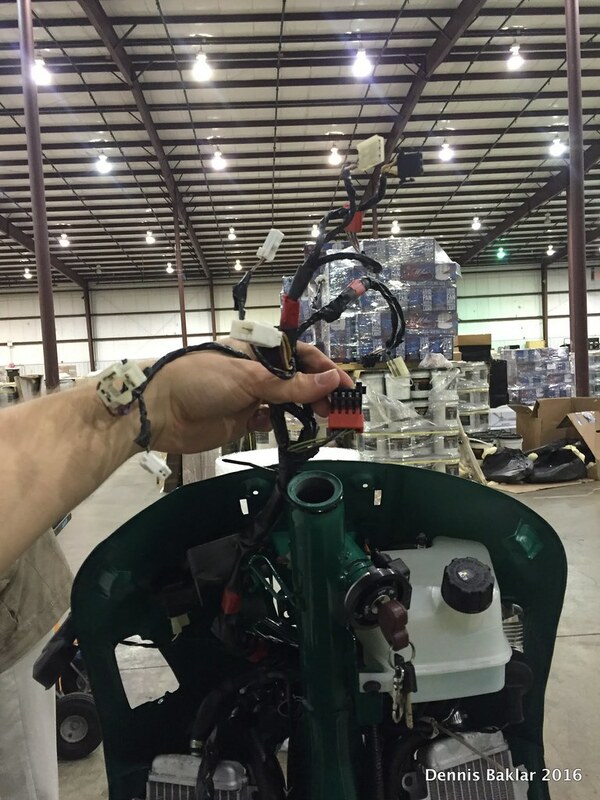 I consulted them thoroughly when routing the wire harness and got it right on the first try. 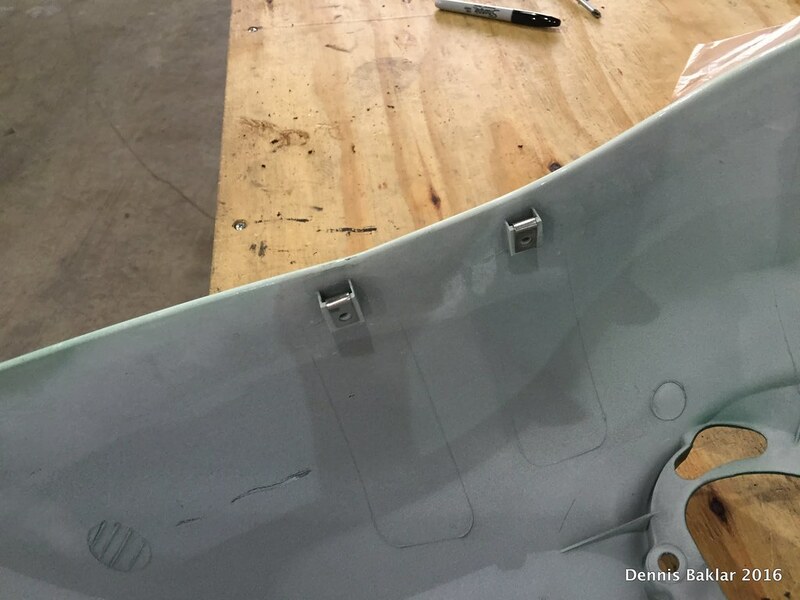 Tightening the metal plate holding several connectors to the frame. 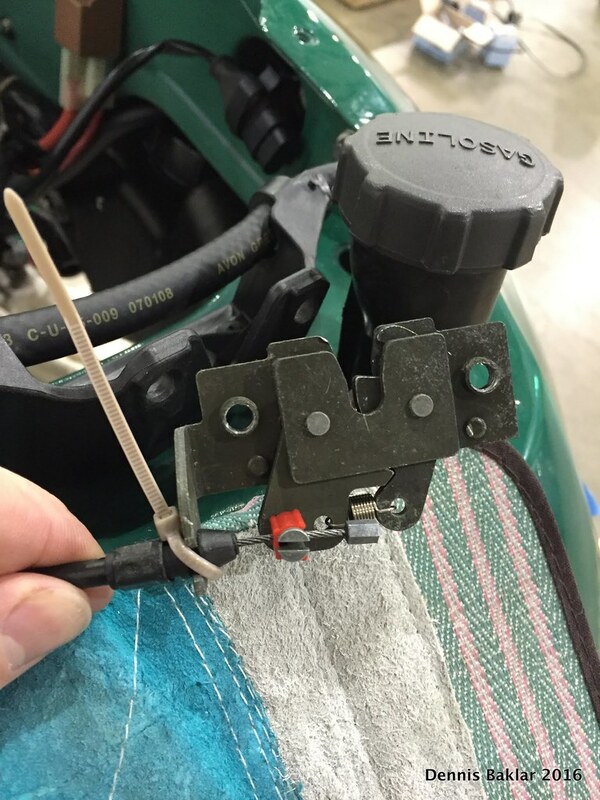 Once everything was properly routed at the front, I put a zip-tie to keep the turn signal wire in place. 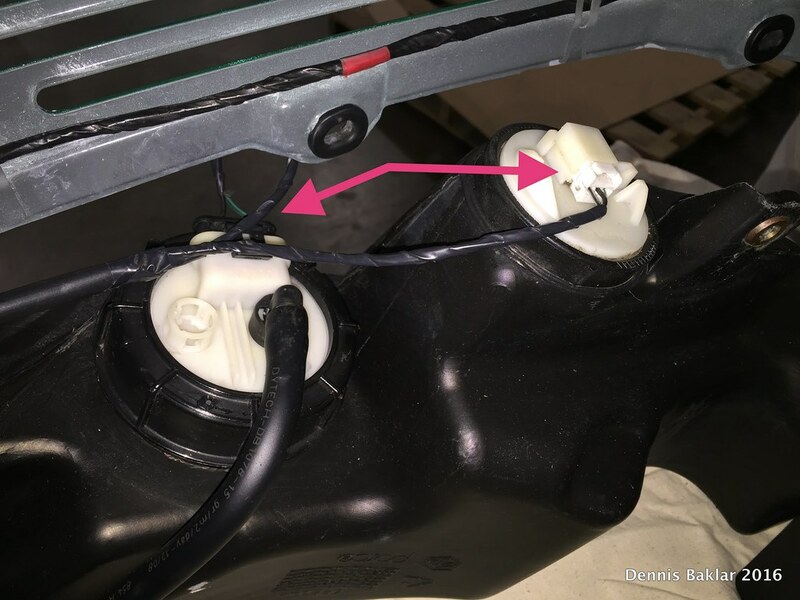 I ran my zip-tie through a small length of heat shrink tubing in order to prevent the wires from chaffing against the rather sharp plastic edge of the zip-tie. 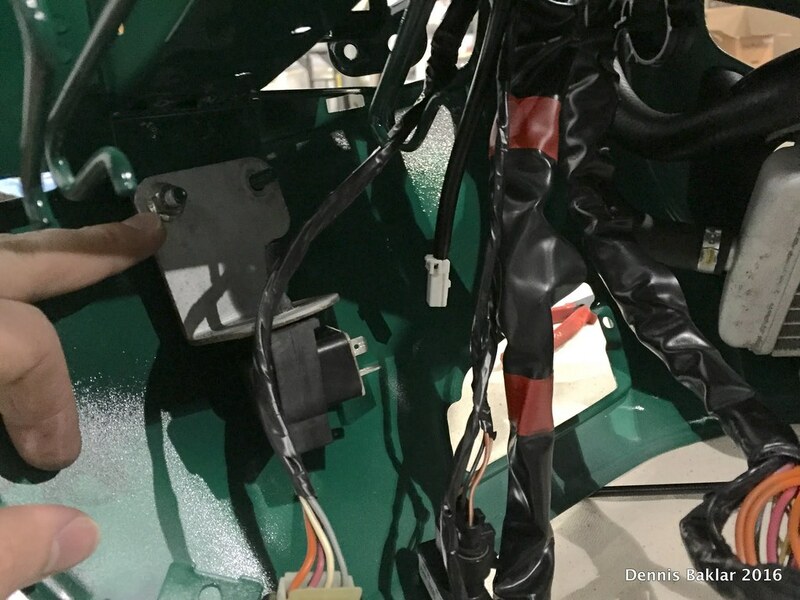 Routing the ignition antenna from under the coolant tank and snapping it onto the lock. Check dis! 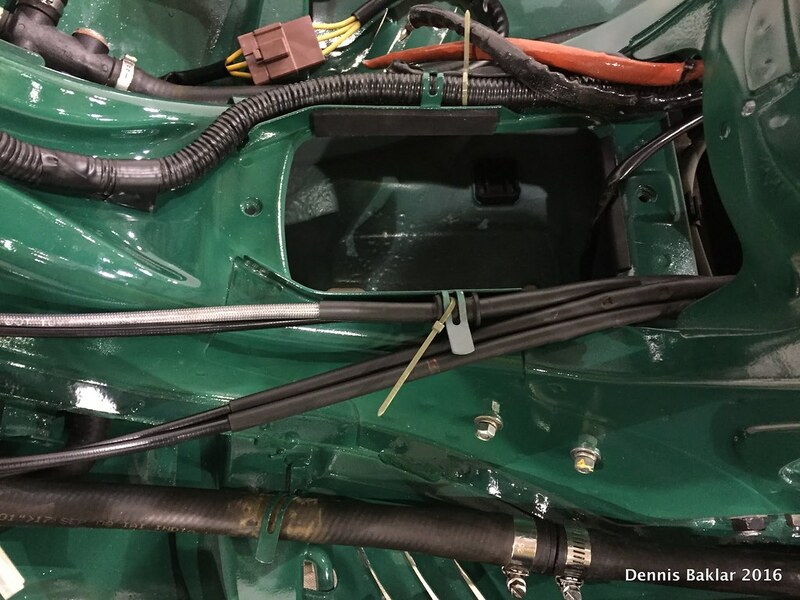 The wire harness comes up the central post and the bulk of it threads under the steering tube and exist on the left side. Only the several connections we made earlier stay on the right. 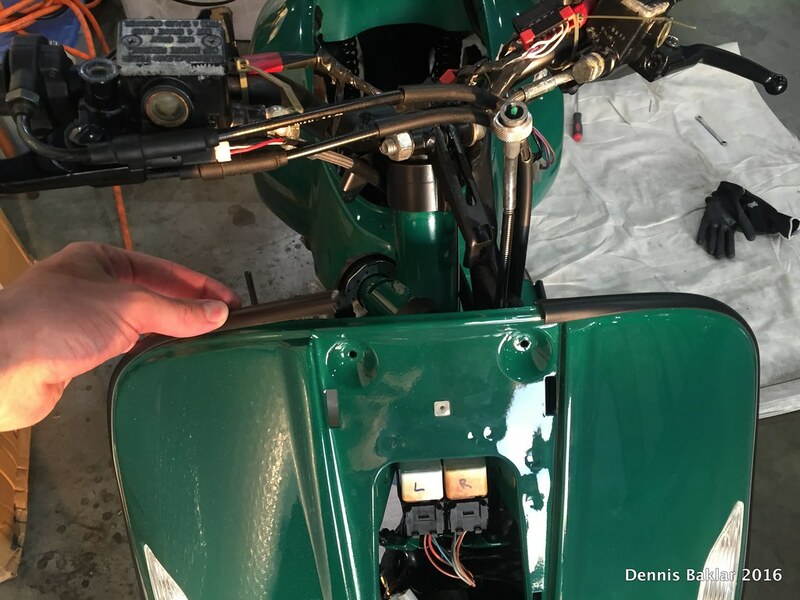 Connections that will later go to the handlebars and instrument panel come straight up. 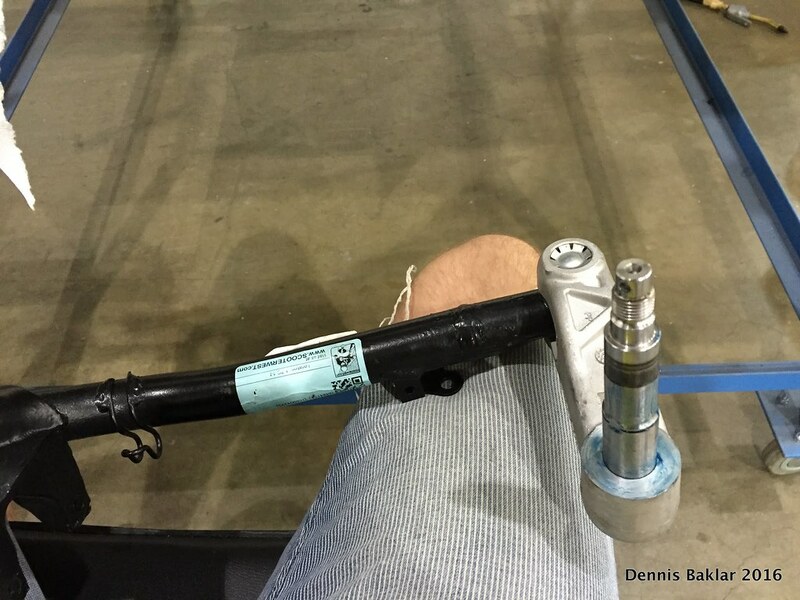 I secured them to the steering tube with a zip-tie, temporarily. Their time will come. 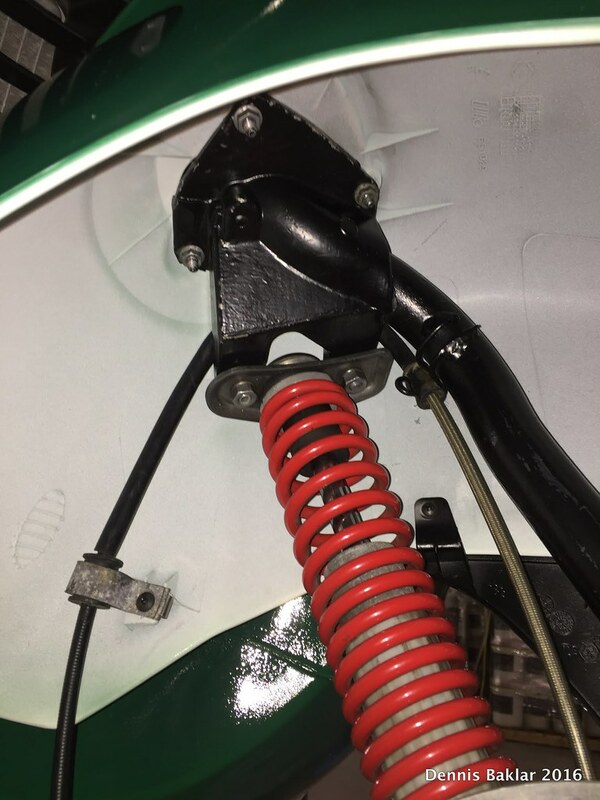 From the plate we bolted on earlier, a single wire clips onto the Left Hand side of the frame and then plugs into the seat release actuator. 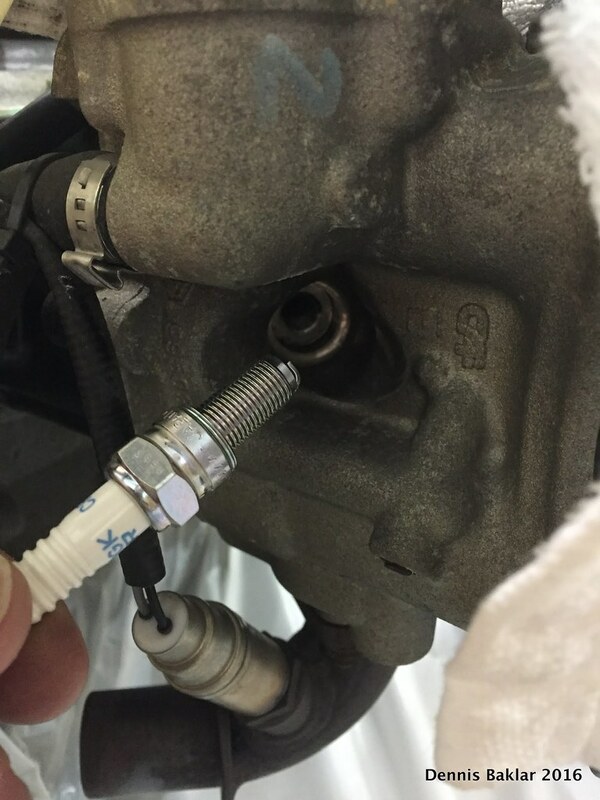 The wire harness comes up from the Right Hand side of the engine bay and these connectors end up right near the center bracket (silvery metal part) and will later connect to wires from the engine. 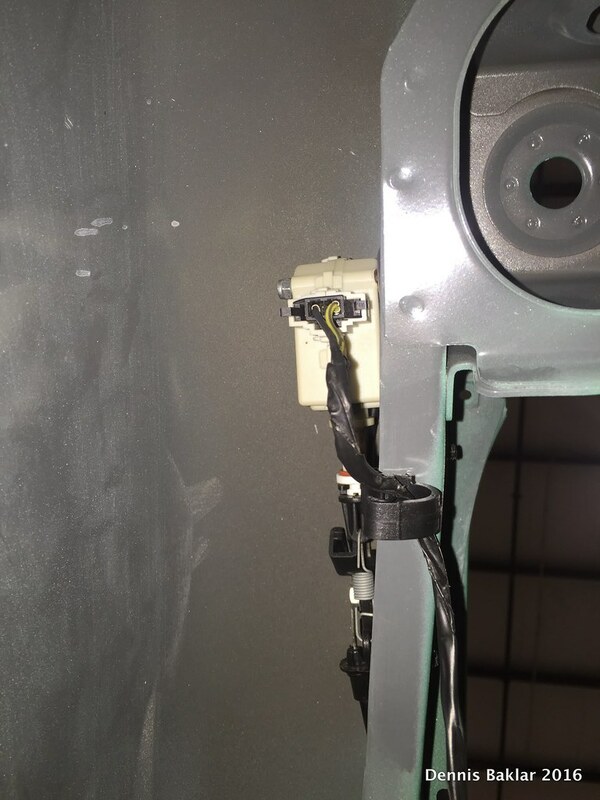 Snap in the black fuse holder over the metal post of the frame. 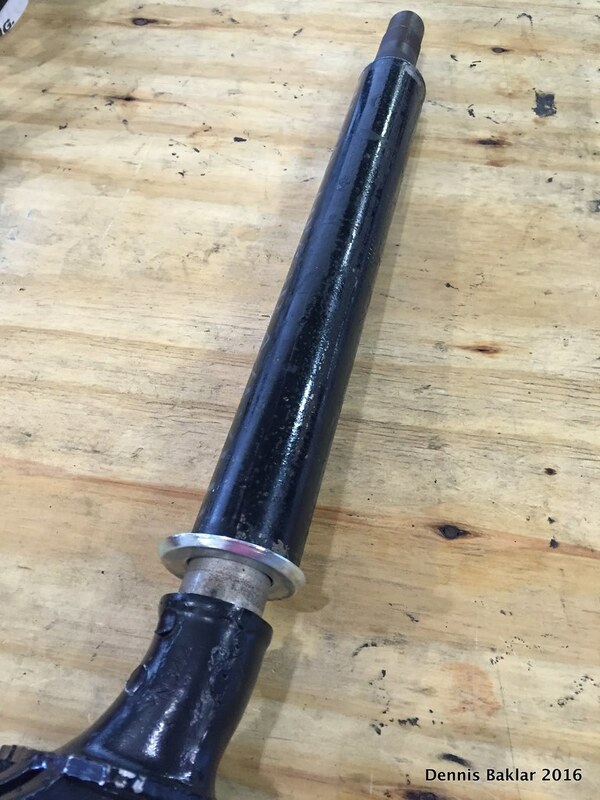 I kept this part of the fuel system in one piece when disassembling. I figured it would be simpler to install it as one piece instead of struggling with each individual section. I slid the catalytic canister under the fame. 2 screw posts protrude through holes where my Grandpa's hand is. Thanks for the help Grandpa! 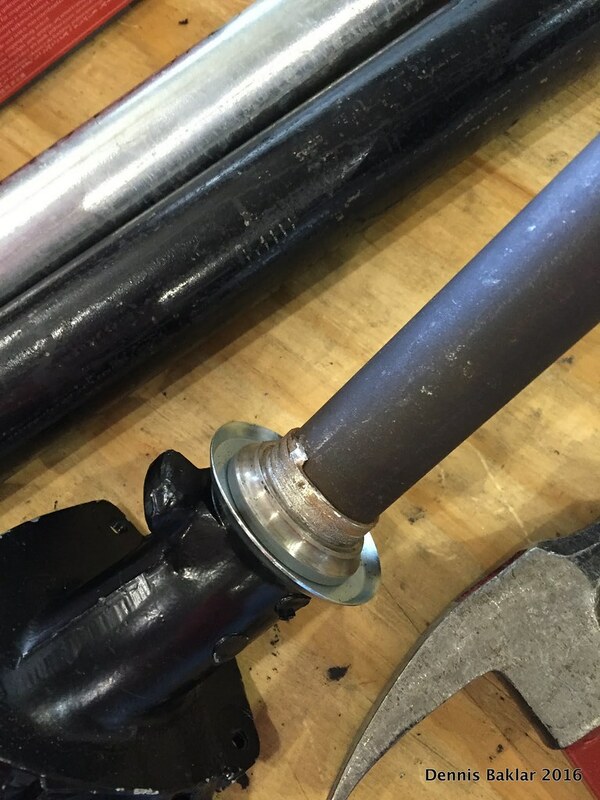 I put nuts over the 2 screw posts and tightened them down. 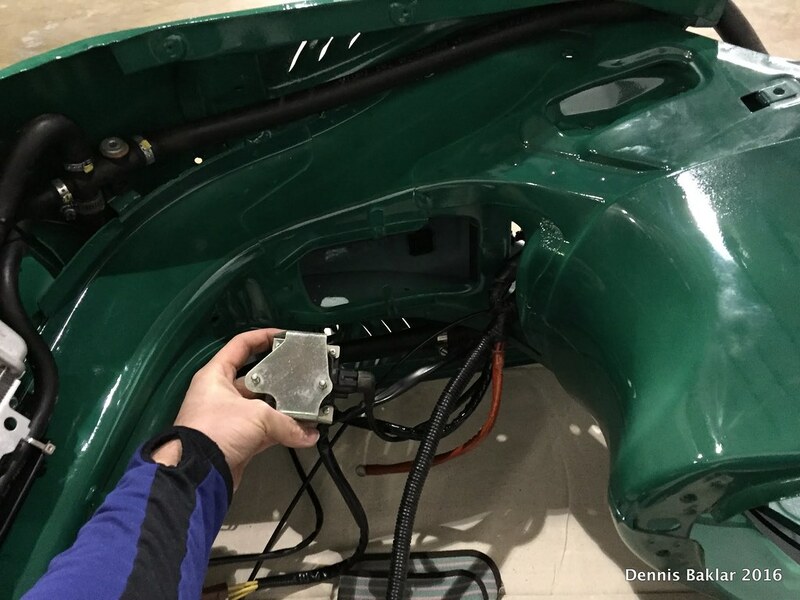 Positioning the fuel tank right under the frame where it belongs. 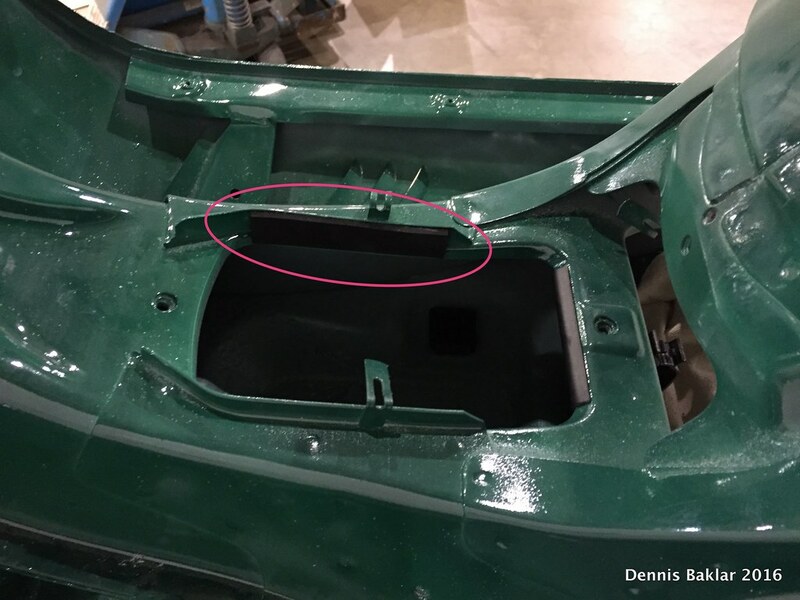 I had to remove the fuel cap, otherwise the tank neck wouldn’t pass through the hole in the frame. 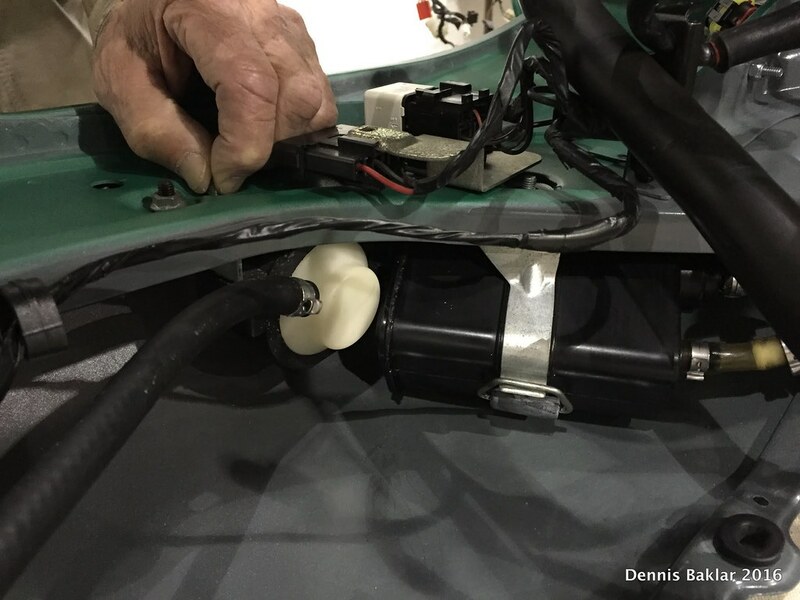 Connecting the 2 fuel tank wires from the wire harness as shown. I then raised the fuel tank into position and secured it with 3 bolts. The longest one is on the back, under the rear light. 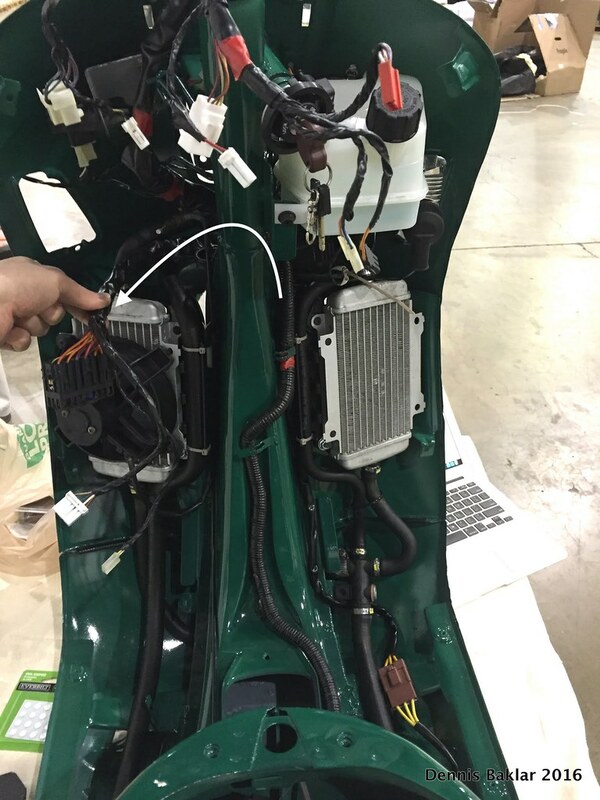 This is the 2nd one (on the right side of the engine bay), while the 3rd one is a bit further back. 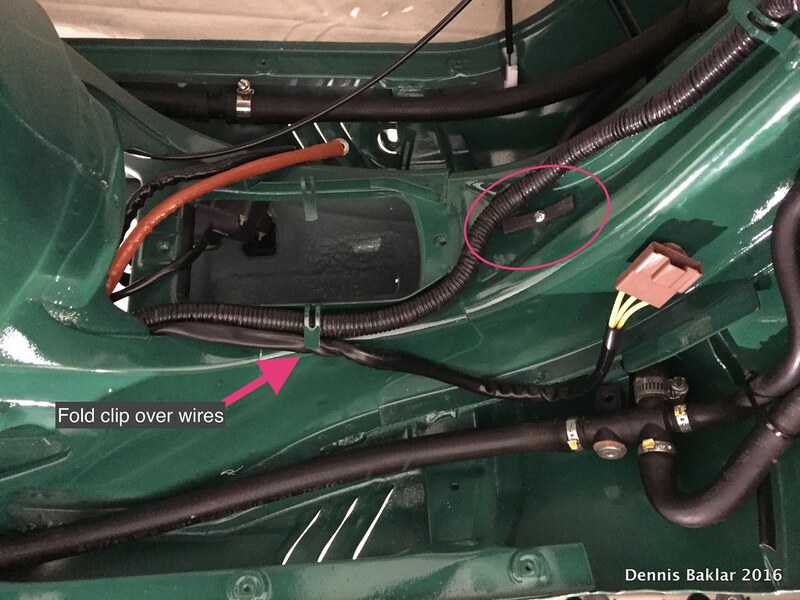 Now I put the fuel cap back on and began connecting the seat release cable to the mechanism as shown. 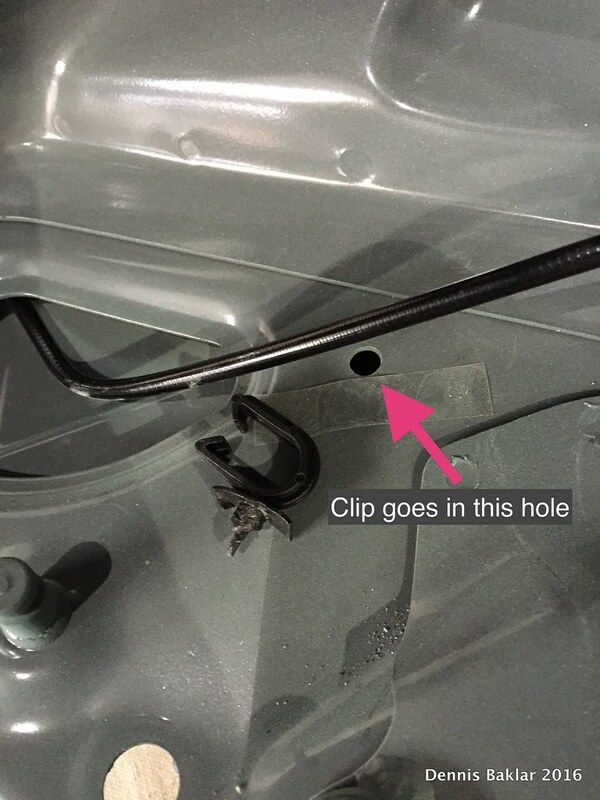 The zip-tie will make sure it doesn't pop out. 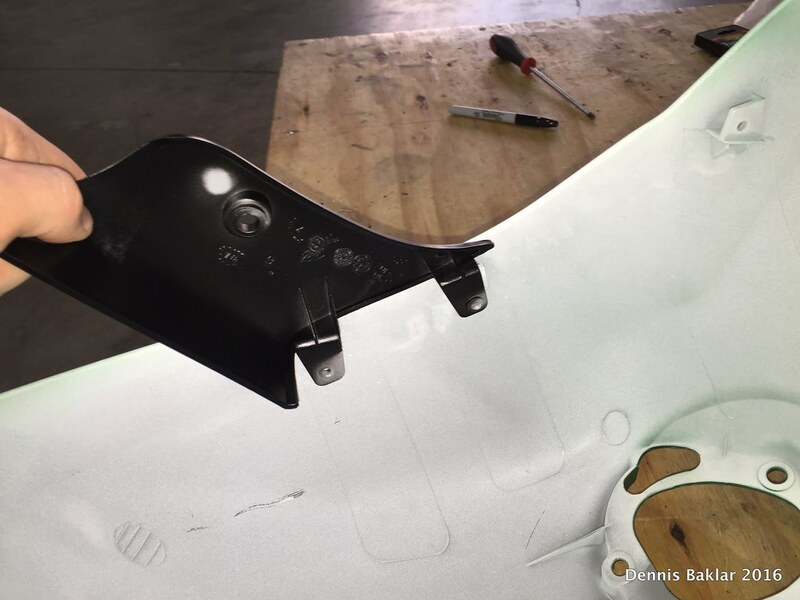 Attaching the seat release mechanism to the bracket with 2 step-bolts. 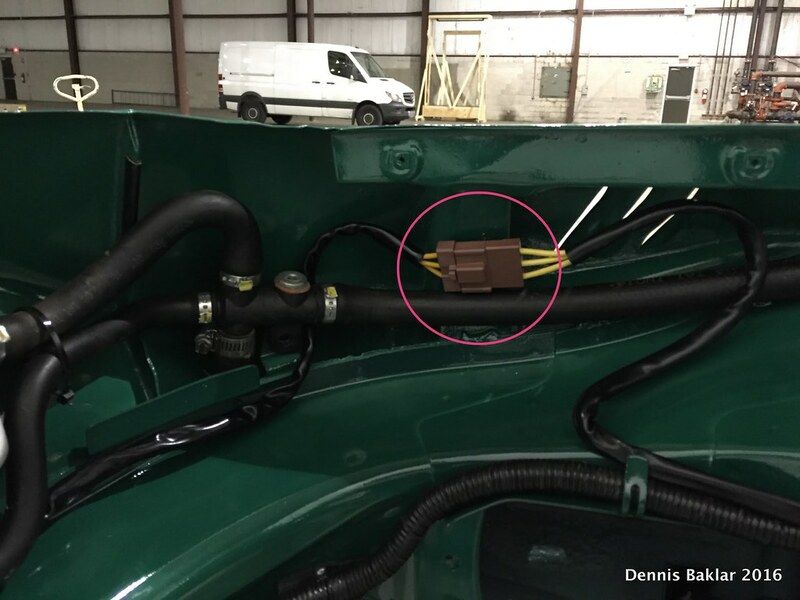 Once things have fallen into place, I taped down the wire harness to the 3 plastic tabs we installed earlier using electrical tape. 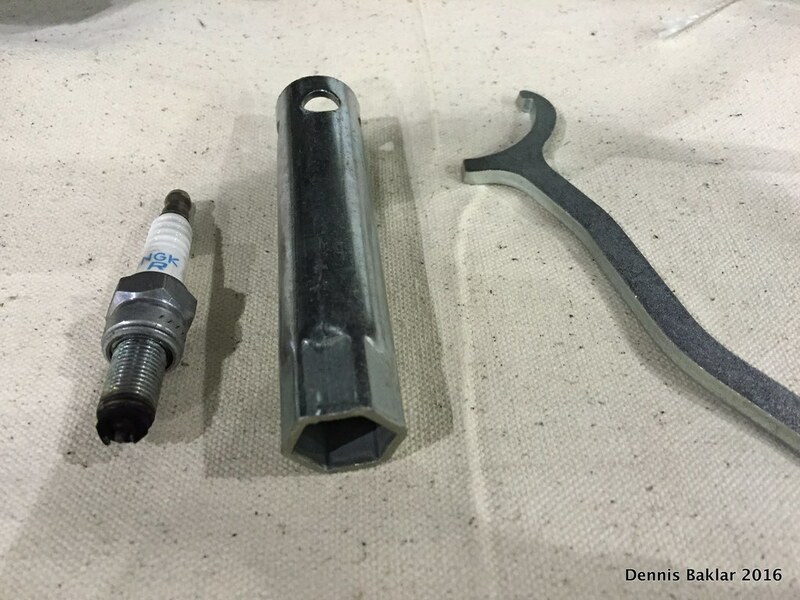 The wrench fits into the spark plug socket (also in tool roll) and operates like a ratchet (minus the ratcheting part). 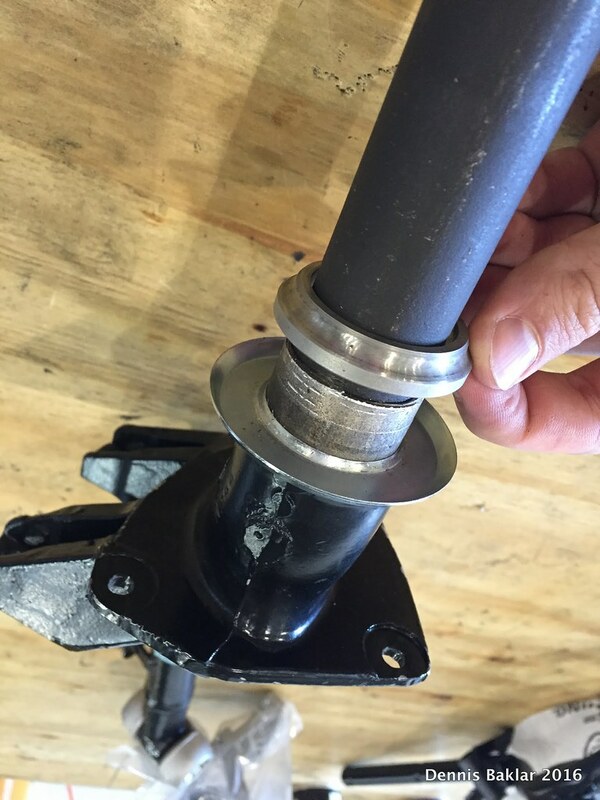 I removed my center stand to have it powder coated, but getting it back on was darn hard. 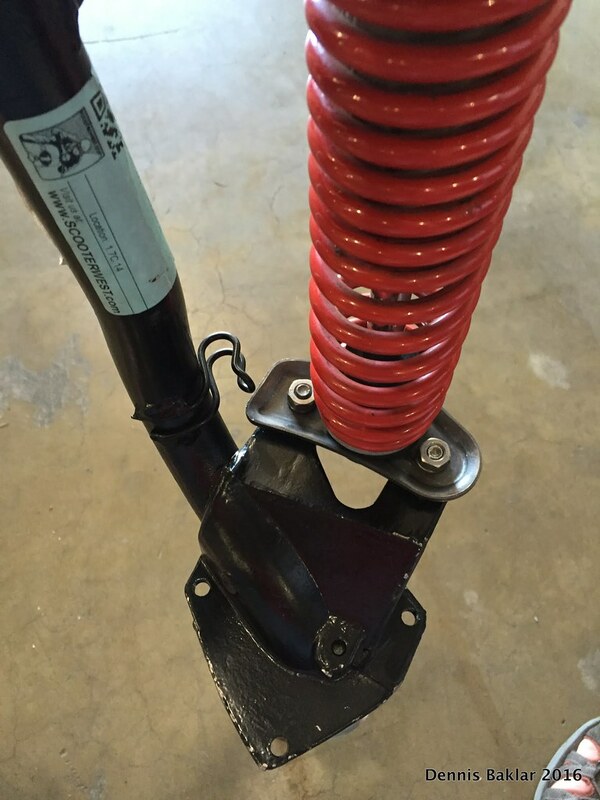 The springs are so short and stiff. 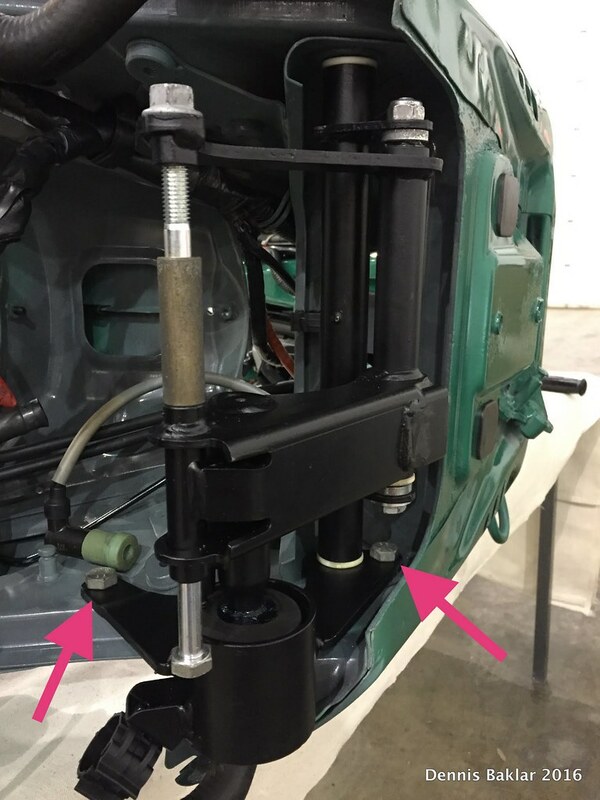 The narrow spring fits inside the wide spring and both springs need to be attached for the center stand to retract properly. 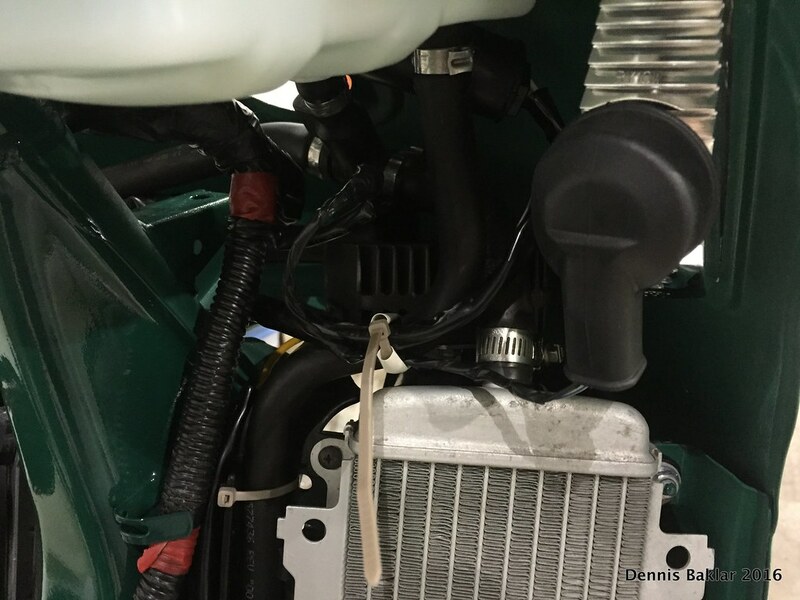 Zoom into the picture and see that I first attached the springs at the engine. 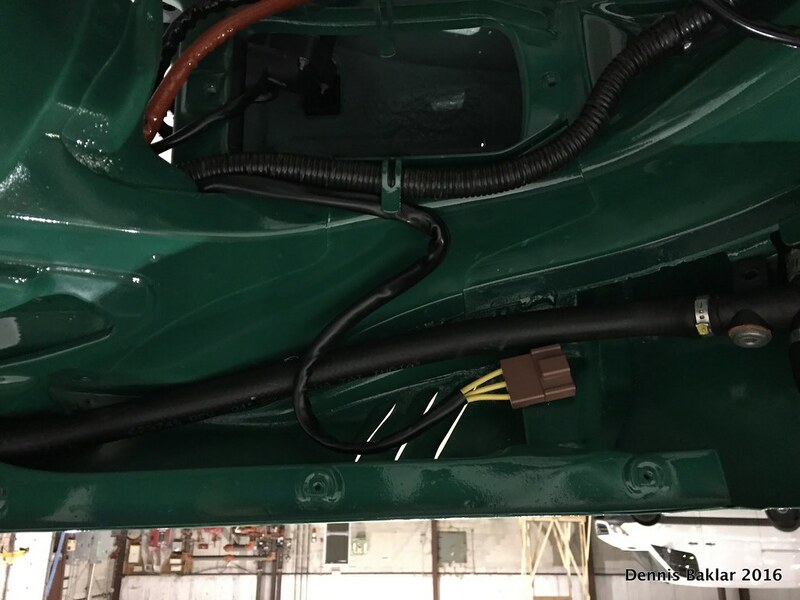 I then used a strong rope to stretch the spring while a second person was holding the engine and guiding the spring into place. I wore thick gloves to keep the string from cutting into my hands and goggles in case the spring flew off! Once this was done, I was ready to fit the engine back into the frame. 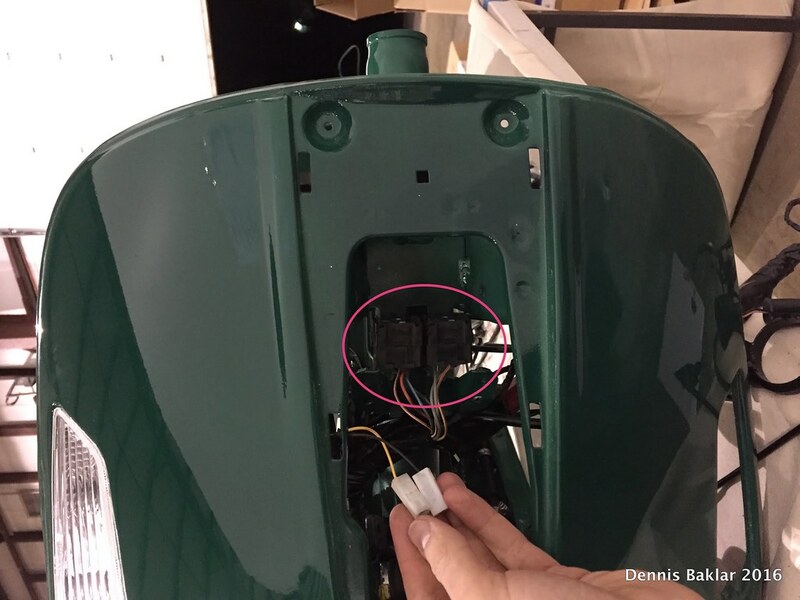 I followed my disassembly notes (see Dropbox link above) and Scooterwest’s YouTube video “Vespa GTS Engine Removal” in reverse order and it was a snap. 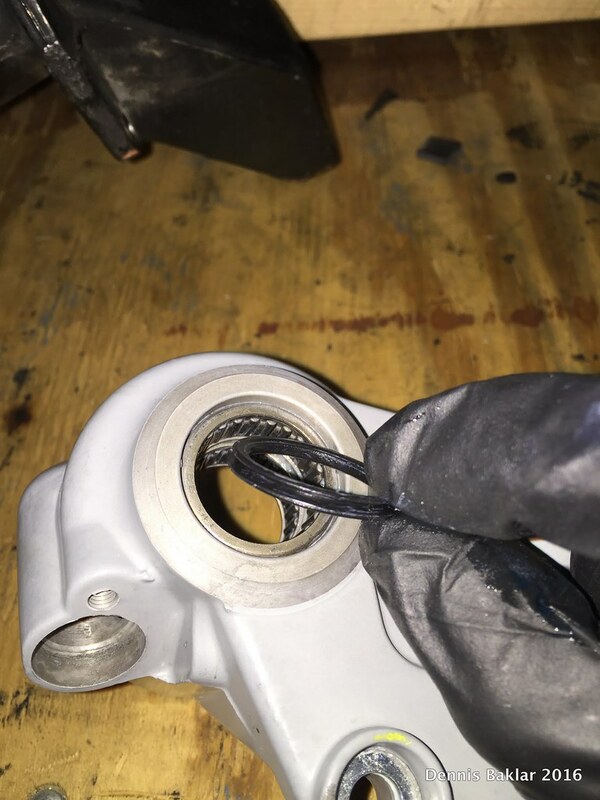 When attaching the throttle body, noticed that it’s is a metal to metal connection and Vespa does not provide a gasket. I bought liquid gasket for this purpose. Honda Civic Freaks use it like toothpaste. Installing air filter like so. New ones come pre-oiled. Used ones can be washed with water and detergent, air dried, and then treated with filter oil. See bottom of post for product recommendations. 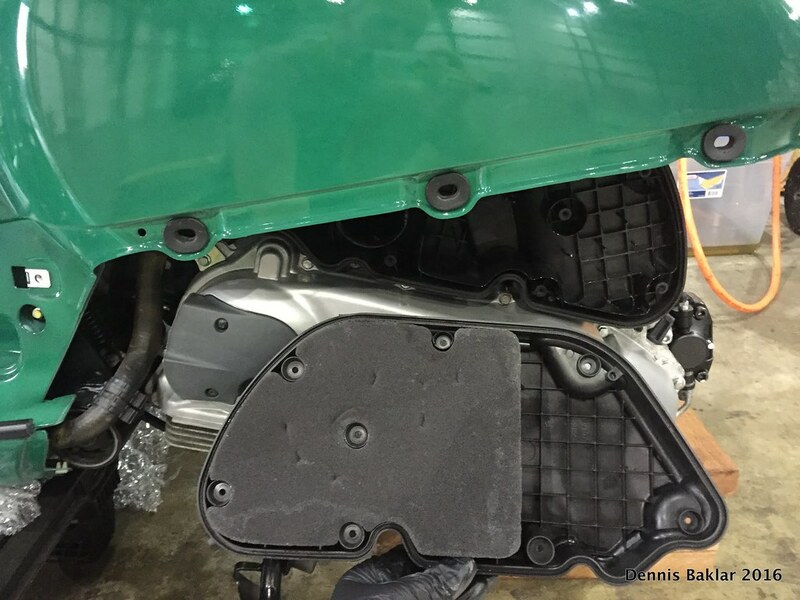 With the filter in, I attach the air box cover. 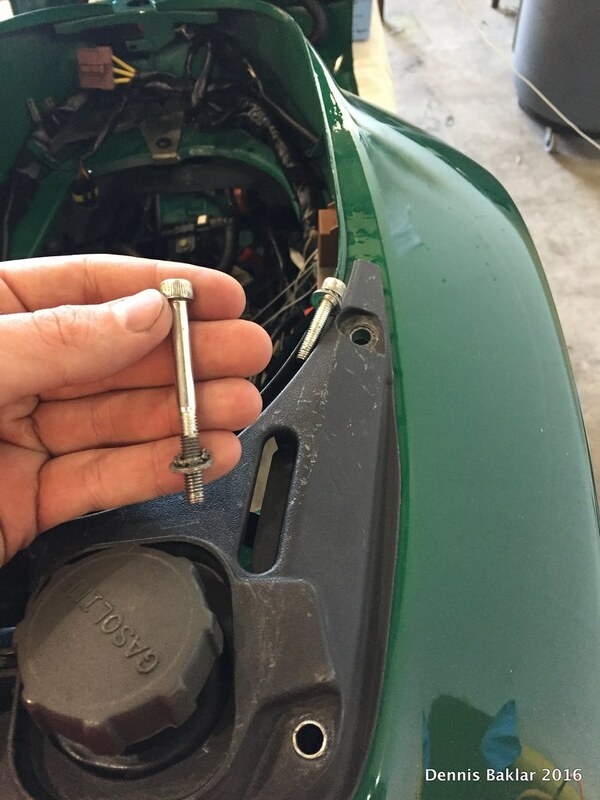 It takes 2 thumbscrews that are accessible from the engine bay, and 6 Phillips screws accessible from the outside of the Vespa. 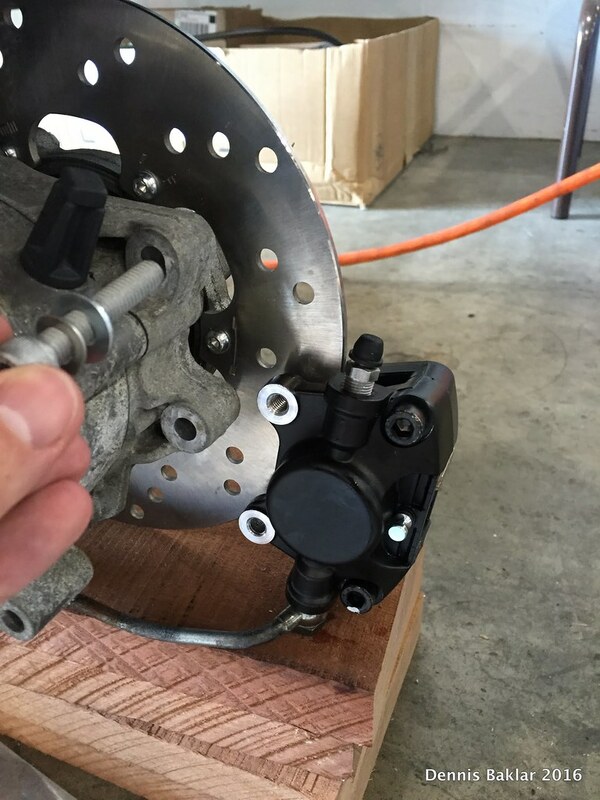 Attaching the rear brake caliper to the rotor using 2 Allen bolts with washers. 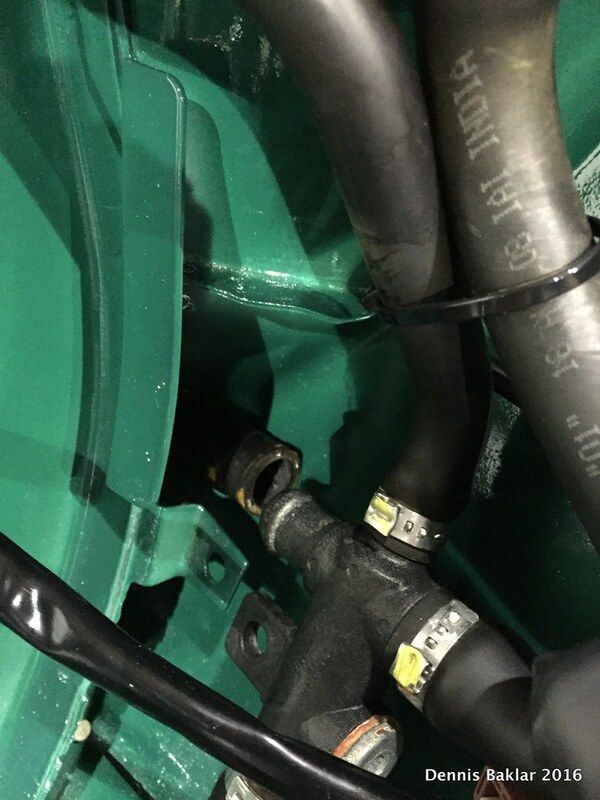 Connecting the brake hose to the engine at strategic locations. 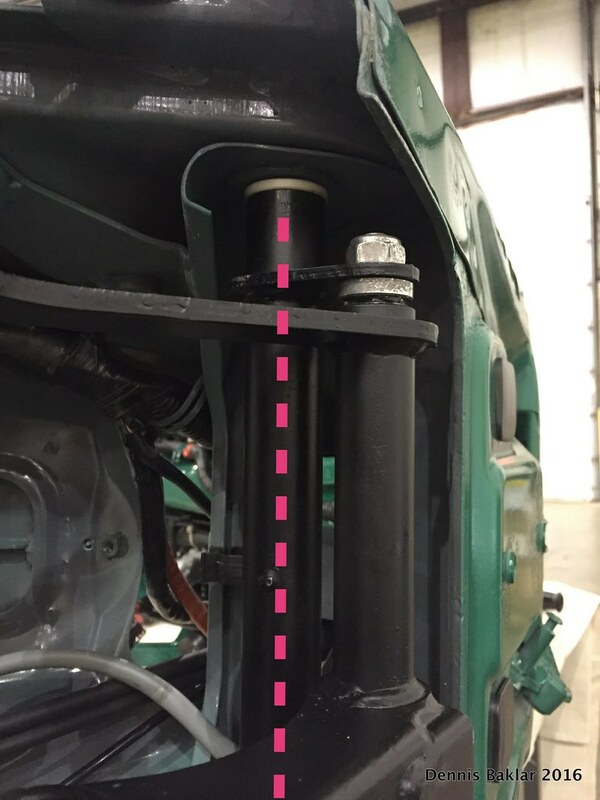 Running the rear brake line along the left side of the floor and through the opening in the frame. 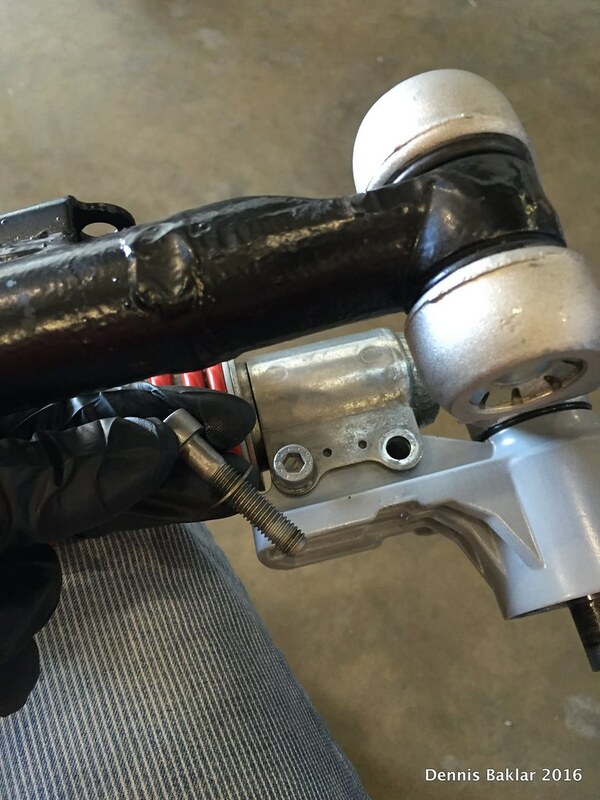 Folding the metal clip over the rubber mount in the brake line. Then I used a zip-tie to secure everything in place. 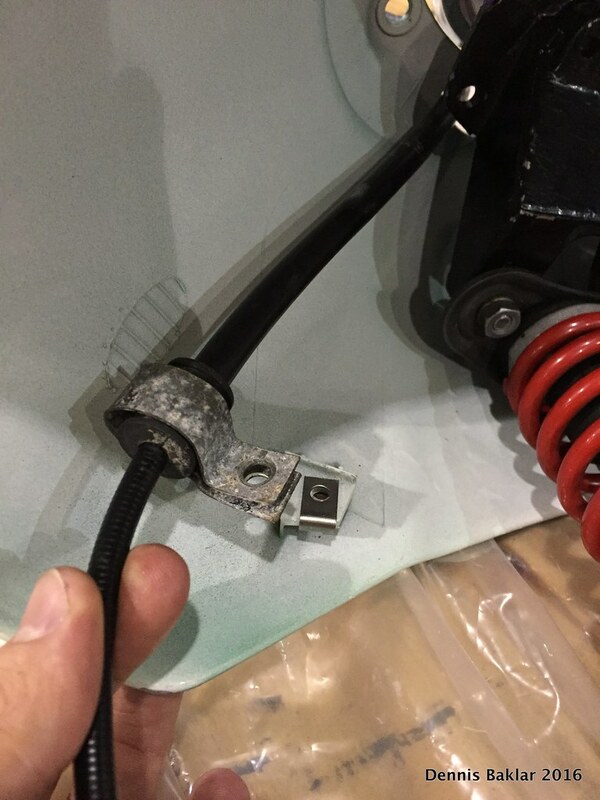 The thinner black line under the brake line is the seat release cable. 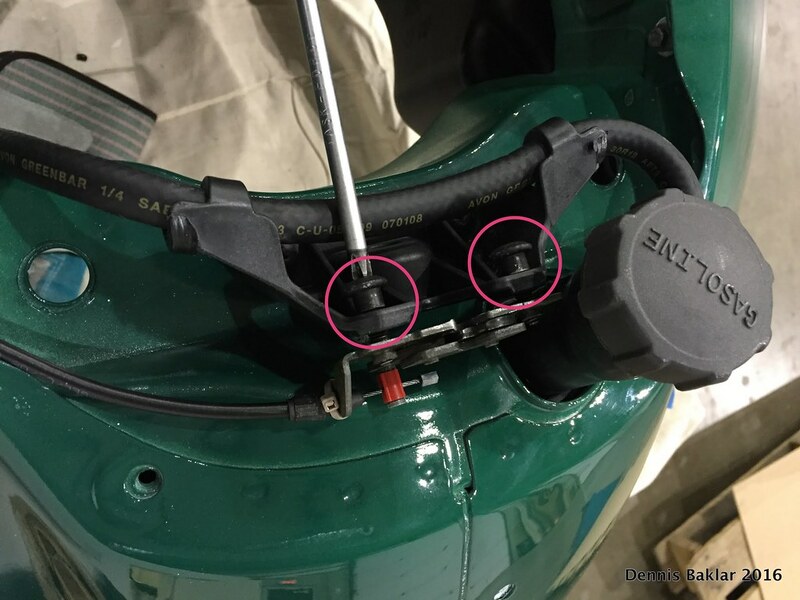 I bolted the master cylinders on the the handlebars following marks I left during disassembly to ensure they are in the correct position. Then I attached the brake levers. 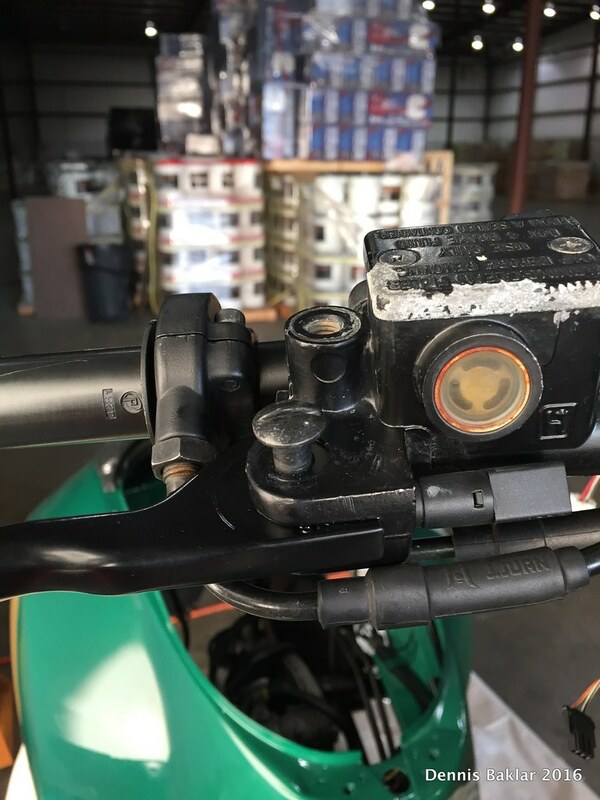 The right brake lever installs between the 2 throttle cables. 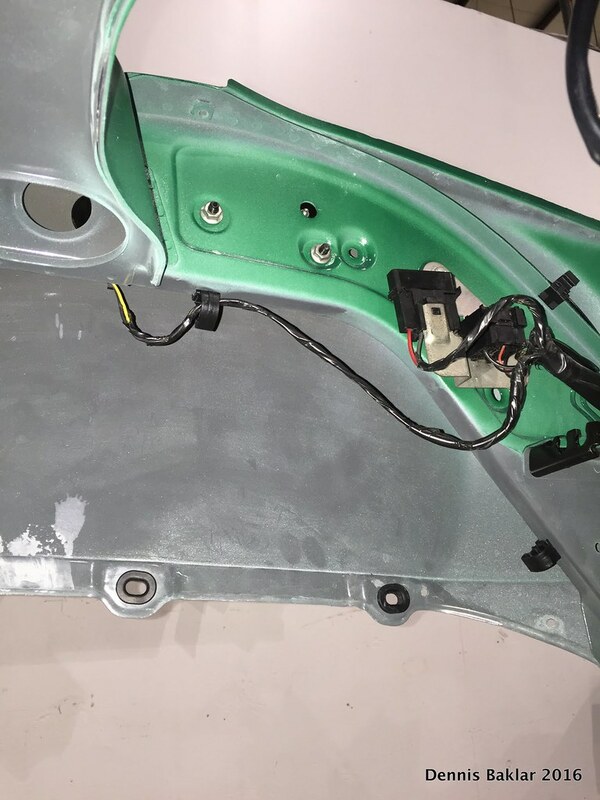 Screwing in the brake light switches into the master cylinder brackets. 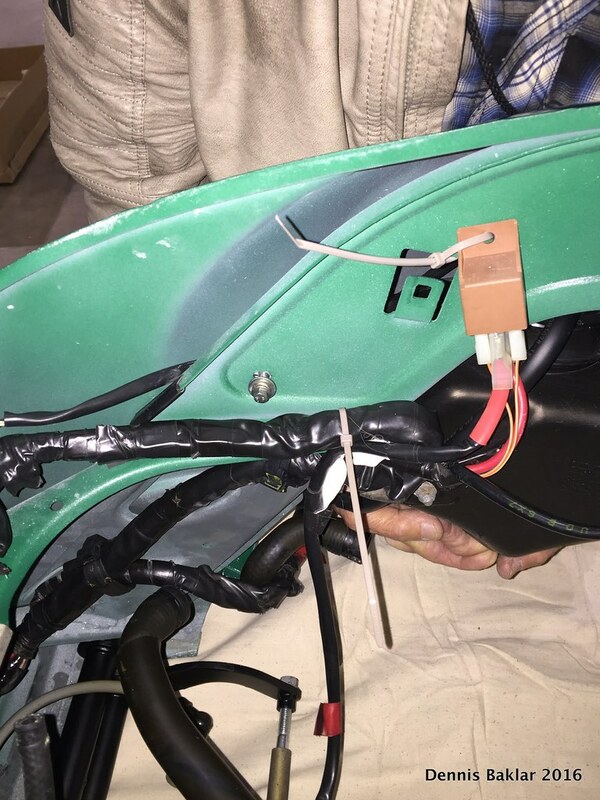 I zip tied the other wires to the handle bars, as indicated in the Vespa shop manual electrical diagrams. 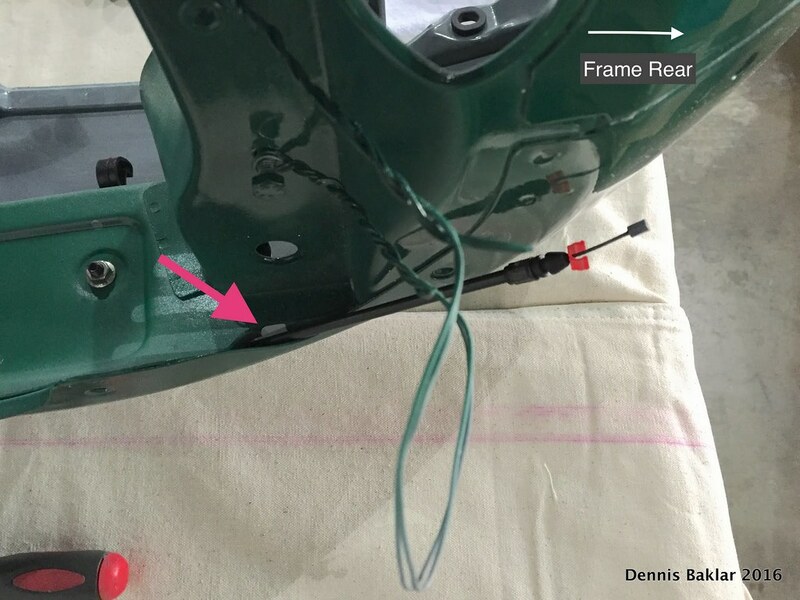 The red tape on the harness marks where the zip tie goes. These will plug into the handlebar buttons later. 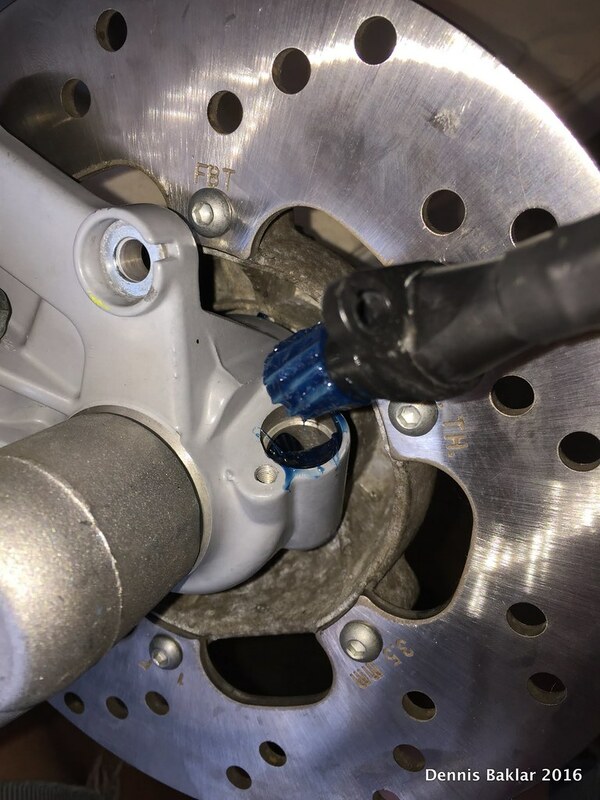 If replacing the fork, as I was, note whether the new fork has a hook for the brake hose. As you see my old one (on right) didn't but the new one does. 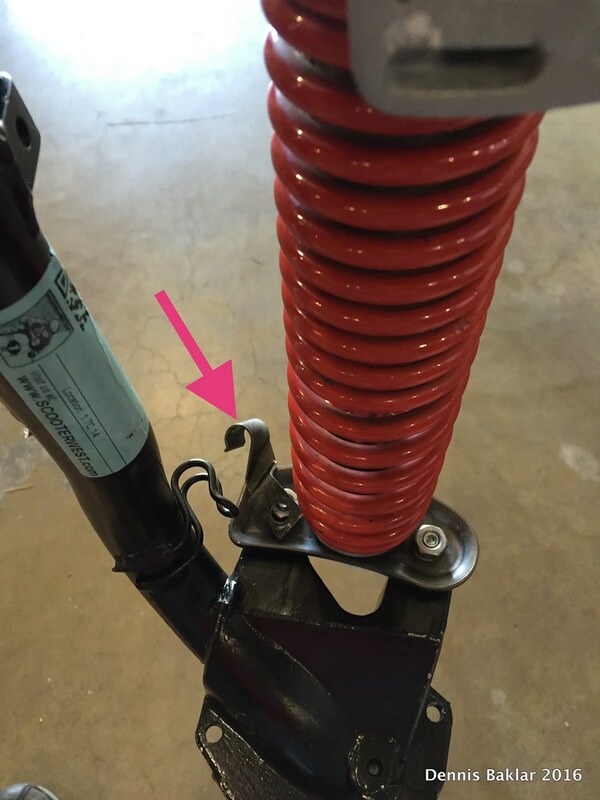 If the fork has a hook, the retaining clip that mounts at the top of the front shock is redundant. So I removed it. 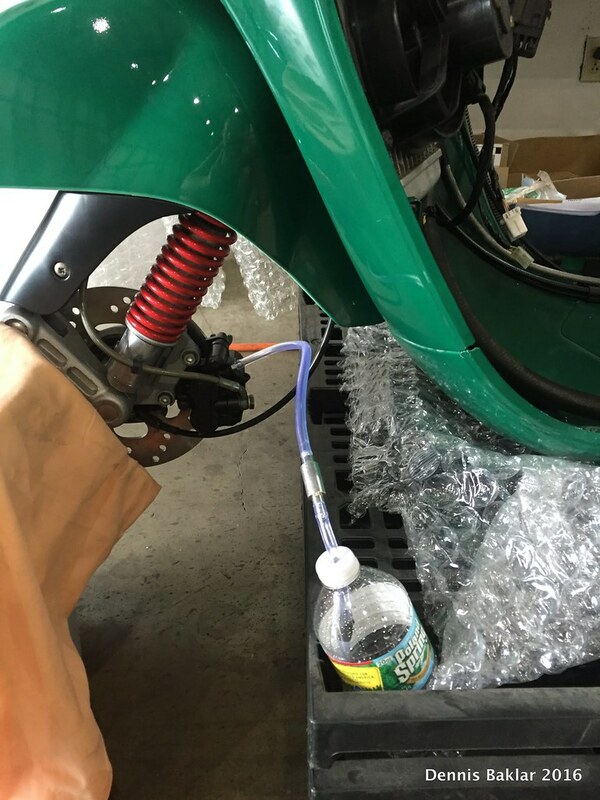 Applying a bit of grease on the swing arm. 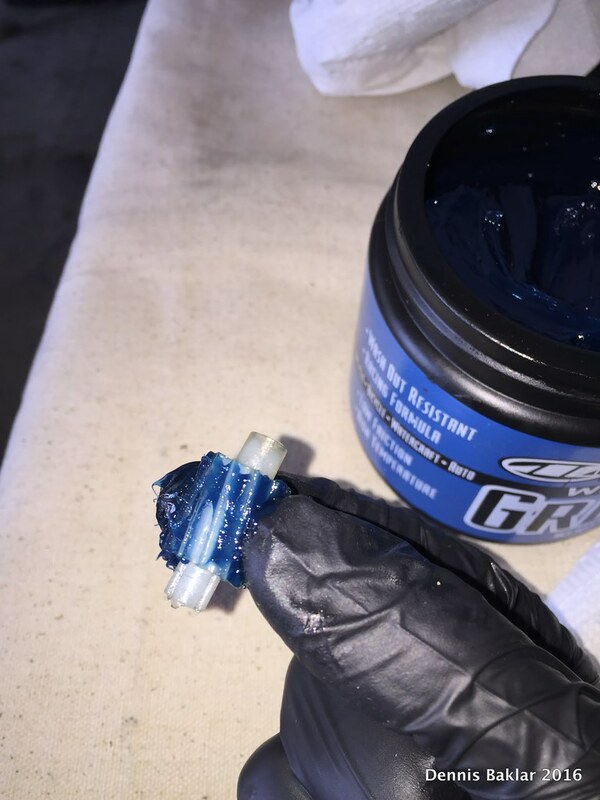 My grease is blue, but I hear other colors work too. See bottom of post for product recommendations. 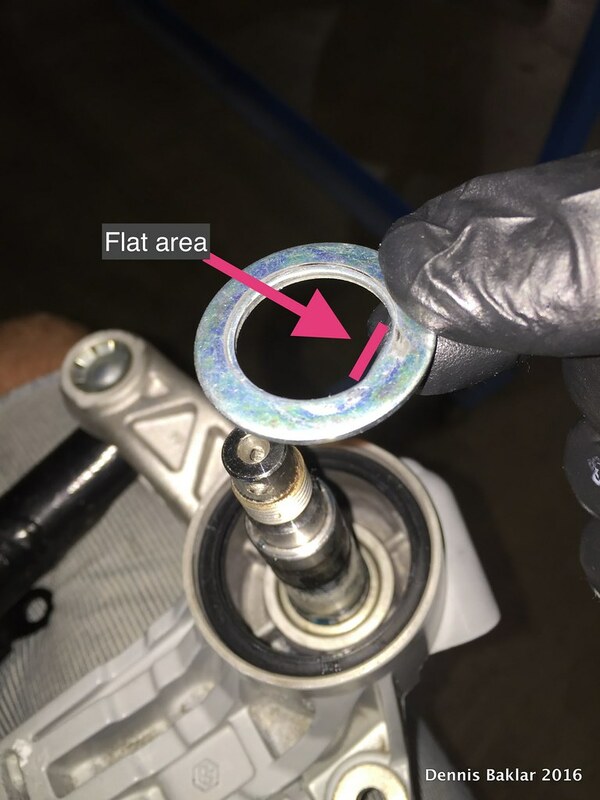 Inserting D-washer, making sure to align the flat area properly. 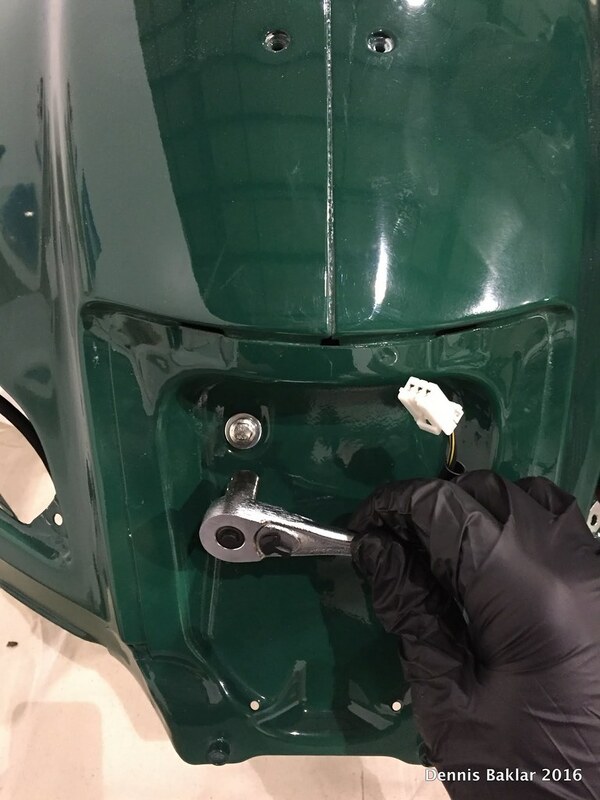 Now installing the lock ring. 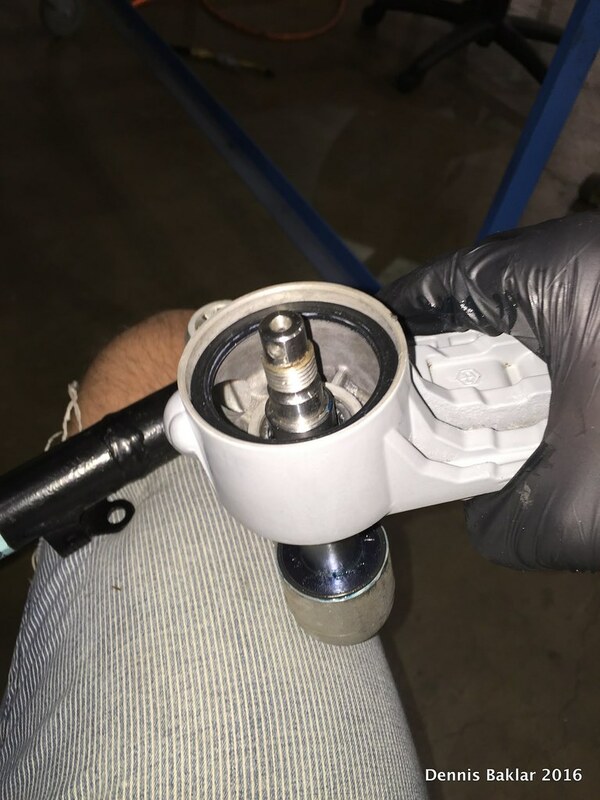 It's time to seat the bearings! This can be tough or easy depending on the approach. I heard there are special tools for this but as I said earlier, I didn’t know if this was going to be a one time project or not, so keeping investments in tools to a minimum was important. 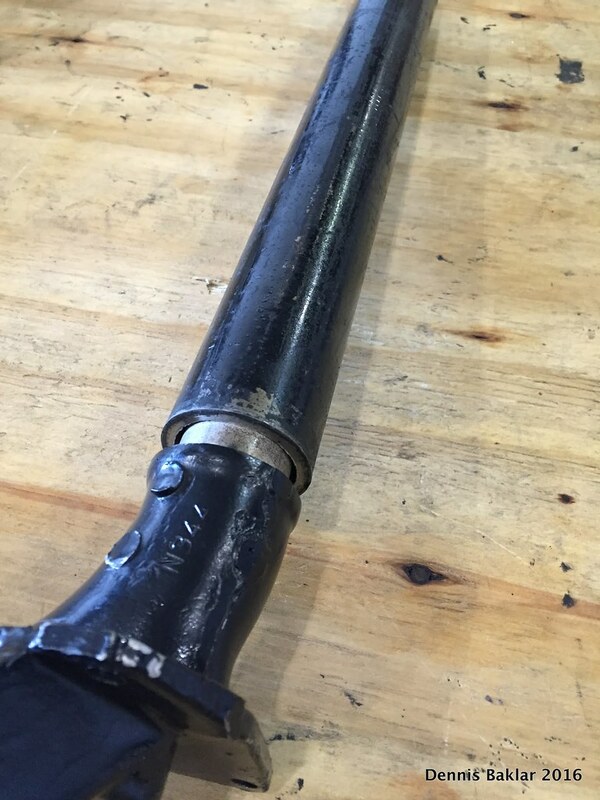 I went to a hardware shop and got some pieces of scrap pipe, making sure the pipe's inner diameter was big enough to fully slide over the steering tube. It fit like this. Not too loose, but not snug either. 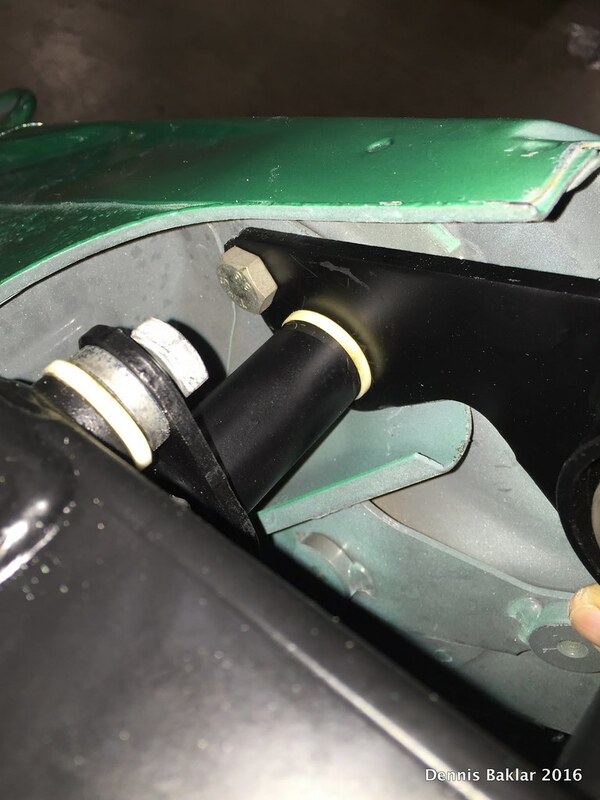 I put the lower bearing cup into place and then slid the pipe gently up and down the steering column, simultaneously seating the part into place and remembering the days when I was 12. Next is the lower race. Repeating the process. 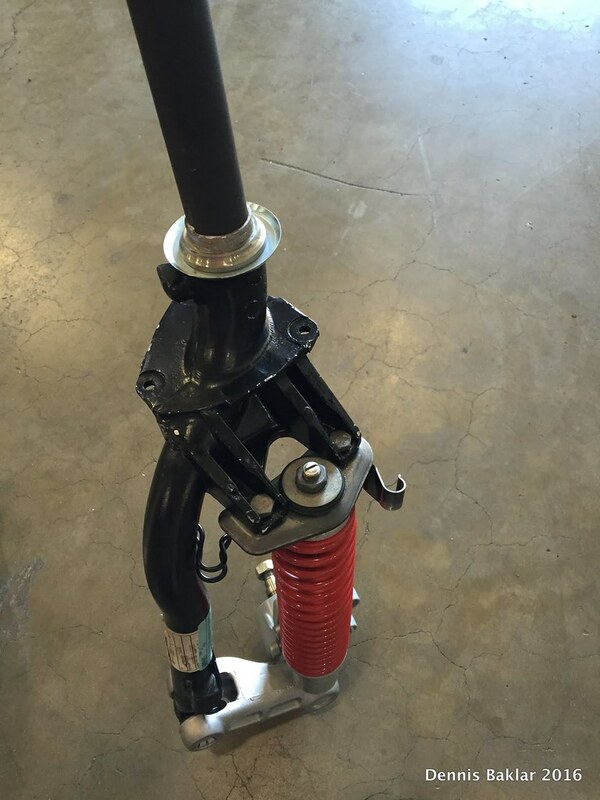 I'm using a longer pipe that extends past the end of the steering tube. This way I keep the pipe on the lower race at all times and hit the top of the pipe with a mallet. 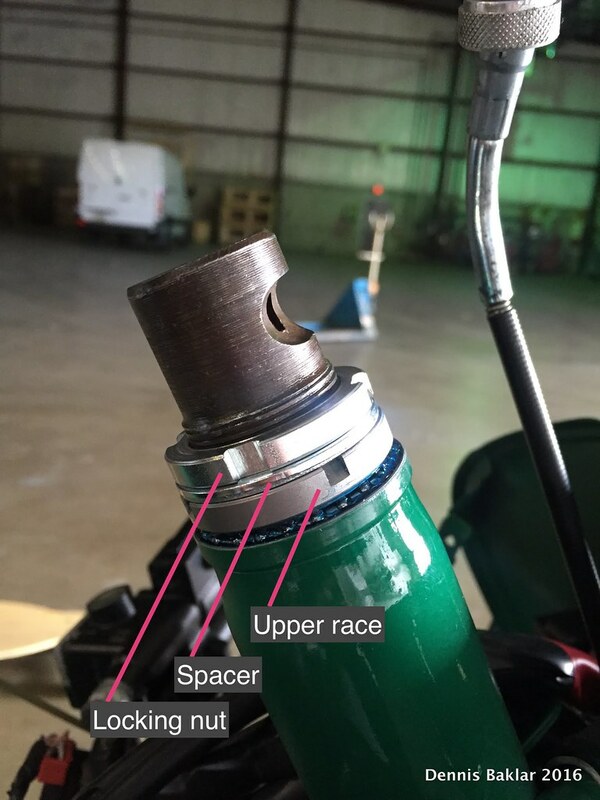 Using a short pipe would require me to hit the actual race and this could cause small dings. 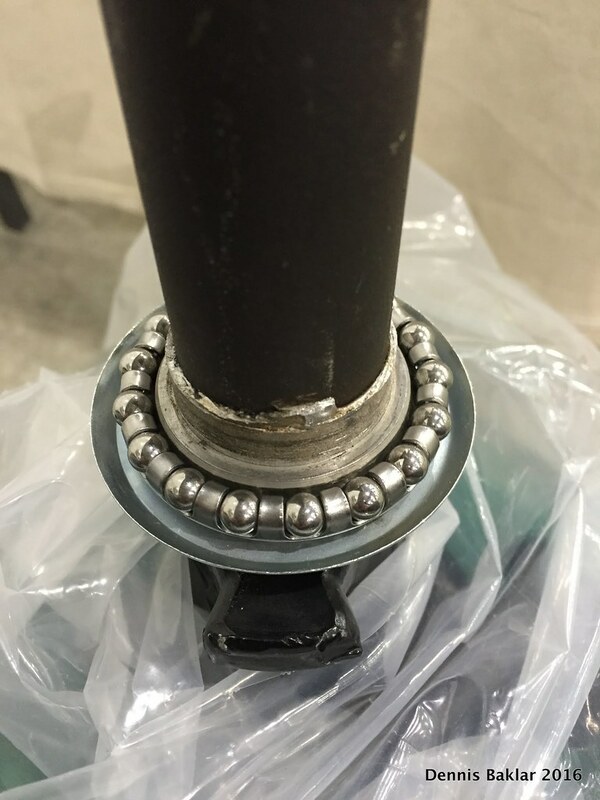 These dings are fine on the bearing cup, but not on the bearing race. 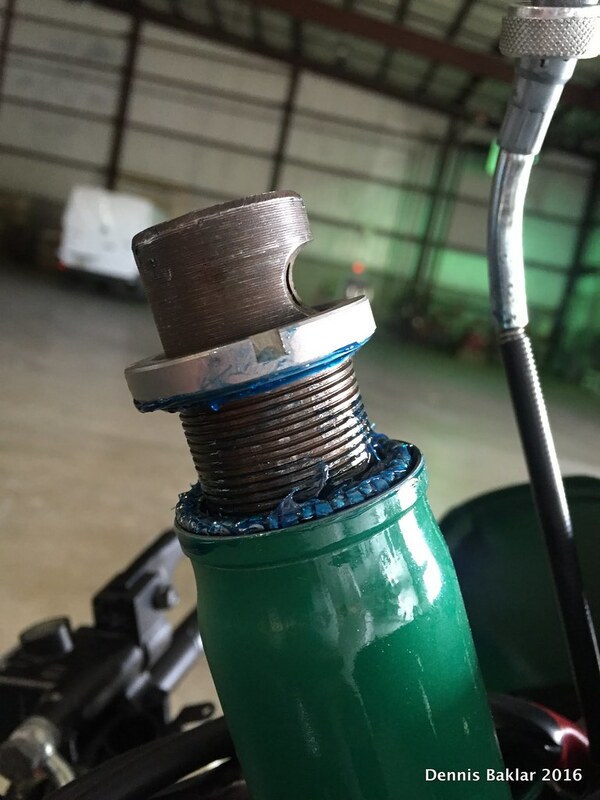 I used a heavy hammer. It's a tight fit. 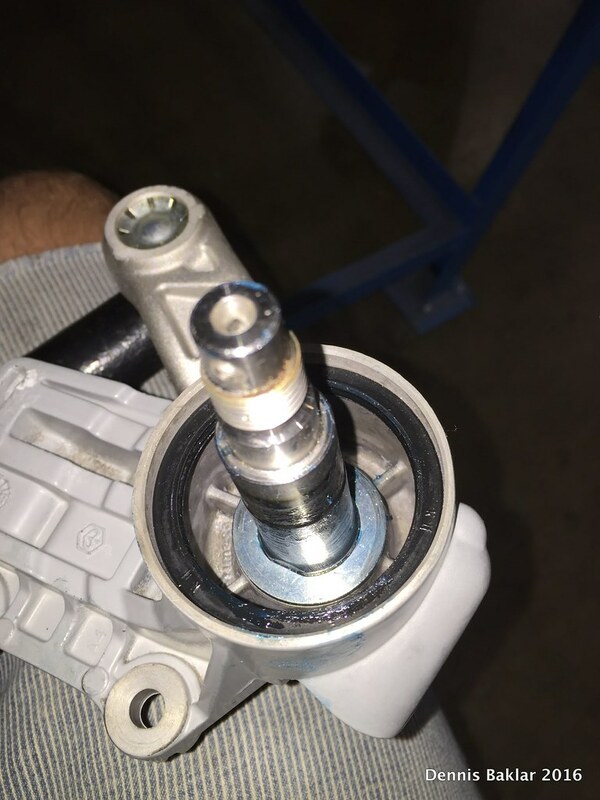 Screwing in bottom of shock. 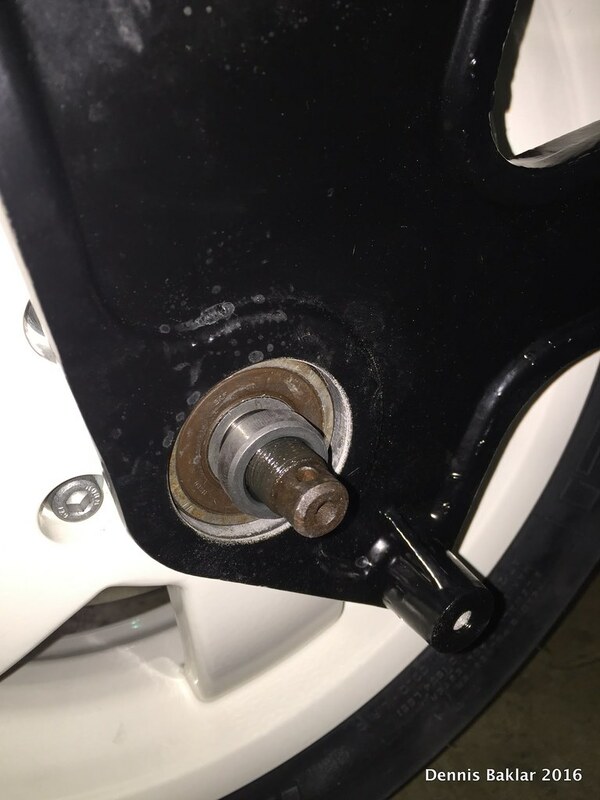 Each hole takes a bolt and washer. Now attaching the top side with 2 bolts. I got rid of this clip since my fork had a built in clip. 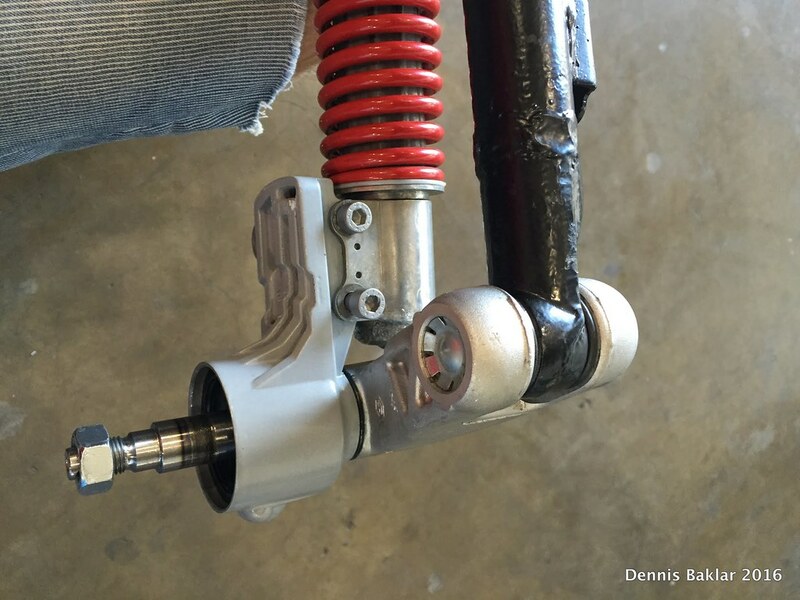 If it didn’t have this clip, then I would keep the one on the shock. 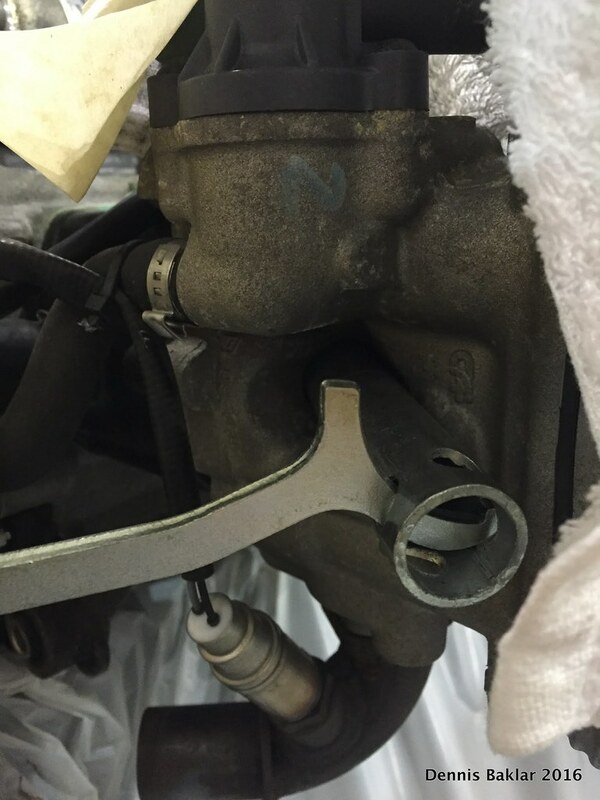 It's needed to hold the brake line in place later. 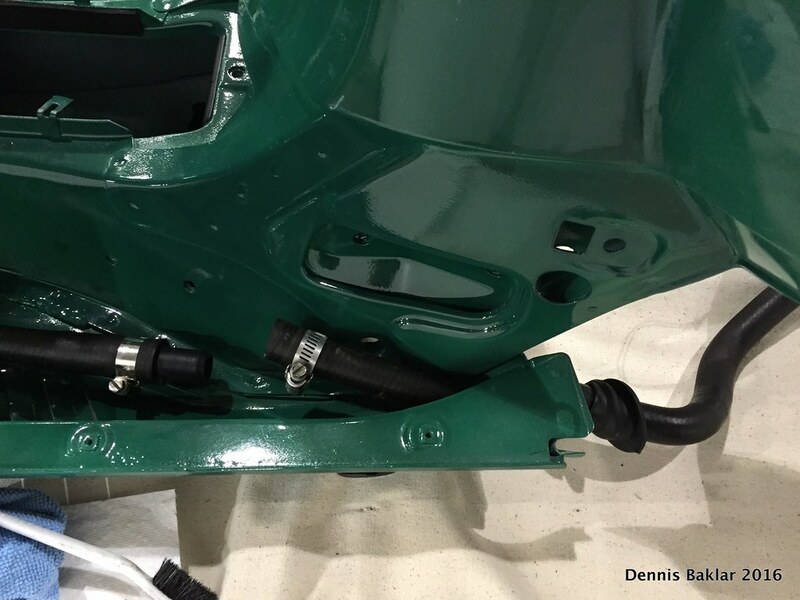 Installing the black engine bay cover and sliding down the O-ring over the fuel filler neck. 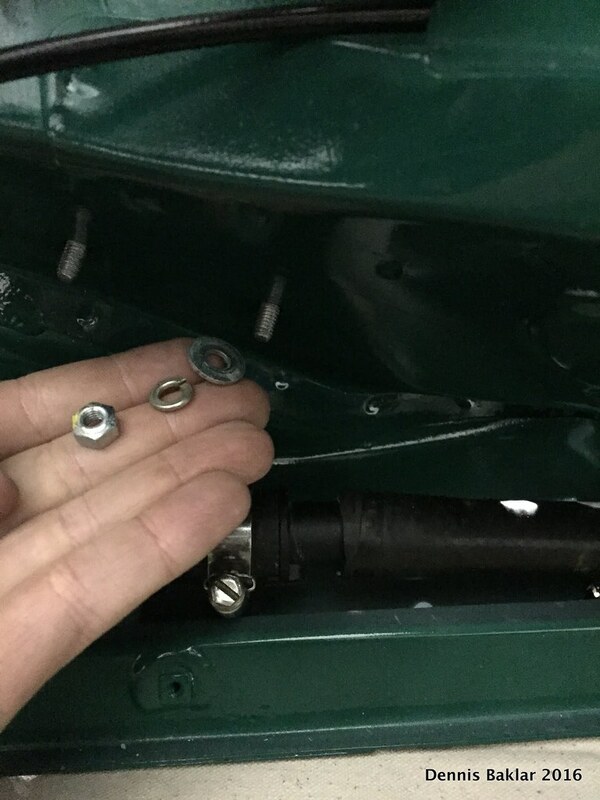 Screwing down the cover with bolts. They take a regular washer, followed by a star washer (prevents unscrewing). 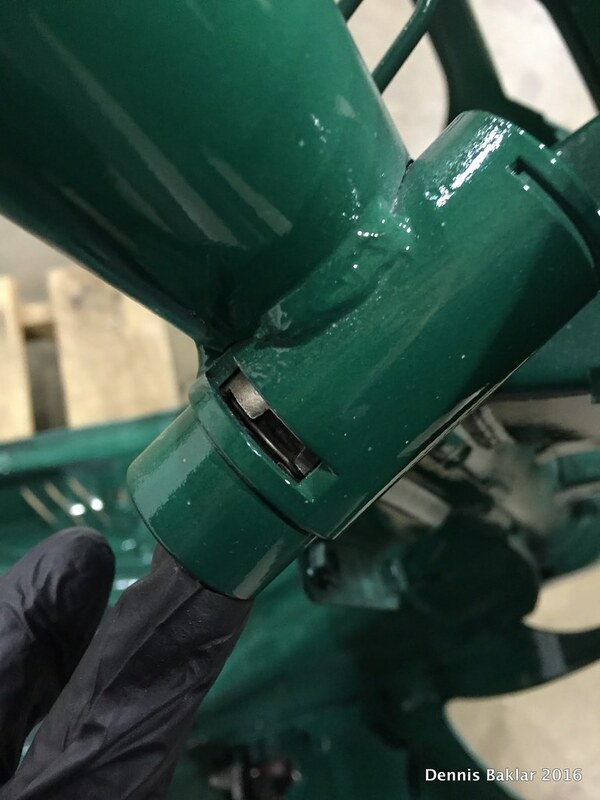 Longer bolts go in the back. Shorter ones in front. Gas cap on, and everything tightened down. 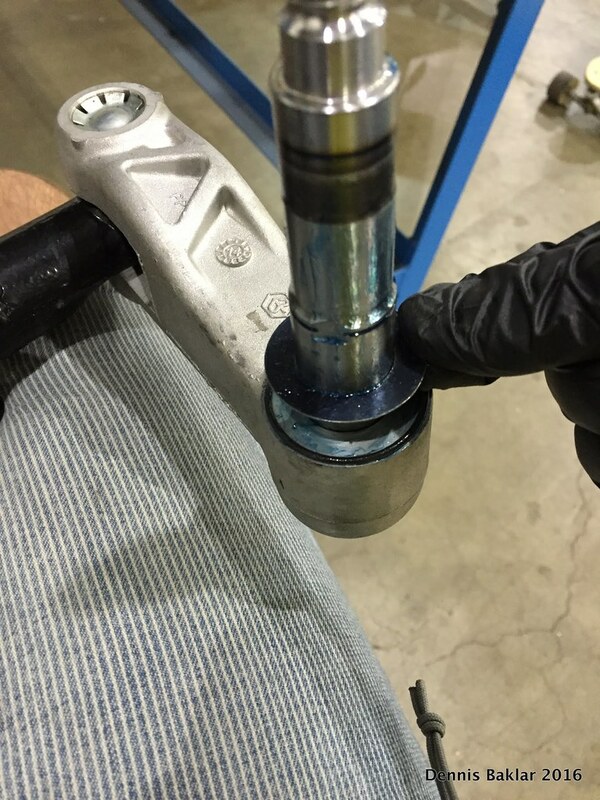 Greasing up the front hub generously and sliding over the front axle. 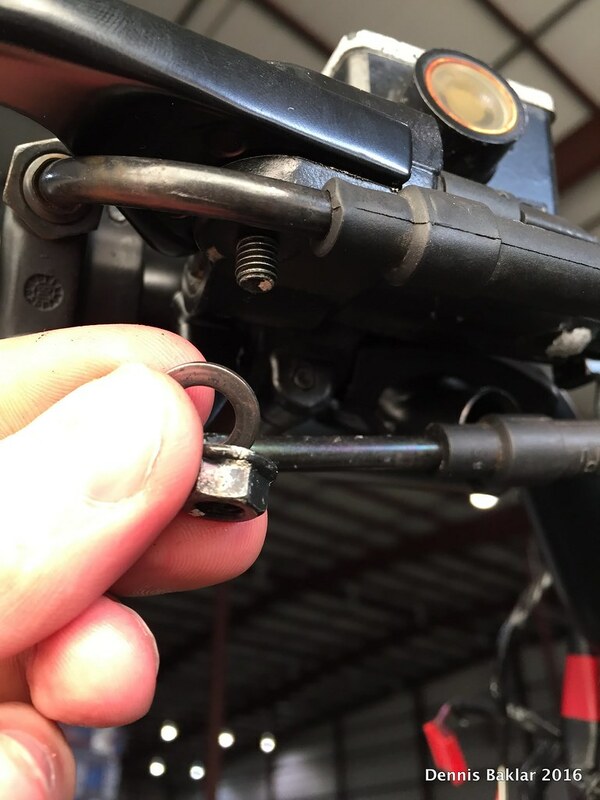 Attaching front rotor with Allen bolts. 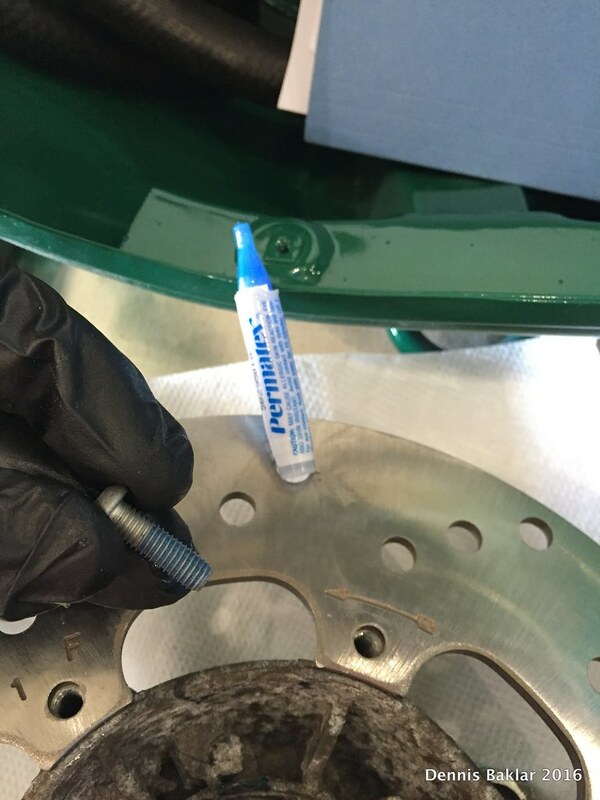 I’m using BLUE Loctite as specified in the Vespa shop manual and torqueing to specs. 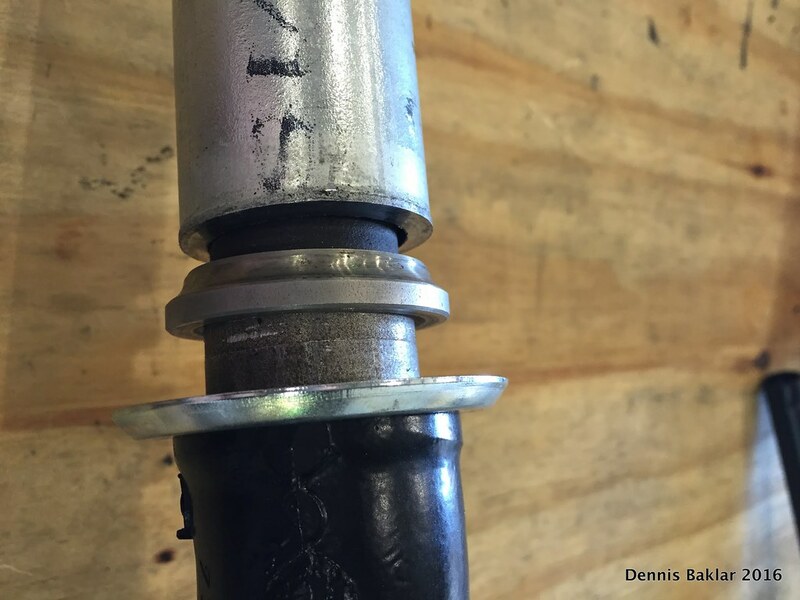 Refer to torque sheet at bottom of post. Check fit. Fully seated looks like this. 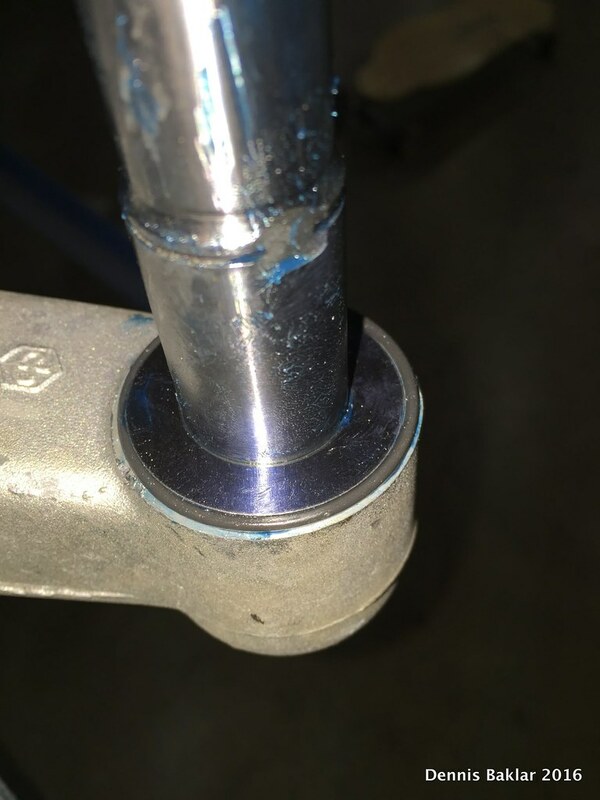 Screwing on the axle nut and torqueing to specification. 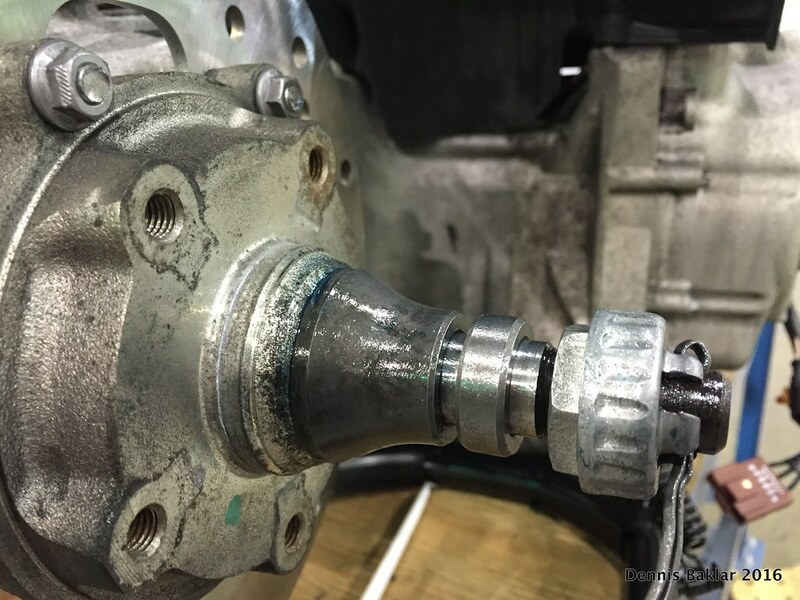 Once front axle nut is torqued, inserting the cage. 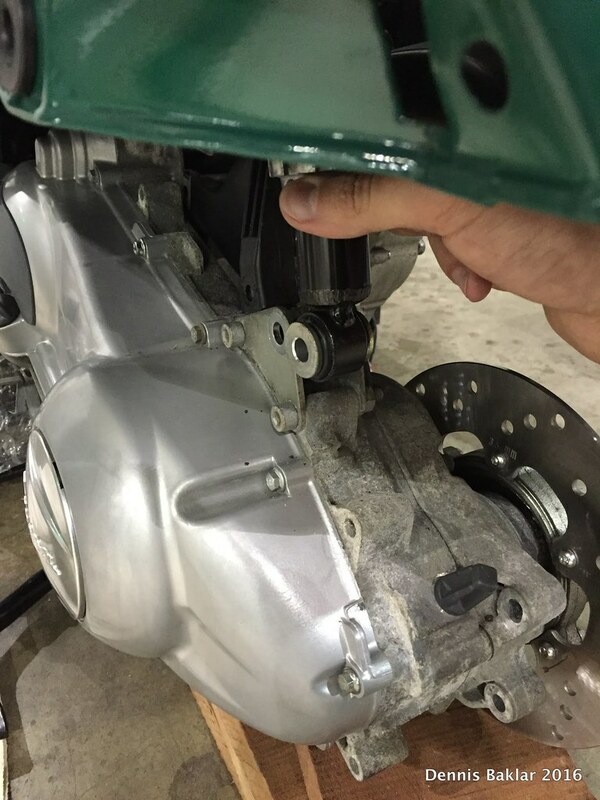 Installing the split pin to lock cage in place. 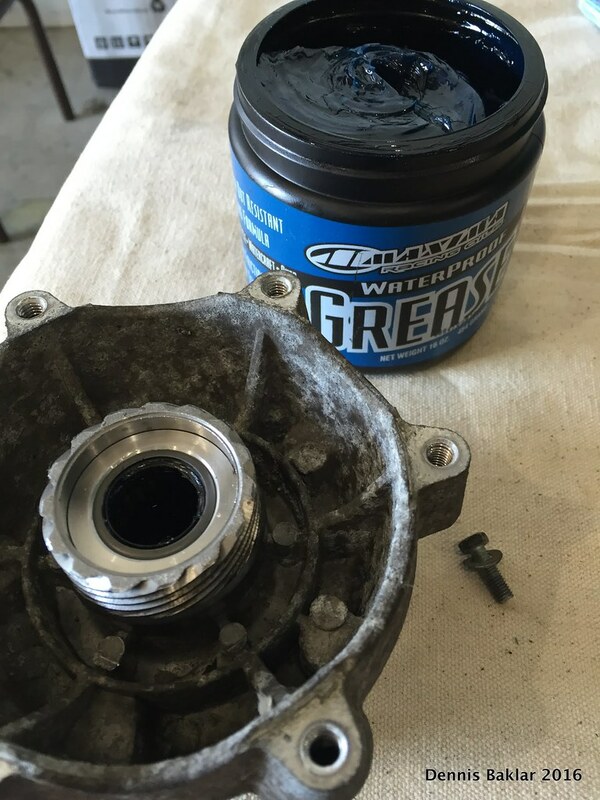 Filling this hole with grease. 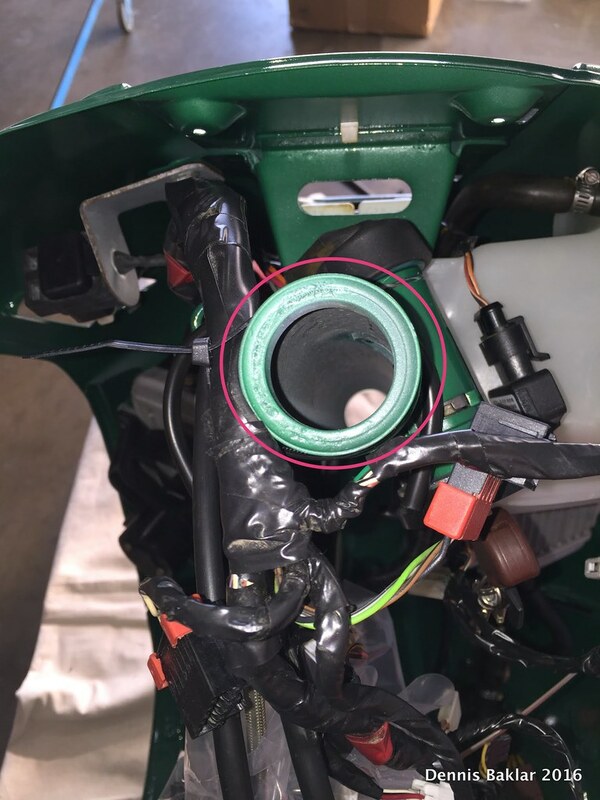 This is where the speedometer cable gear connects. 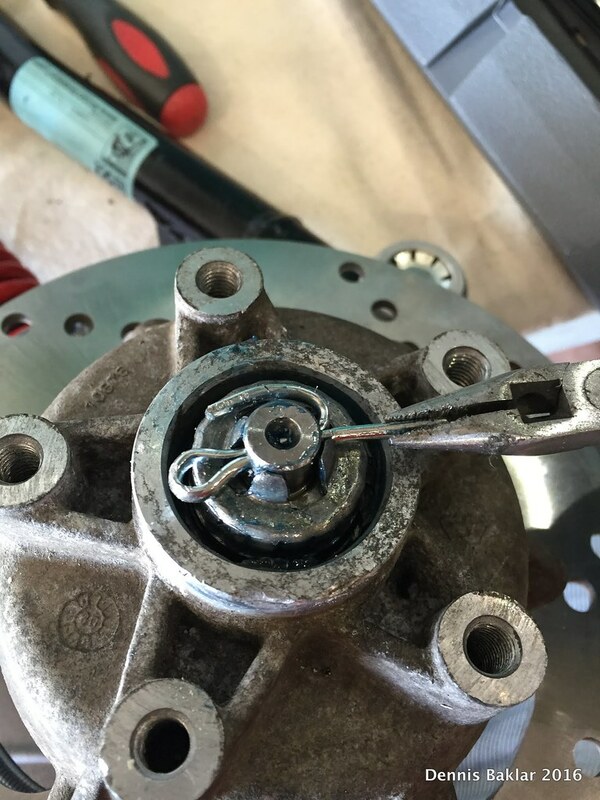 Greasing the speedometer cable gear. 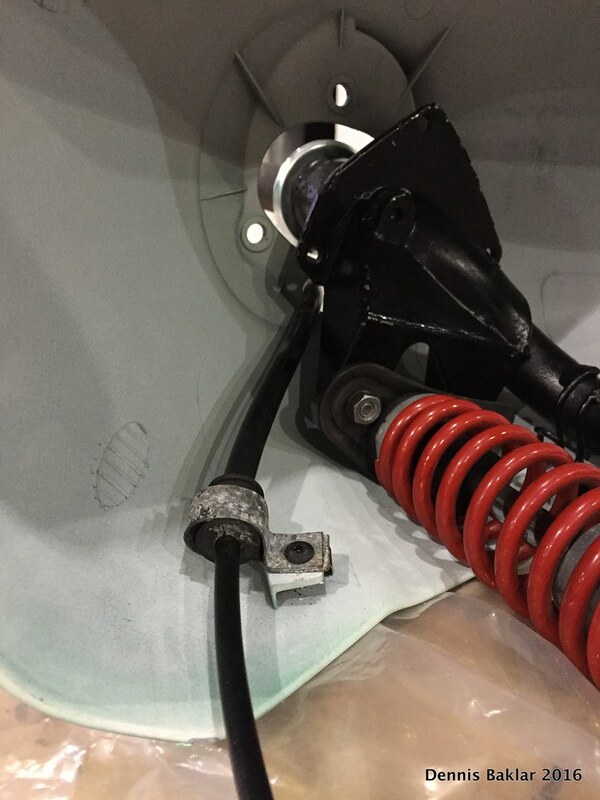 Sliding the gear over the cable and then inserting the assembly into the hub. 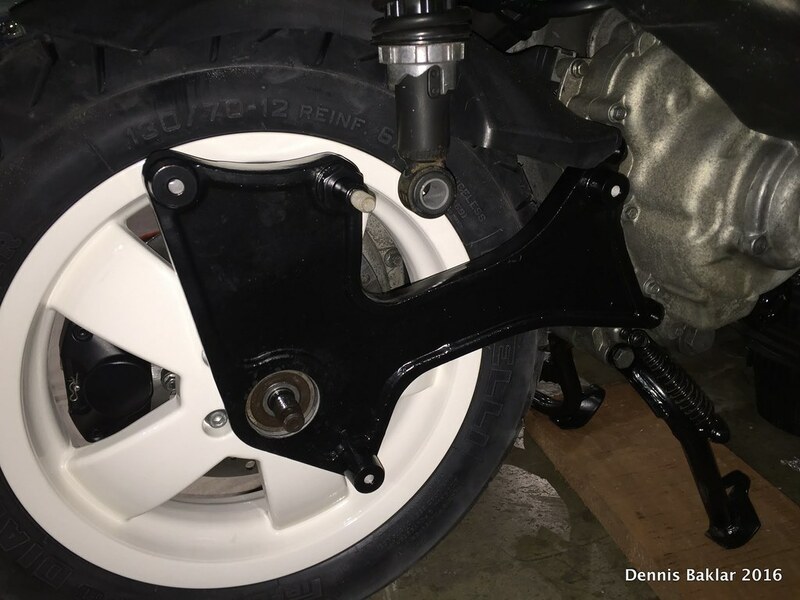 Prior to installing the fork, I cleaned the bearing seats of any paint residue. 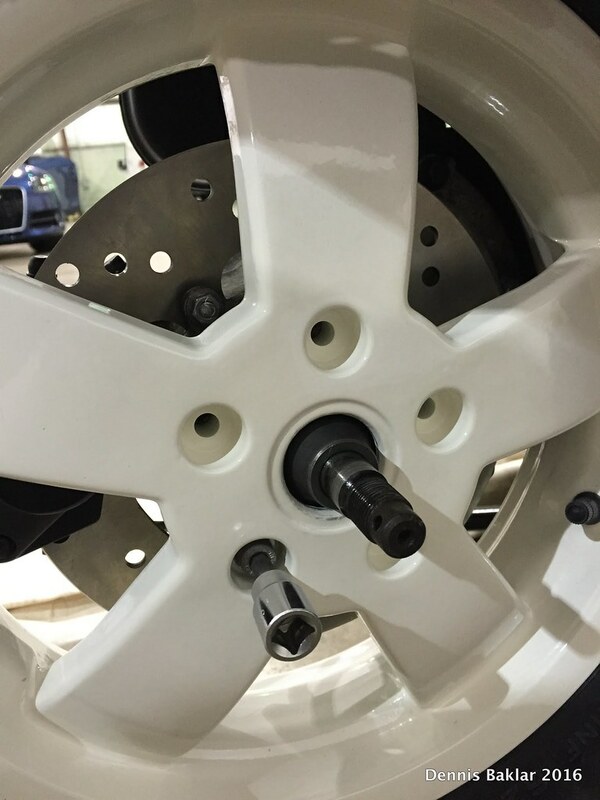 If left unsanded, the paint will deteriorate over time and clog up the bearings. 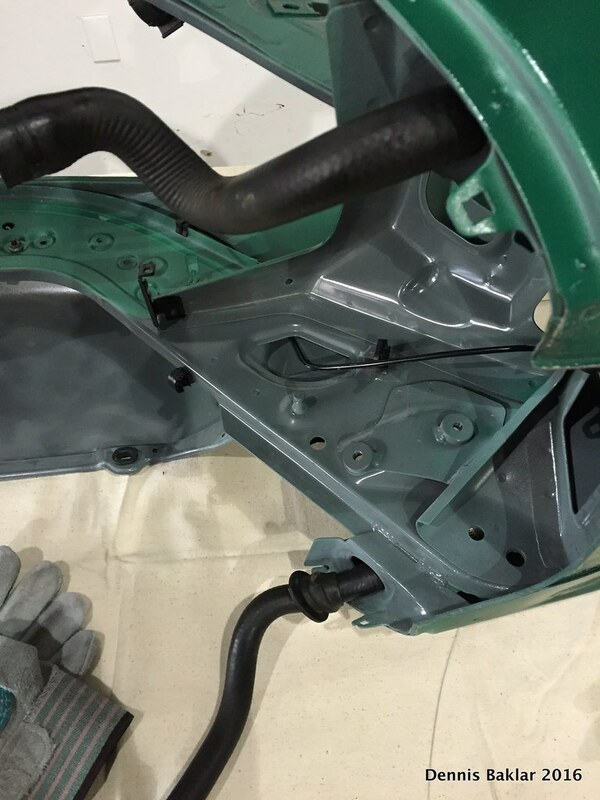 It’s essential to get the seats cleaned down to the bare metal. I'm using a Dremel with a scouring pad attachment. I found this works the best. 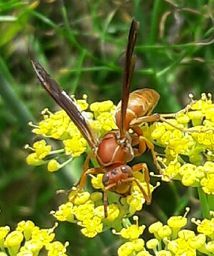 Info at bottom of post. End result looks like this. 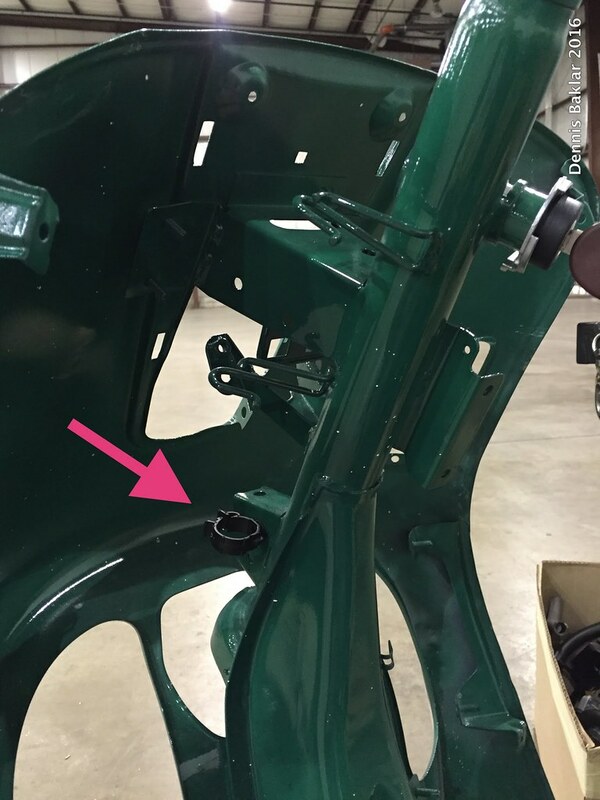 See all the paint in the top bearing seat? The Dremel takes it off. 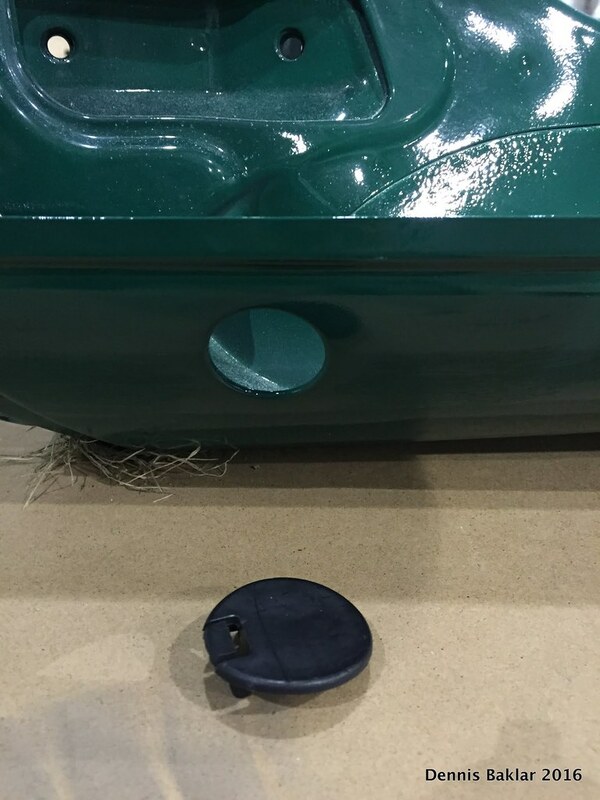 2 Tinnerman clips go on the front fender for attaching the side cover. 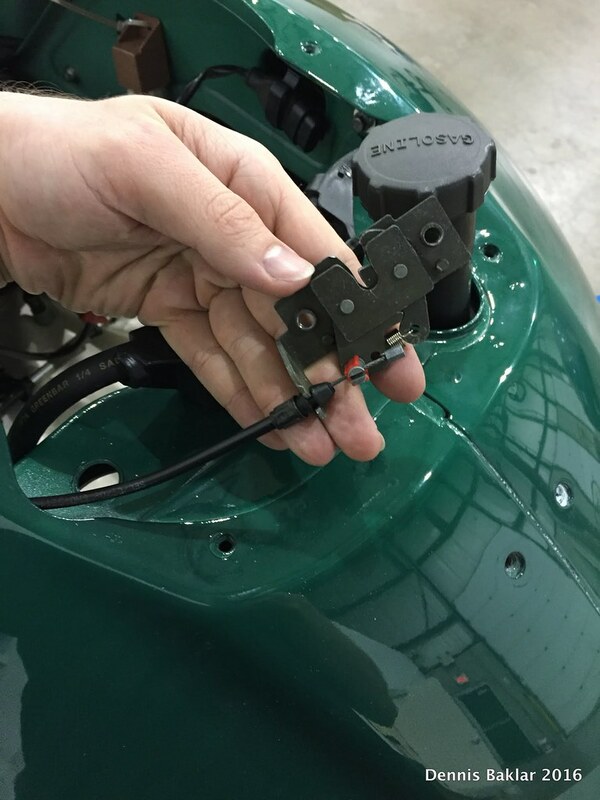 A third clip for attaching the speedometer cable bracket. 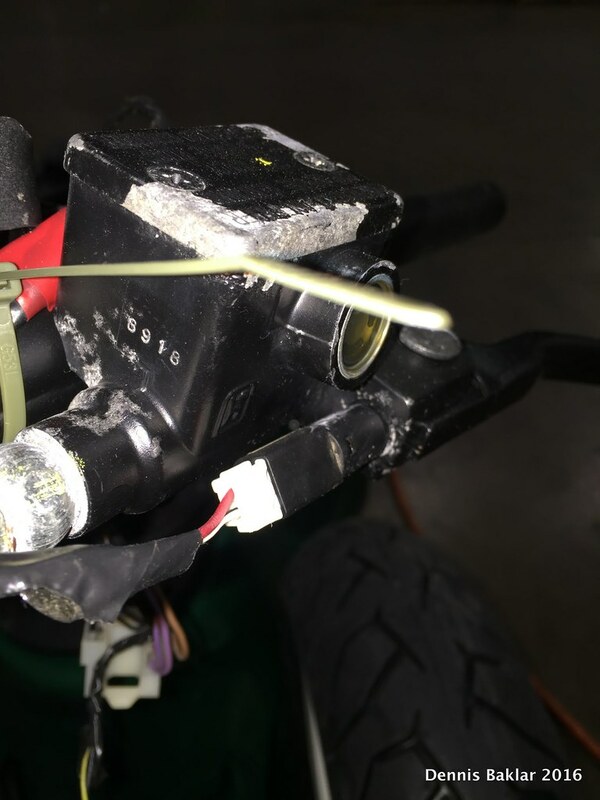 Sliding speedometer cable bracket over the rubber seat on the cable, and screwing to the fender. 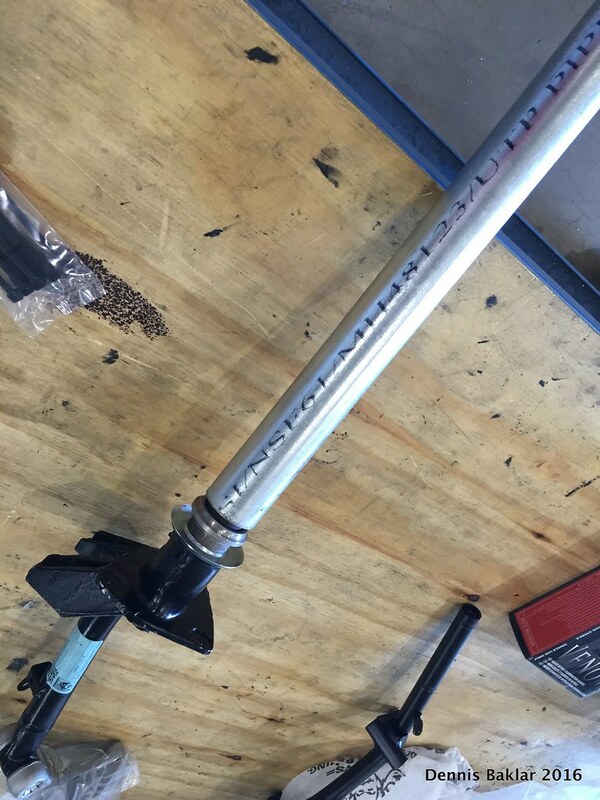 Installing the front fender to the fork using 3 step bolts with nuts. 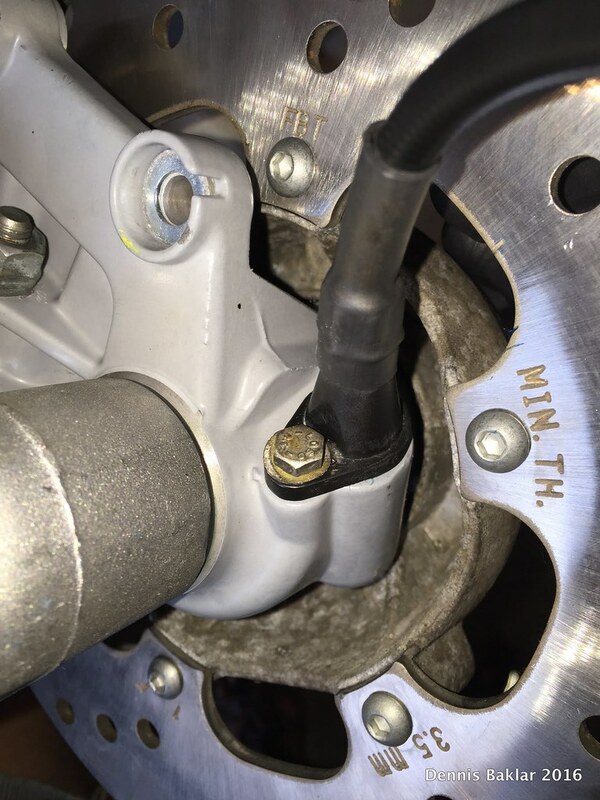 Bolts come in from the top of the fender and nuts go on the underside. 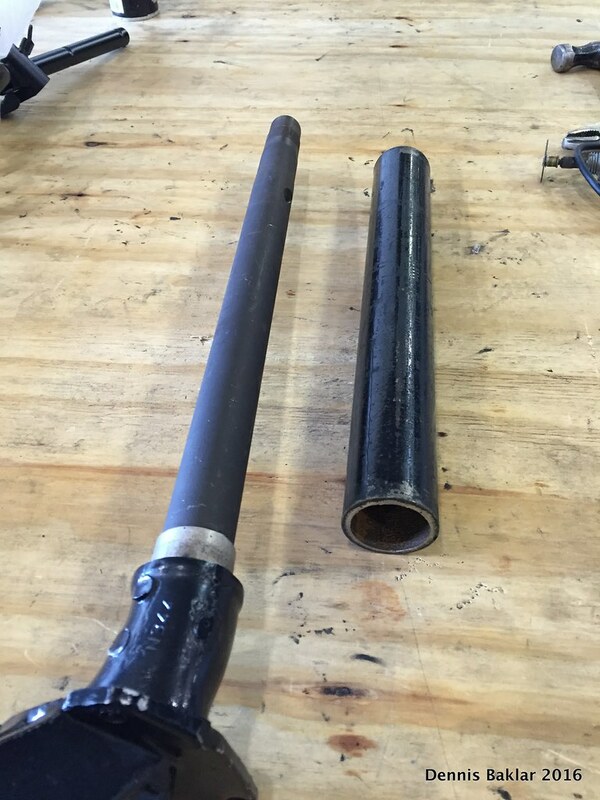 Front fork assembly ready to go into the frame! 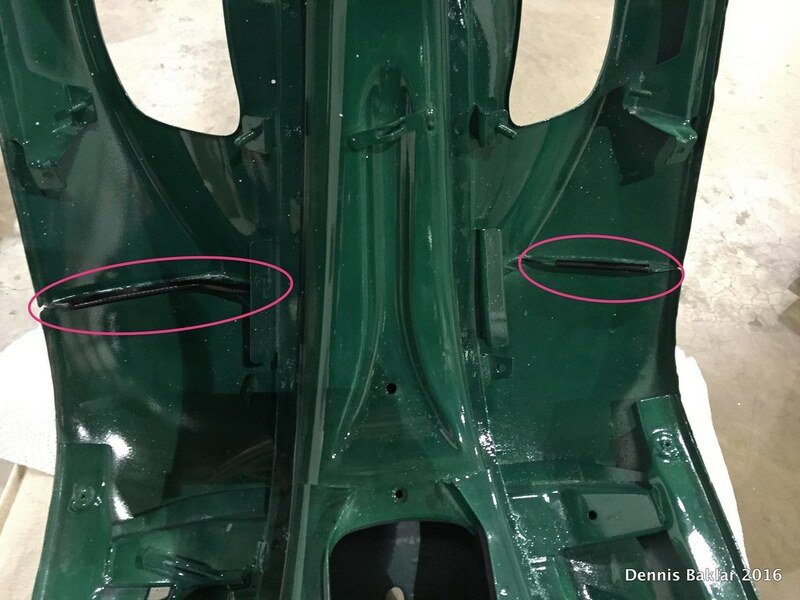 I bagged the assembly from the fender down, to avoid scratching the paint during install. I dry fit everything before applying grease. 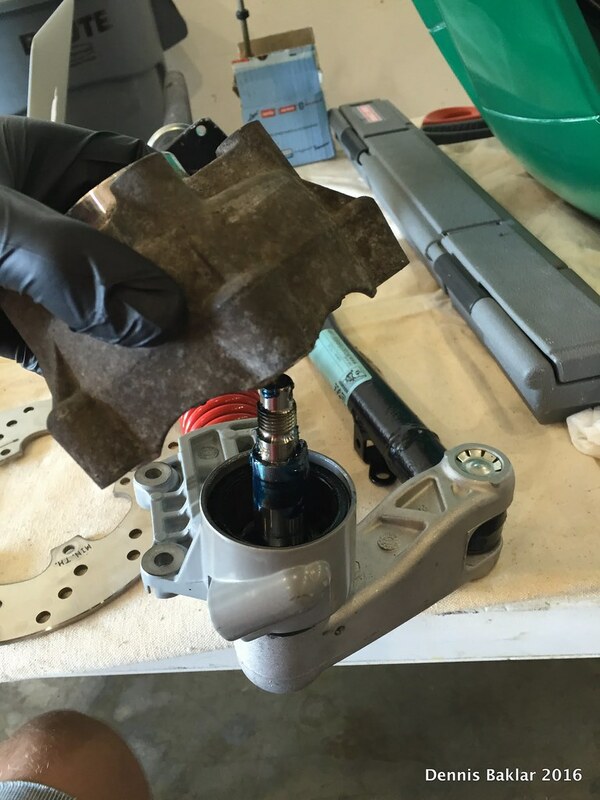 If something isn't right, it's easier to correct now than have to clean off the grease and start fresh. 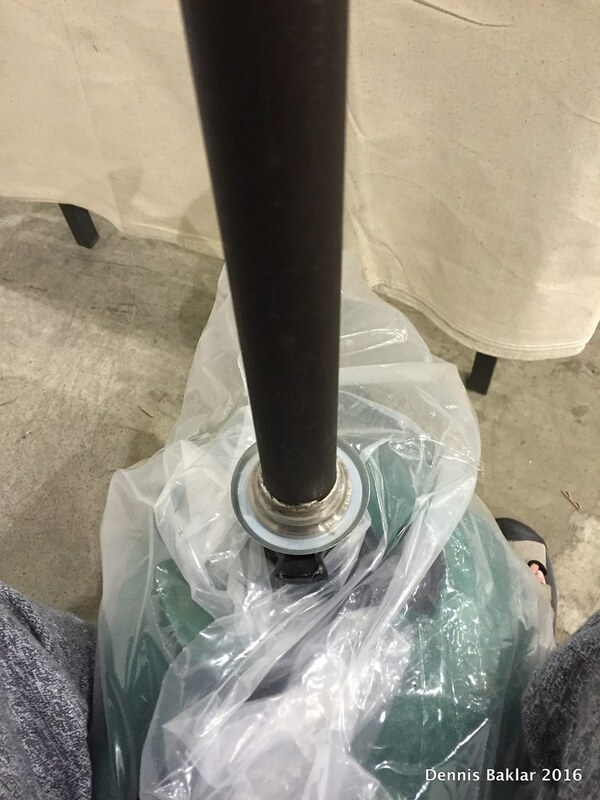 I positioned the frame on a table and the fork assembly on an office chair so I could slide it around and lift/lower as needed. Who needs professional equipment? 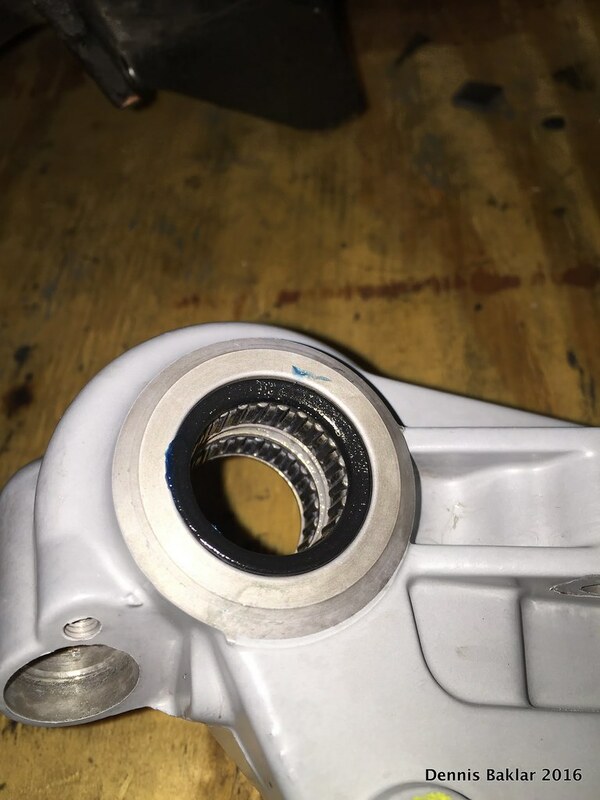 Once everything checks out, I greased the bearing. 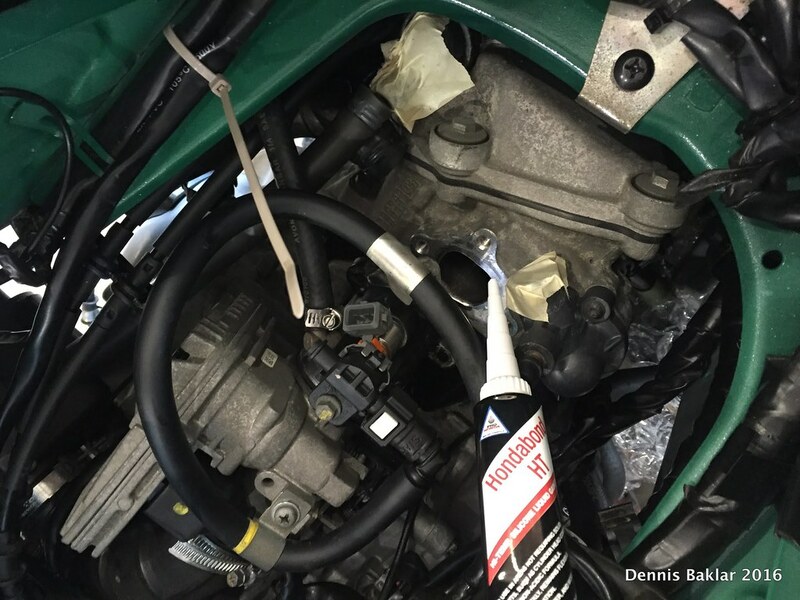 Sliding the fork upwards into the frame, I make sure the brake hose and speedometer cable are in this arrangement. 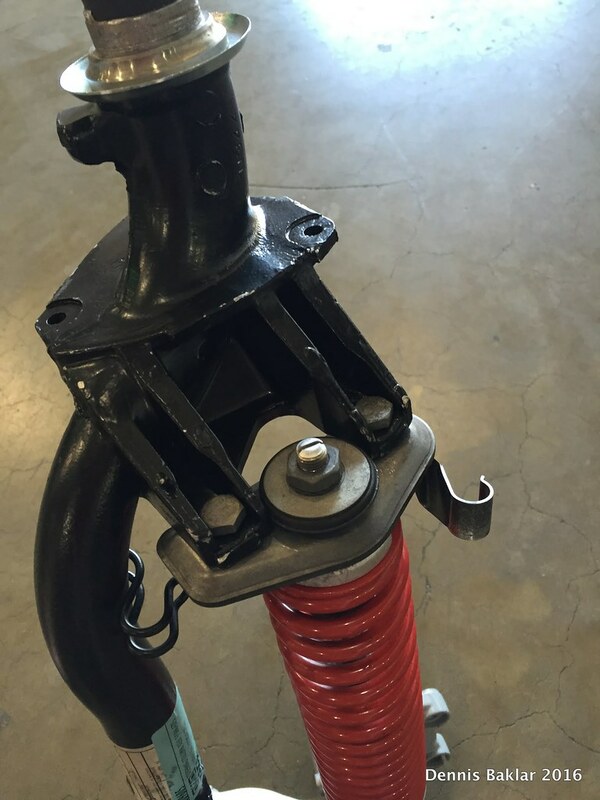 One on the left and one on the right of the shock. 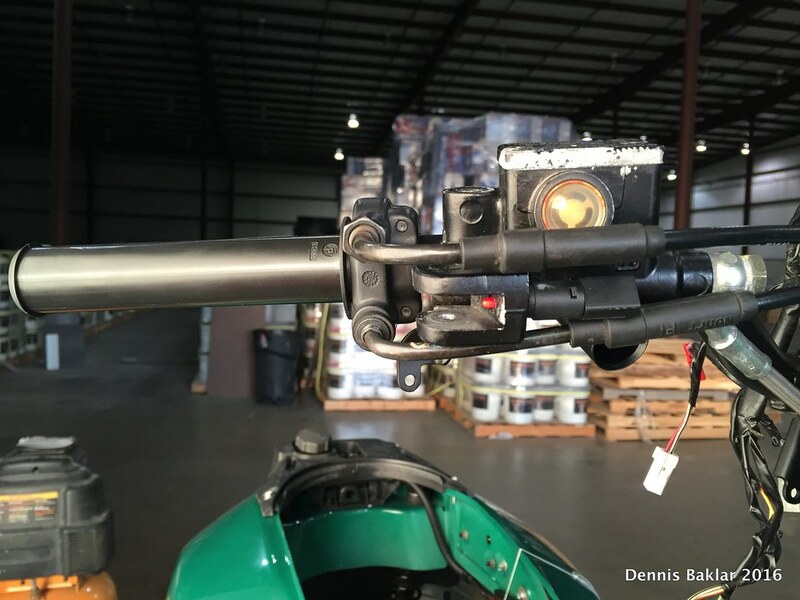 The steering column protrudes nicely from the frame tube. 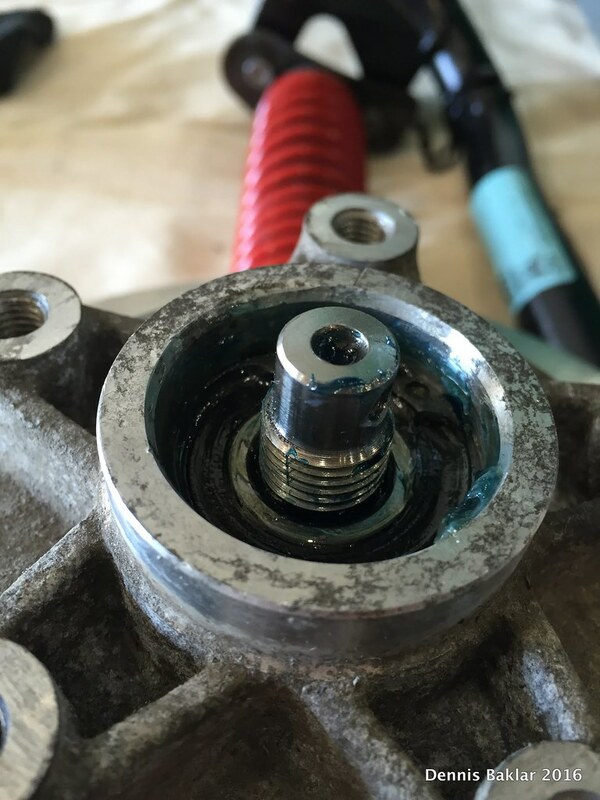 Time to put in upper bearings. 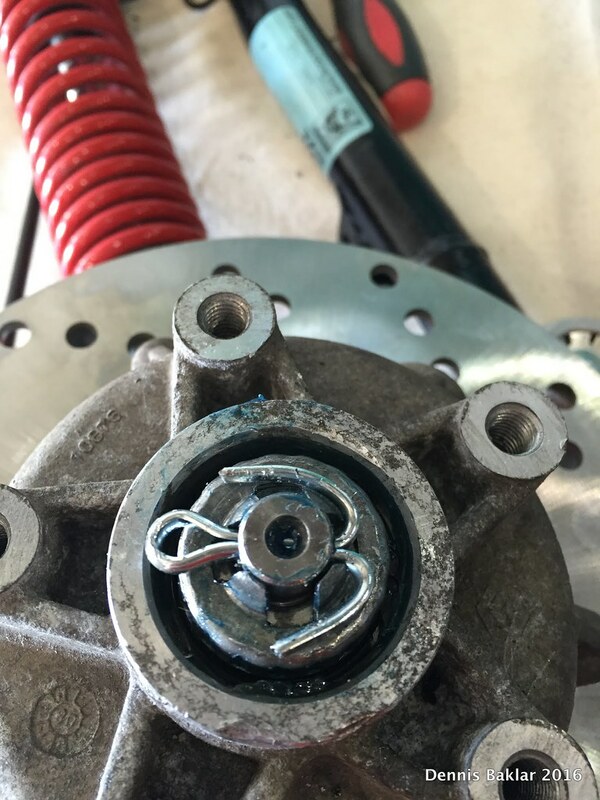 Screwing down the race and torqueing properly with special castle tool (see bottom of post). 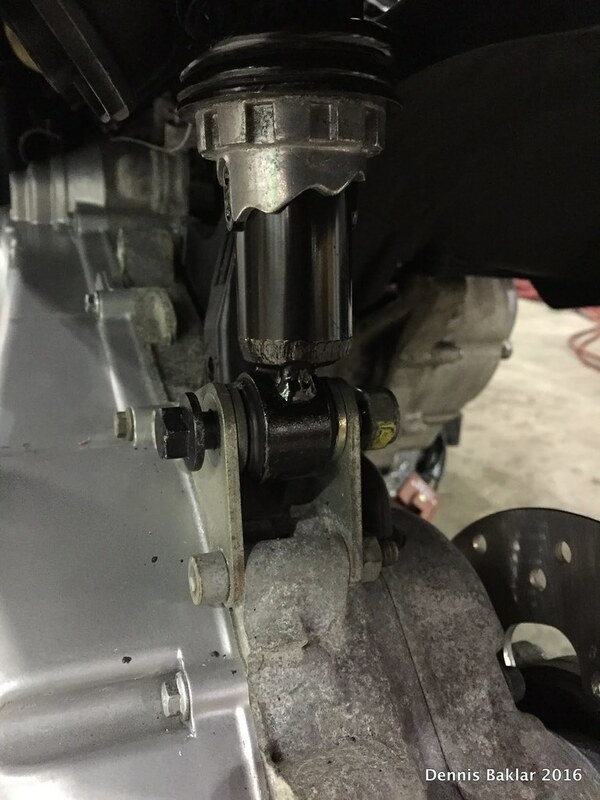 Spacer goes in, followed by the locking nut. 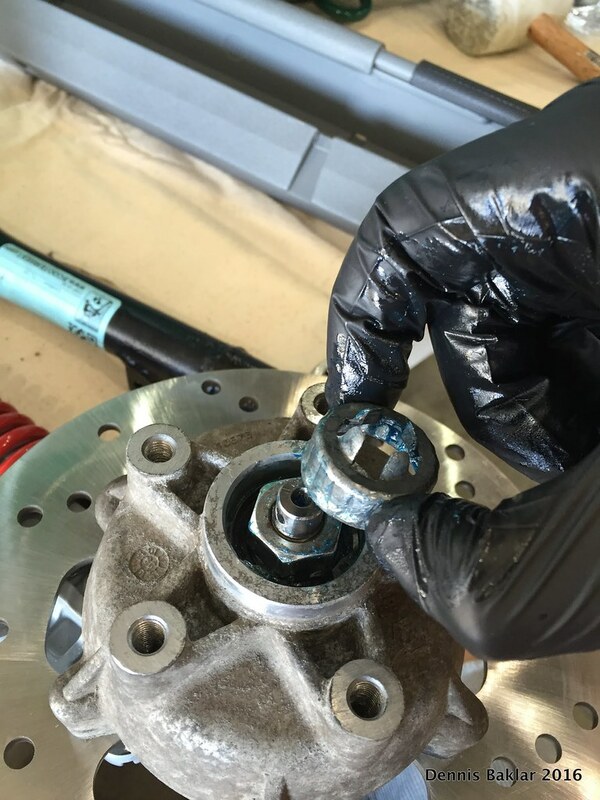 Torquing the locking nut. Test fit all the components for later assembly. 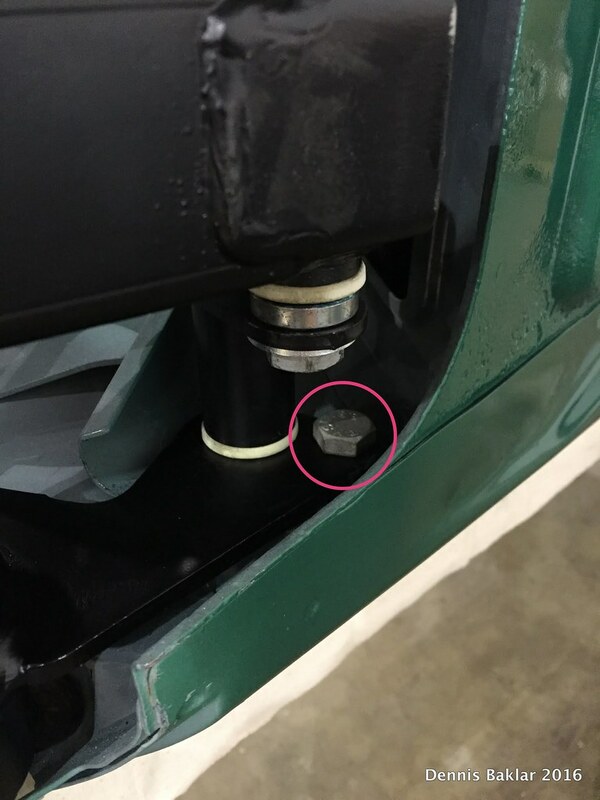 The rear axle only has a cone spacer on it at this point. 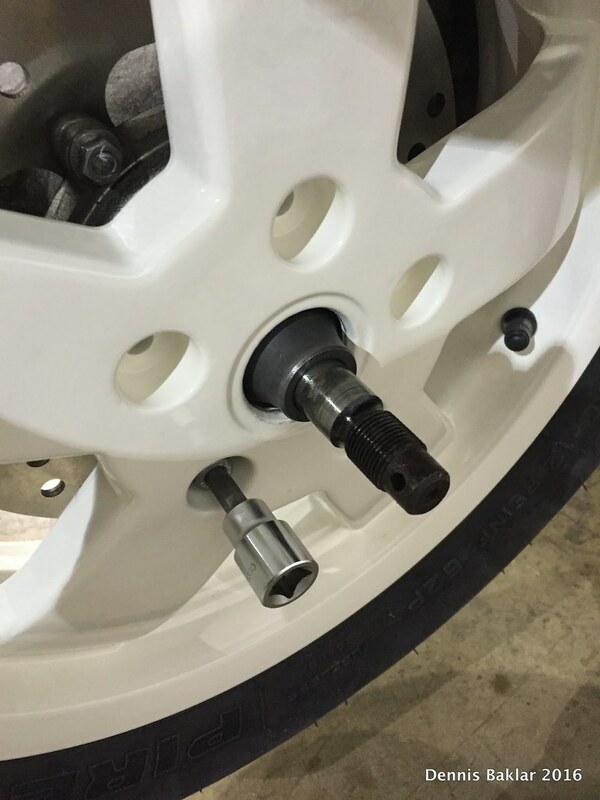 Wheel slides onto the cone spacer and tightens with the 5 wheel bolts. 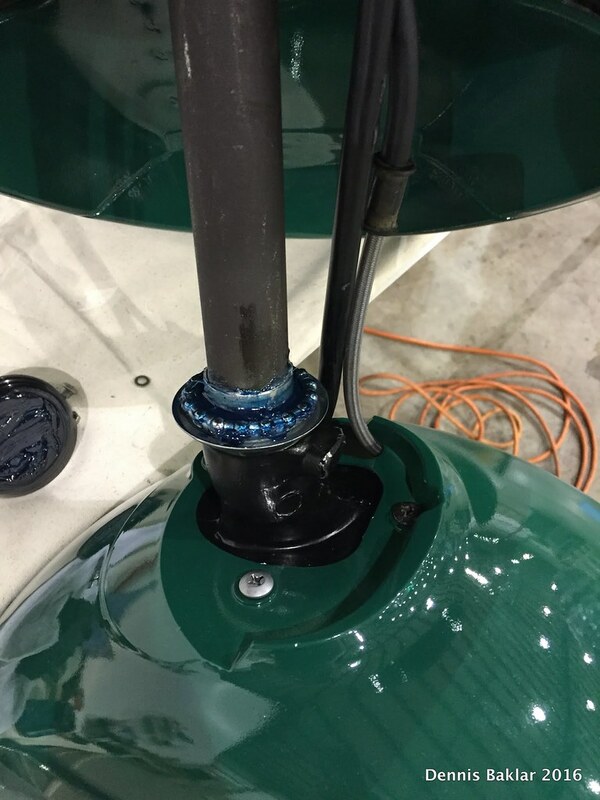 Each bolt has a round washer + wave washer. Then the nut. 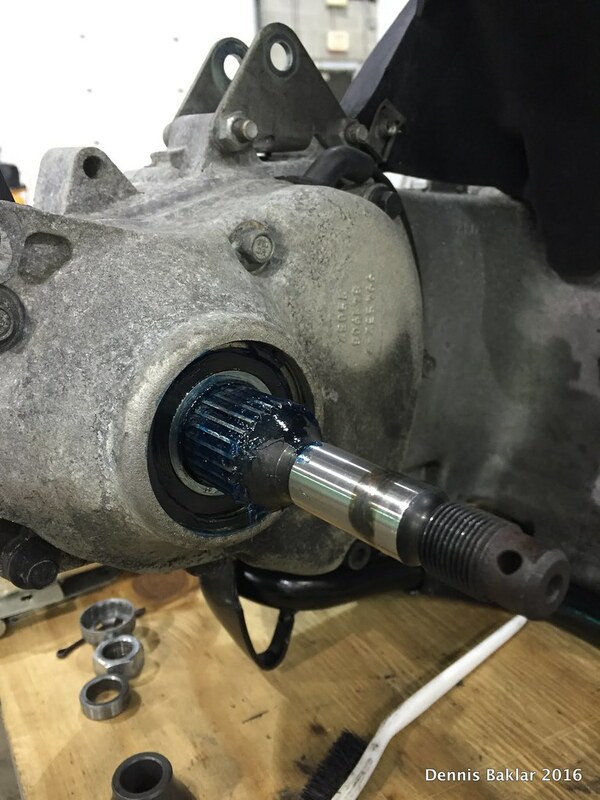 Torqueing the nut to specs. Finally, sliding on the castle nut and cotter pin. 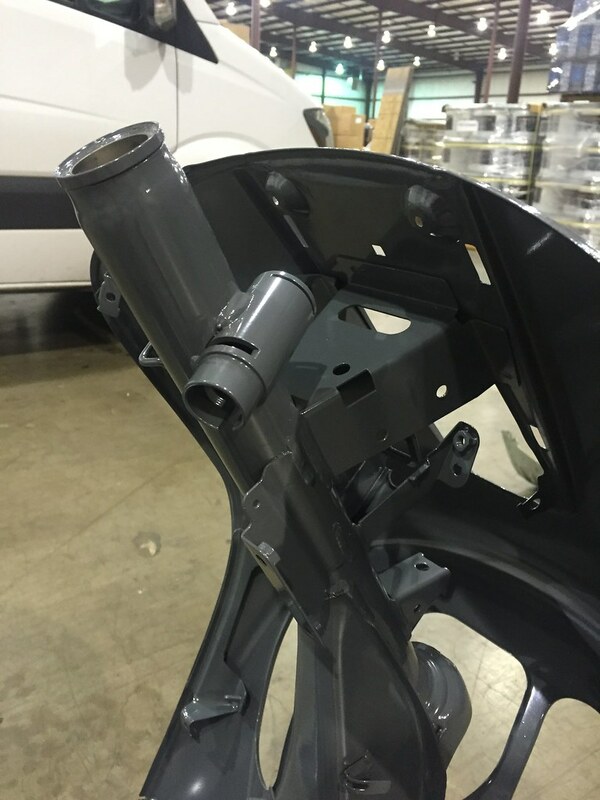 At the front, the muffler mount is attached with 2 Allen bolts. 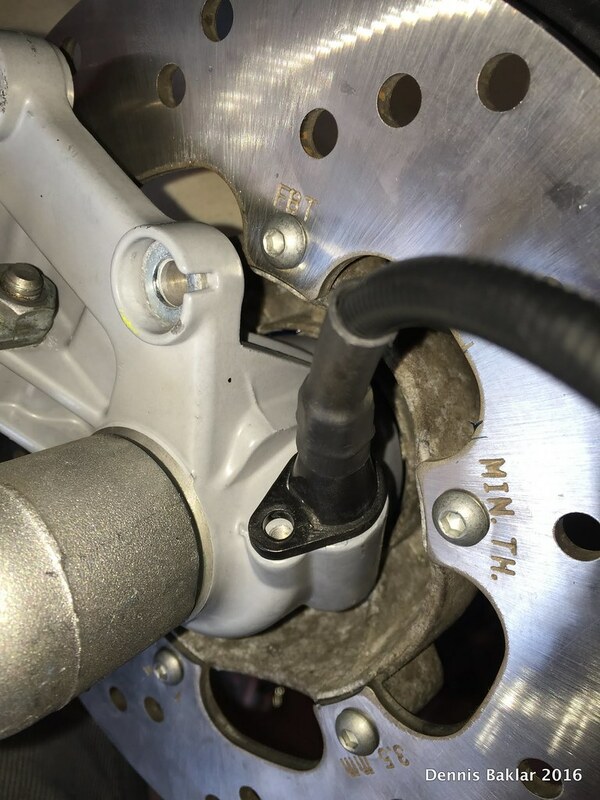 Now I connect the right shock to the muffler mount and tighten with the Nylock nut. 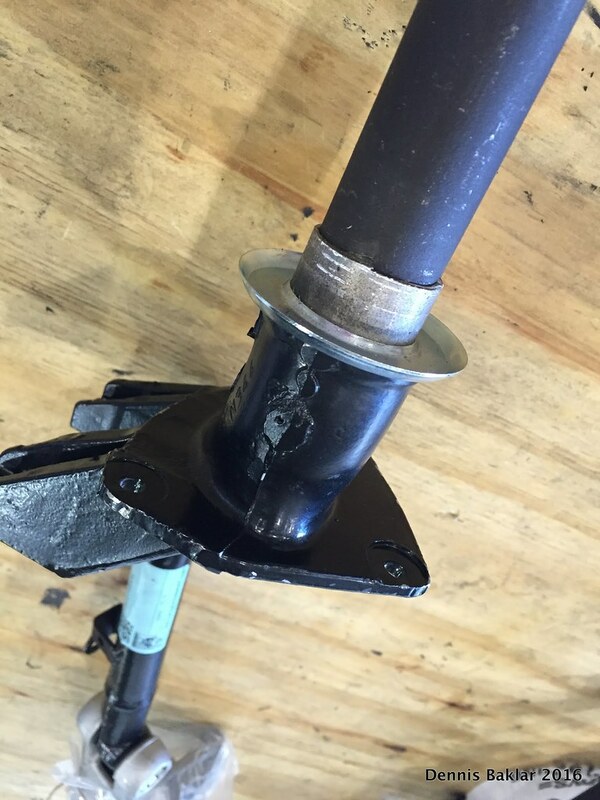 Sliding the muffler onto the mount, and screwing in with 3 star bolts. 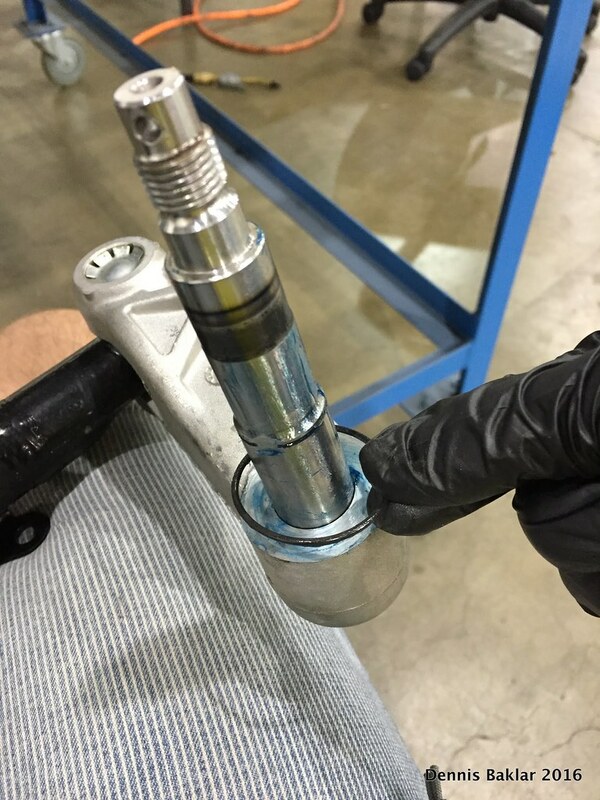 Torqueing to spec. 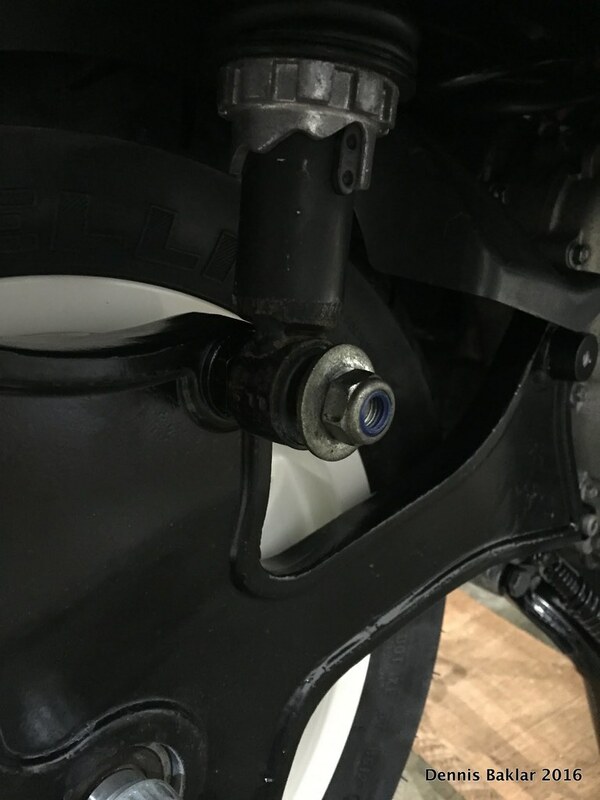 Once the front wheel is in place, I torqued the bolts and installed the hub cover by tapping gently in place with a rubber mallet. 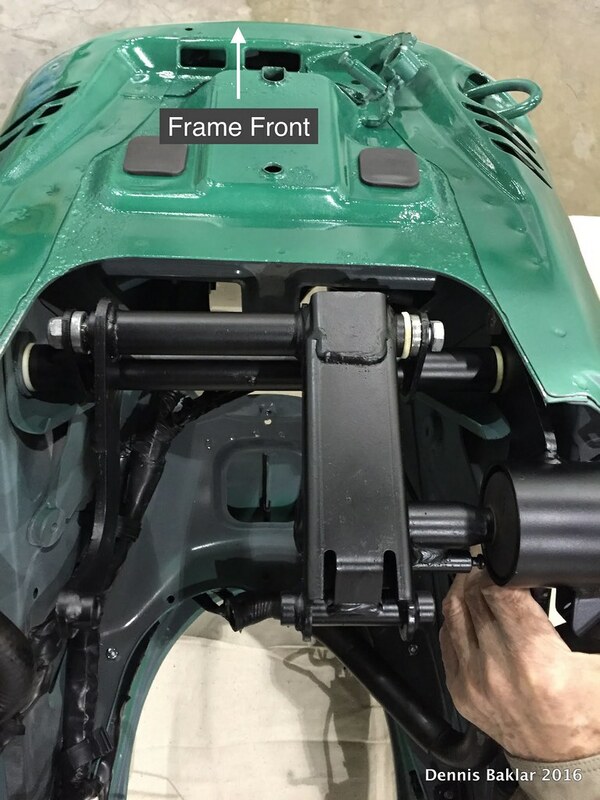 I took a quick break from all the technical stuff, and installed the frame trim into place. 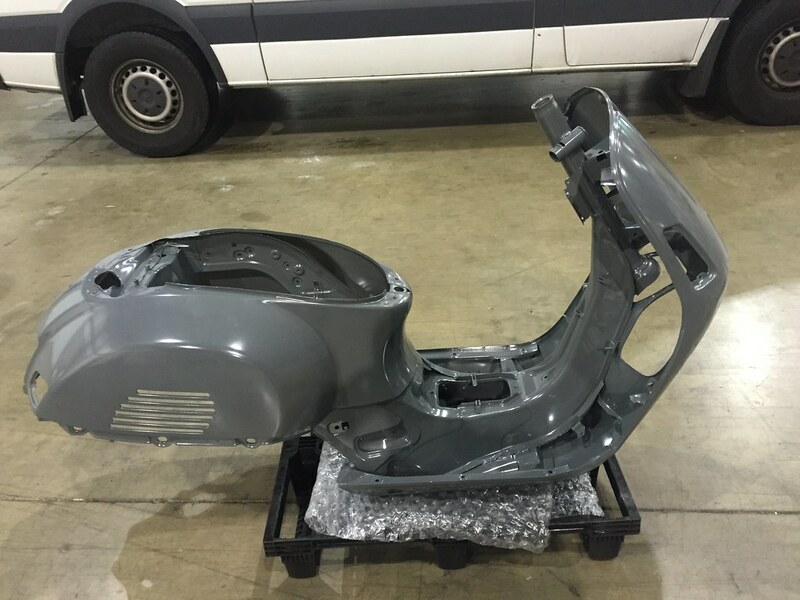 It is typically silvery in color, but I sanded it and painted black to match the color scheme of my Vespa. 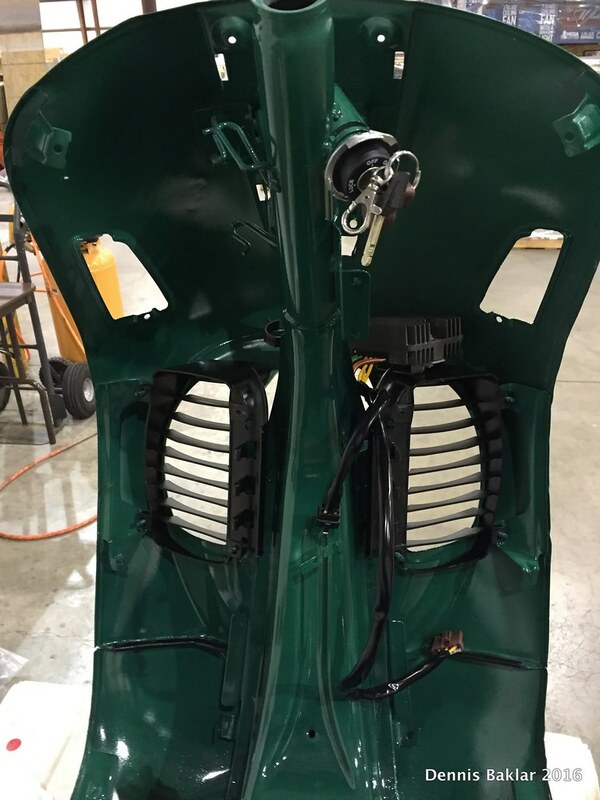 The trim just snaps onto the frame with moderate pressure. 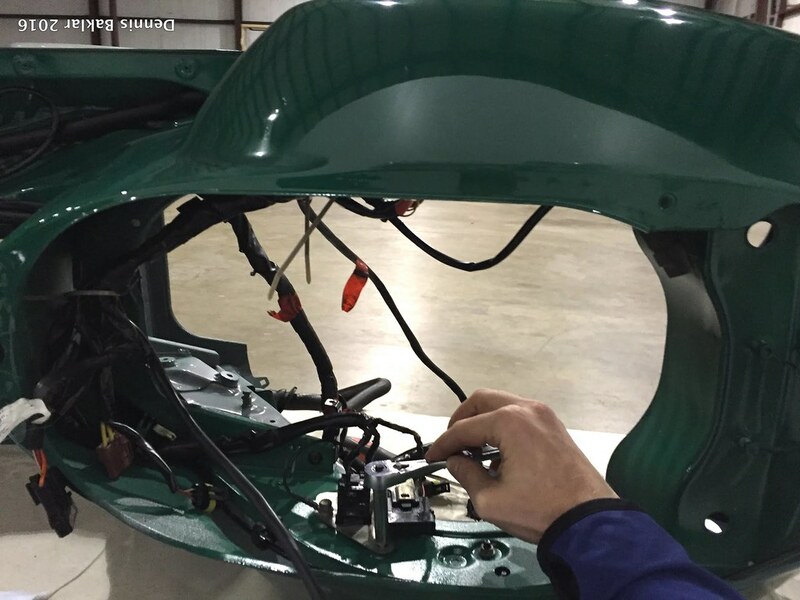 Installing the battery and connecting the wire harness POSITIVE and NEGATIVE leads to the terminals. 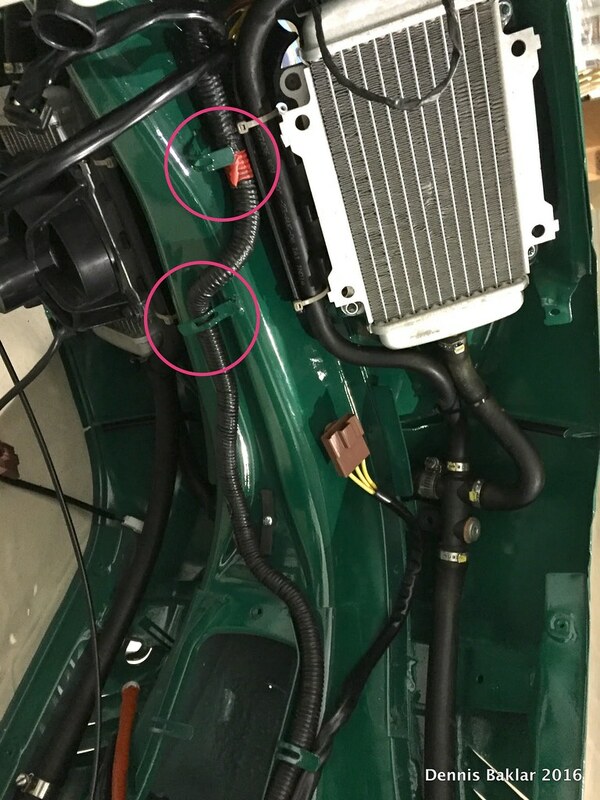 I’m installing a battery tender, so I’ve also attached the tender’s leads to the battery terminals. 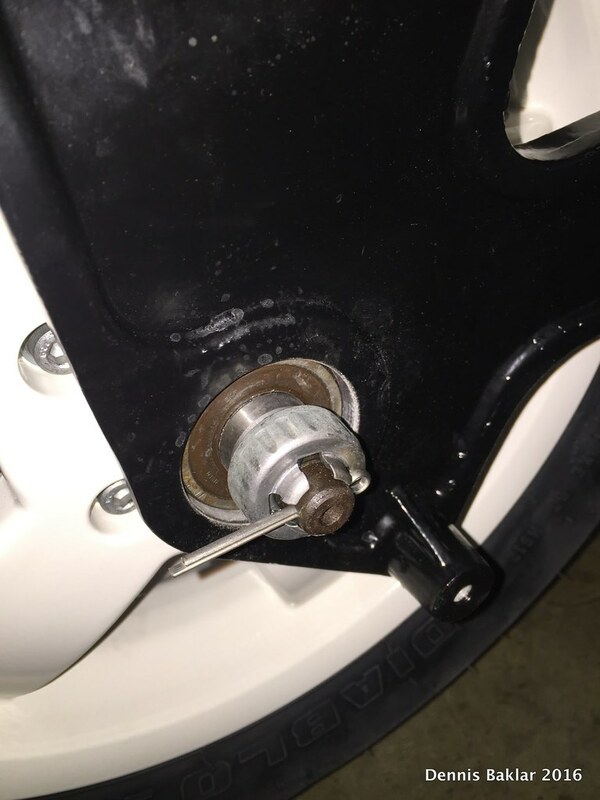 Once everything was aligned, I put in the plastic battery retainer and secured with 2 screws. 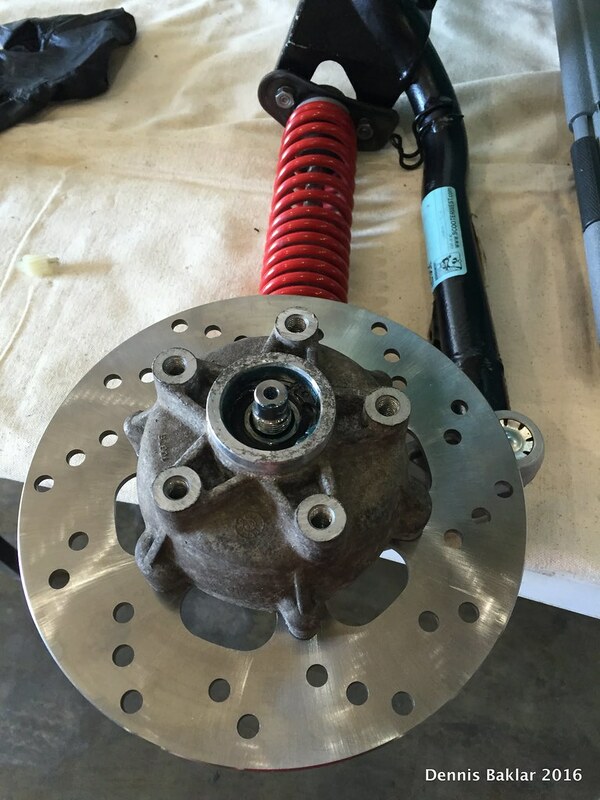 Bleeding the brakes. See bottom of post for recommendations. 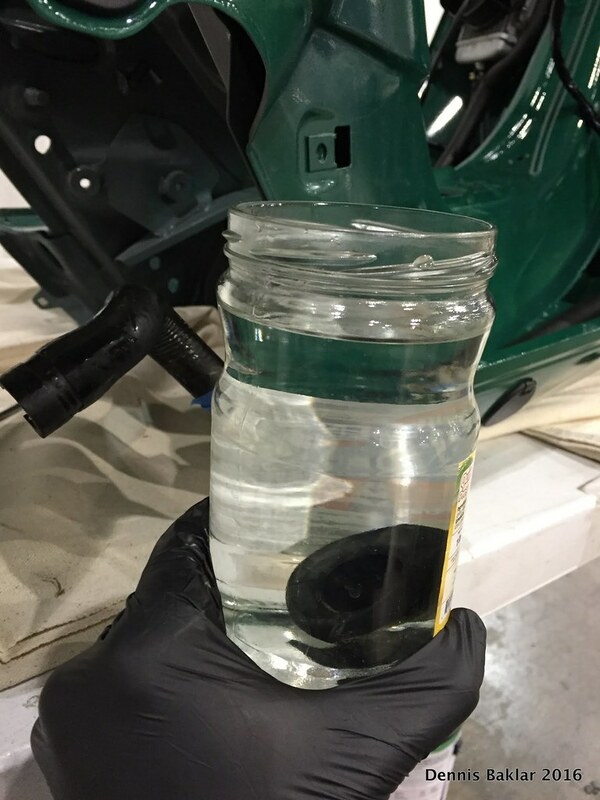 Since I didn’t do any engine work, it was already filled with oil (which I had changed during my initial visit to the Vespa mechanic). 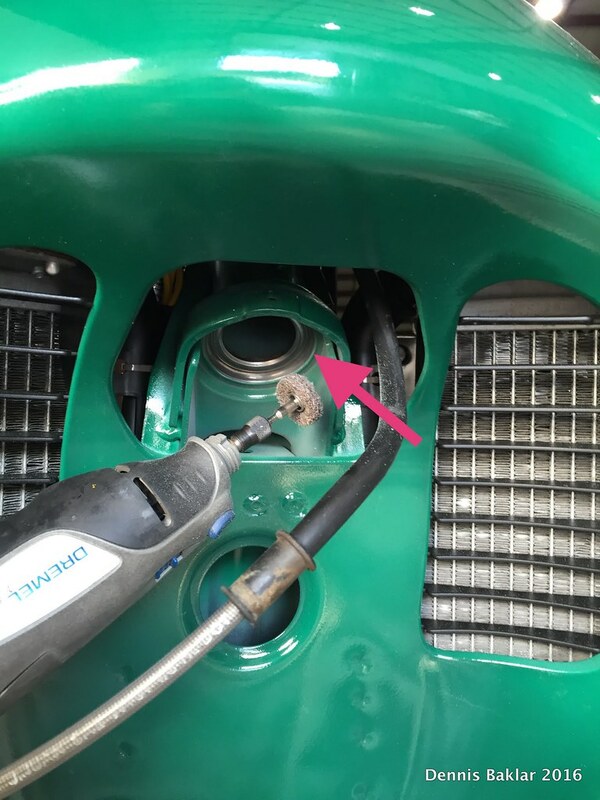 After tightening and rechecking all the cooling hose connections, I filled the coolant and made sure to bleed the system properly, which is super essential. 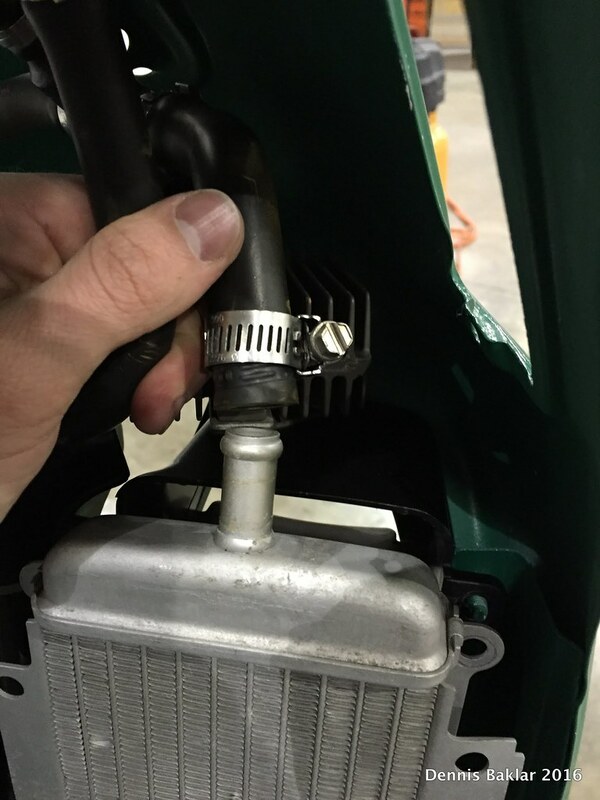 I didn’t know about this at first and was surprised when I first started the engine up, the temperature went to HOT really quickly. My first reaction was that the gauge was defective, but after I did some research and bled the coolant system, things went back to normal. 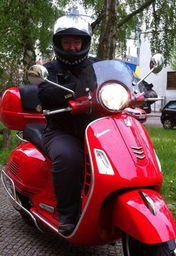 With everything in place and all steps followed, I had the Vespa back in one piece, more or less. I hadn’t installed the body panels yet, in case there were issues that needed to be fixed. I was honestly quite nervous, since I hadn’t tested any of the work that I had done up to this point. 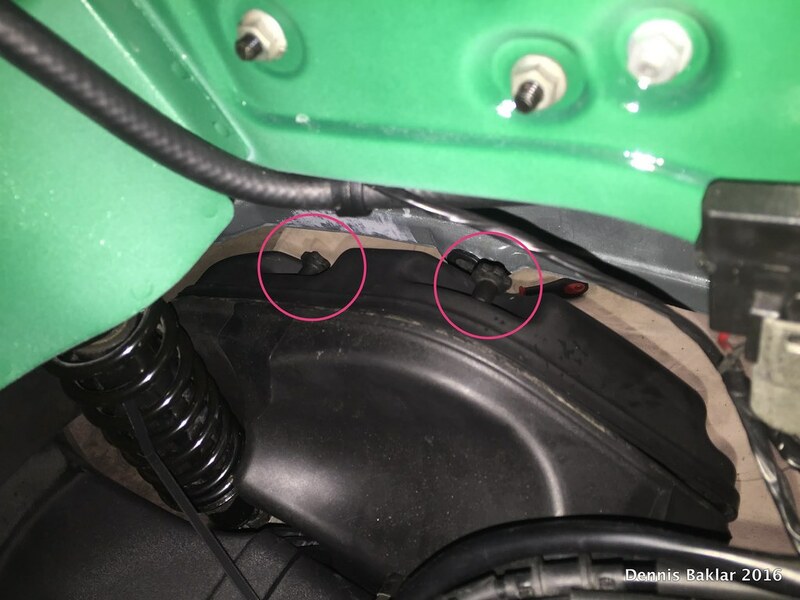 There were numerous systems in play (electrical, cooling, braking, engine, suspensions) and each had areas where I could have easily missed something. 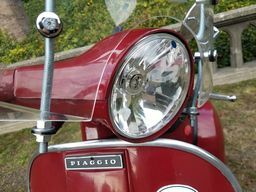 Even worse, with my limited understanding of Vespas, chances were that I wouldn’t be able to properly diagnose or fix at least some of the issues that came up. But to my incredible surprise, everything worked fine. 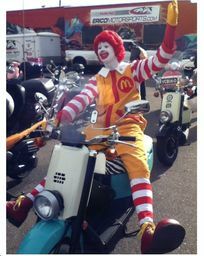 I drove around for 30 minutes or so around the business park in the back and the Vespa was solid! It was a good day, as Ice Cube would say. 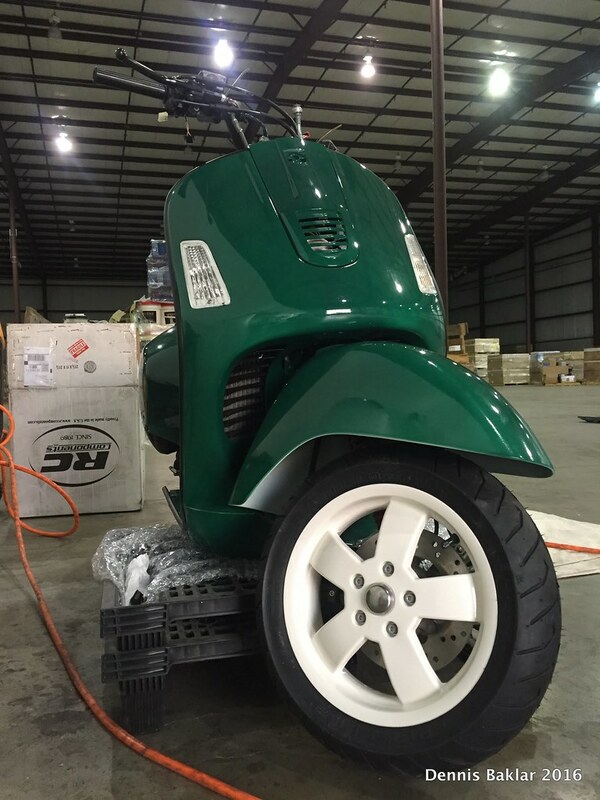 With the test ride complete, I put the body panels in place following the video from ScooterWest in reverse order. 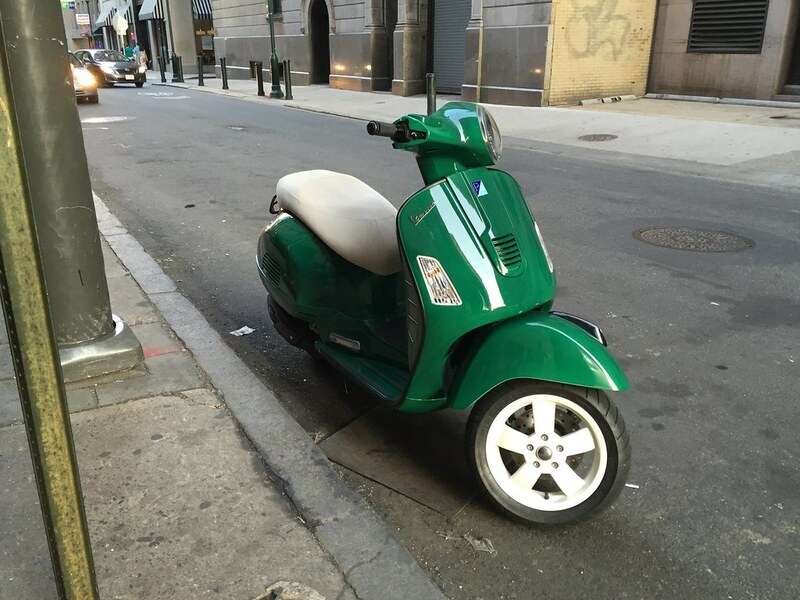 Please note: I have no professional experience as a mechanic, let alone a Vespa mechanic. The purpose of this post was to share my story and hopefully provide helpful information to the community. 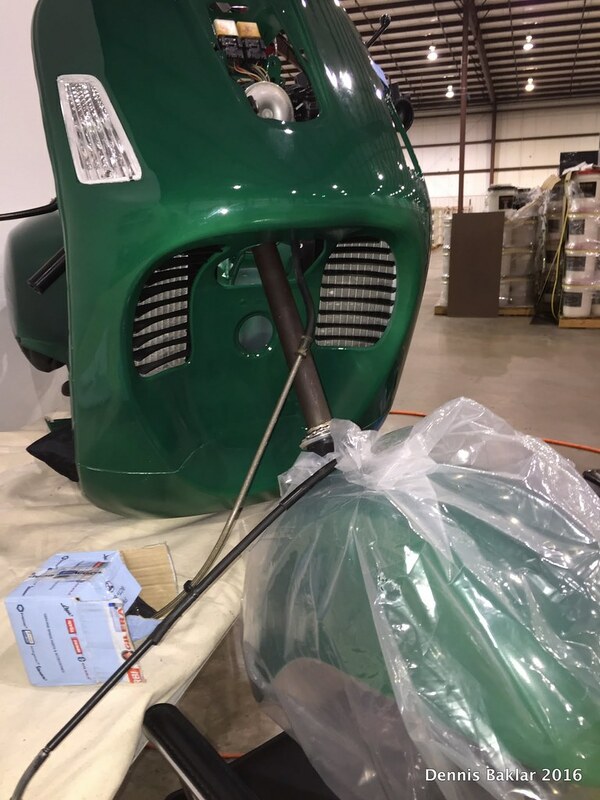 Keep in mind, this sort of project carries certain risks, including the risk of bodily harm, property damage, and even death (Oh NO!!!). I’m not advocating you do what I did. And if you choose to work on similar things, please be wise and careful. 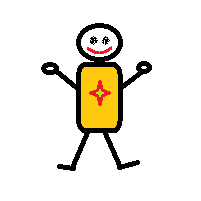 Take your knowledge, dexterity, and surroundings into account and defer to professionals when unsure of how to proceed. Beautiful job! I love the color! I'm sure this post will come in handy for many folks. Thank you for your meticulous work and documentation of it. Awesome post! I really enjoyed all the excellent close up photos. It must have tacked on a few hours to the job to take a photo of every step but definitely helpful to novices like myself. A superb job and a superb write-up on it. Congratulations. Just one quibble. 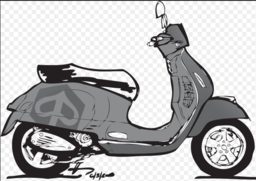 You need to get a horncast Piaggio badge that matches the scooter. The blue just doesn't go. Google Piaggio Horncast Badge and you will find dozens of options - either a matching colour or a nice contrast (beige to match the saddle?). Holy freaking moly! You did one hell of a job here man. That GTS looks amazing! I can only imagine the pride you must take in riding her now. You have done one phenomenal job! 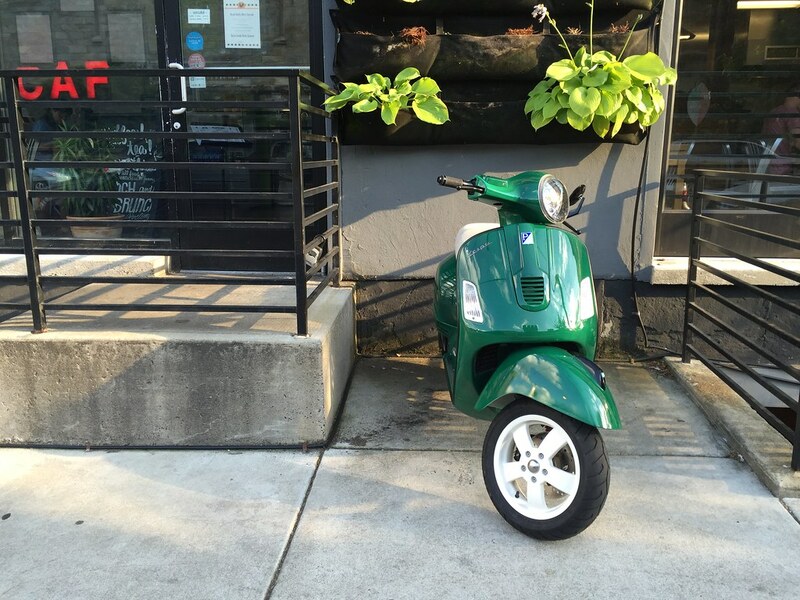 Very nice scooter love the color, great build and invaluable build documentation. Fantastic!!!! The place to come next time I tear something apart and "say how the hell does this go back on". Just one quibble. 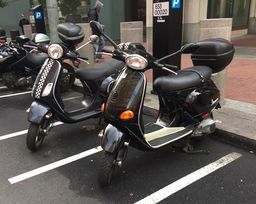 You need to get a horncast Piaggio badge that matches the scooter. Thanks for the positive feedback Friends! And thanks for the great idea Mike - I had no idea those existed; will definitely get one ASAP! I downloaded the whole set teardown.zip, I don't plan on doing a teardown of my GTS just as yet but I guess in a few years I will undertake something like this. 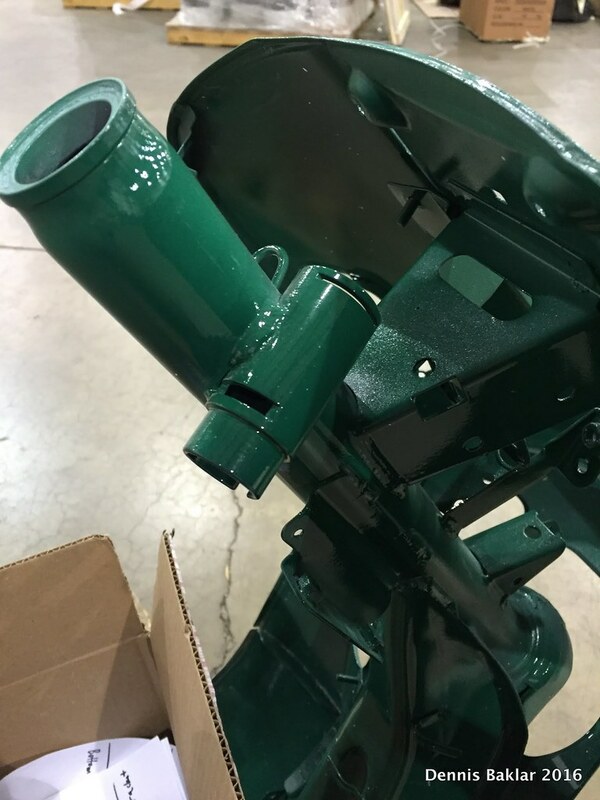 I wonder if you can let us know where you got this sandblasted and powder coated and how much did it cost to do that along with the paint job. Wonder if you would have done this if you did not have the space like you have, I don't think I could do this on the sidewalk as I don't think I could finish all of it in one day for sure and knowing myself murphy's law will always cause me problems. I got the frame sandblasted and powder coated for about $200 in the suburbs of Phila. 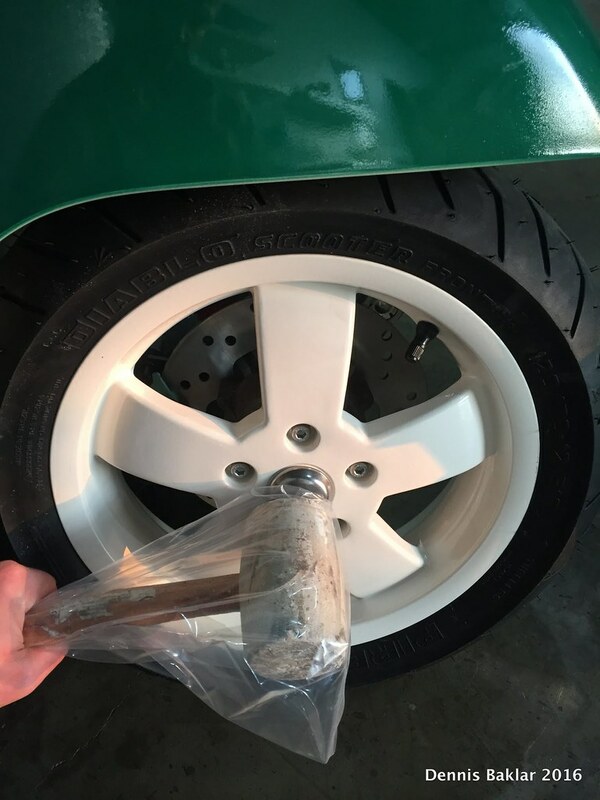 The wheels were $50 each. Even though the work was good, the service sucked...so I can't recommend the place. 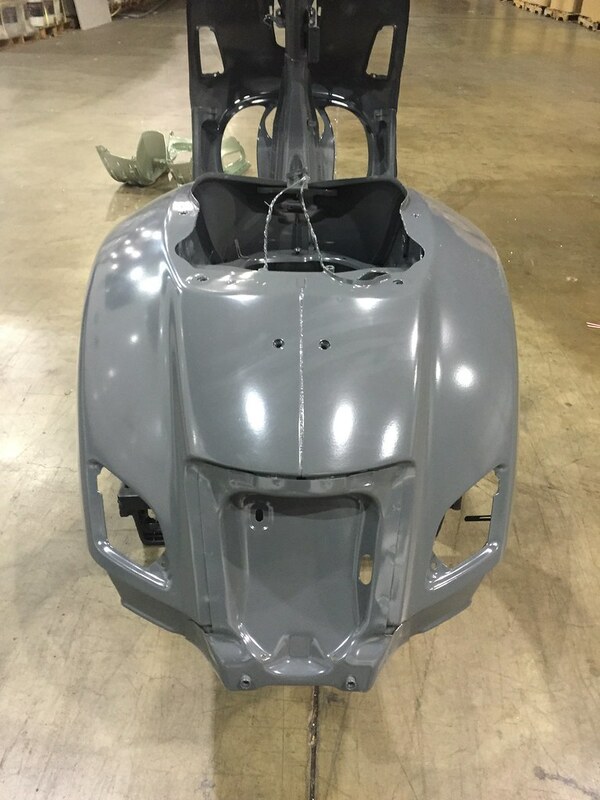 Good paint jobs on these can cost $1000+. I put an ad on Craigslist and within a month got in touch with a guy in tech school who needed a project to work on. I paid him for materials and $300 for labor, so $400 (plus/minus) total for the paint job. And yes, I was lucky to have access to a friend's warehouse which allowed me to work on this casually over the course of 6 months. 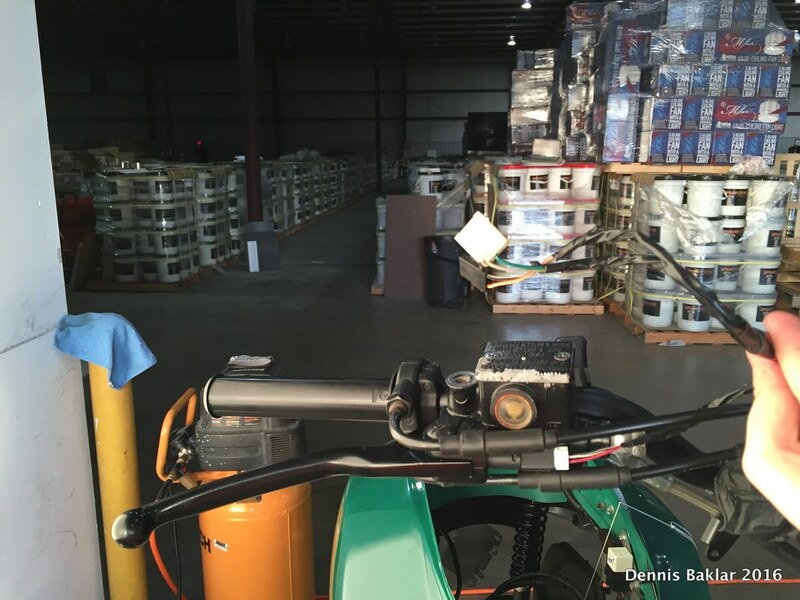 There were lots of tools, pallets, and space to keep things organized. Having access to this space was a key factor in my decision to do the project. There's no way I would have done it on a sidewalk. I guess it's doable, but it would add a tremendous amount of hassle and I doubt I would have enjoyed it. I often worked on this late into the night, which wouldn't be great outdoors. I also did it over fall/winter. Also not great. 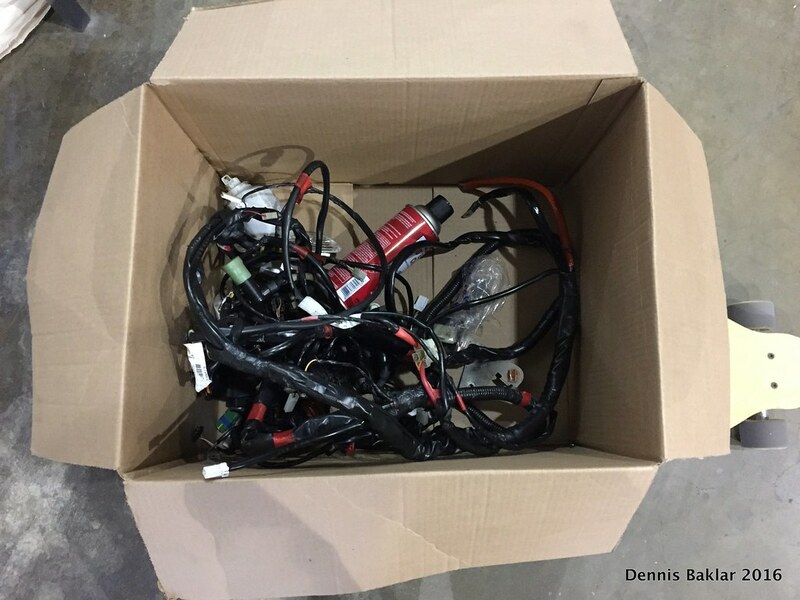 And keeping track of all the parts was hard enough in a large, controlled space so I imagine I would lose a bunch of parts outdoors. Great job on the build and thank you for taking the time to do this terrific documentation. I can imagine how much time it took to put together all the pictures and the narritive. Well done! This is the greatest blog post I have ever seen! So inspired to take something like this on myself. 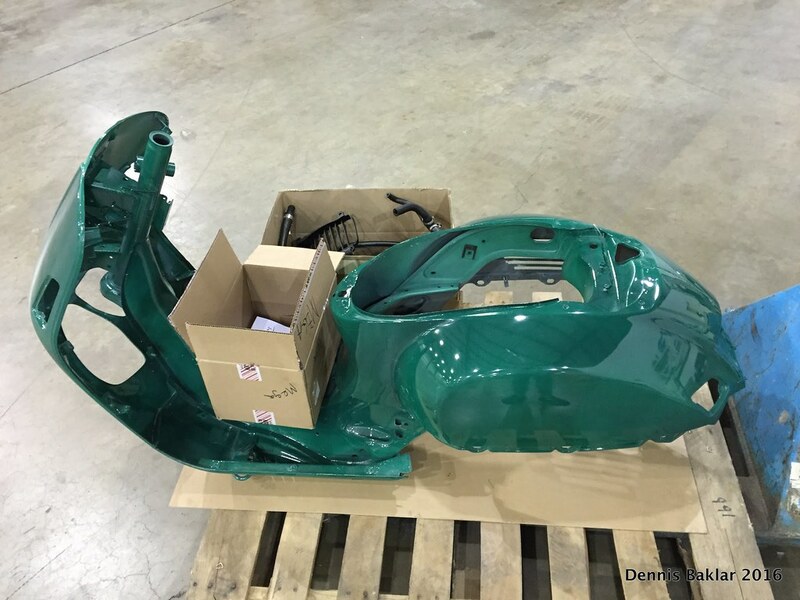 One small question - how did you make the initial body repairs pre paint job? 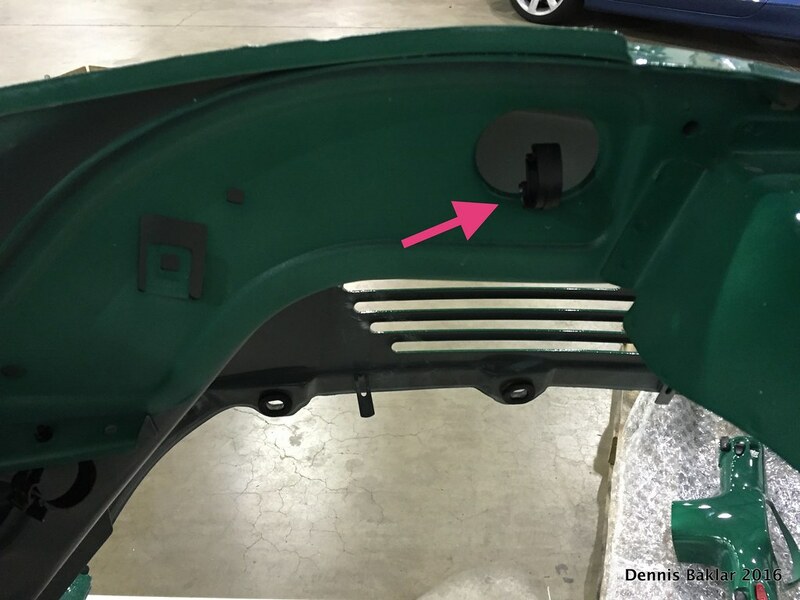 To answer montloaf: The dents were pulled or hammered out as much as possible prior to powder coating. 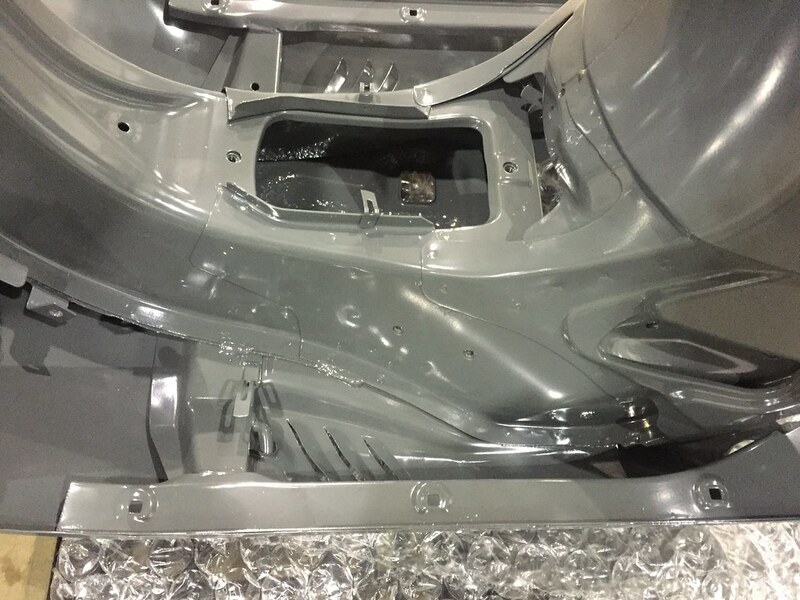 After powder coating, the damaged areas were sanded and finished with body filler before priming and painting. Super job Thanks for all the pix and inspiration_ I have to up my game and clean up my shop! this is massive! awesome time and effort spent on. woww. looks great. 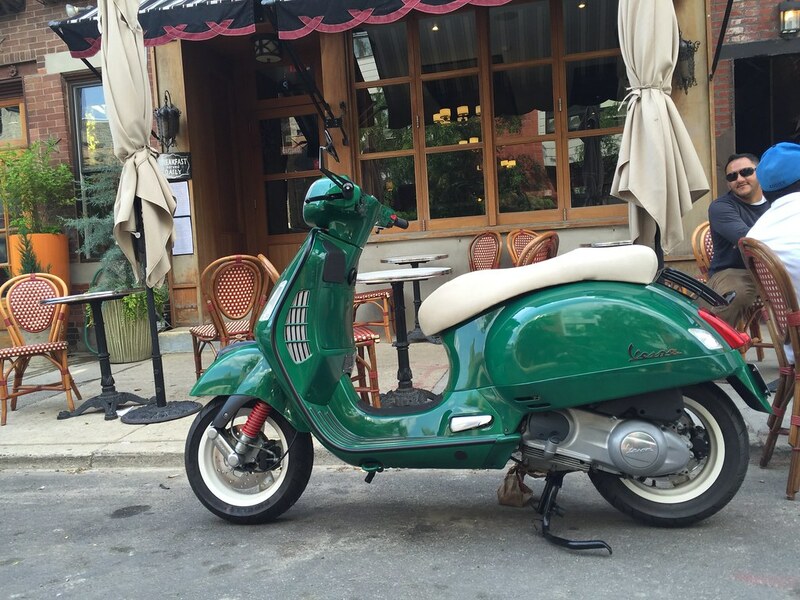 love the British racing green. 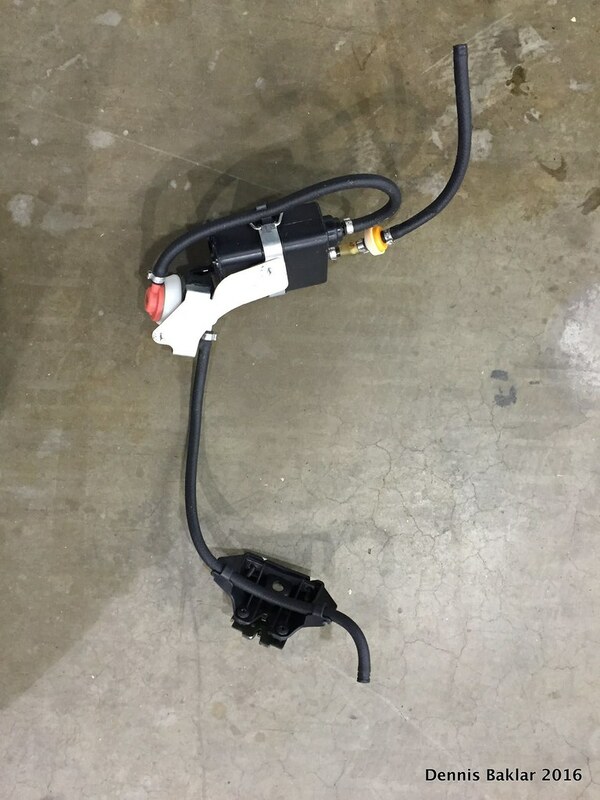 Hi 1wheel_drive - I did not see this anywhere and am curious - how many hours would you say the job ended up taking you? Most excellent and thorough post..... you've saved me hundreds! 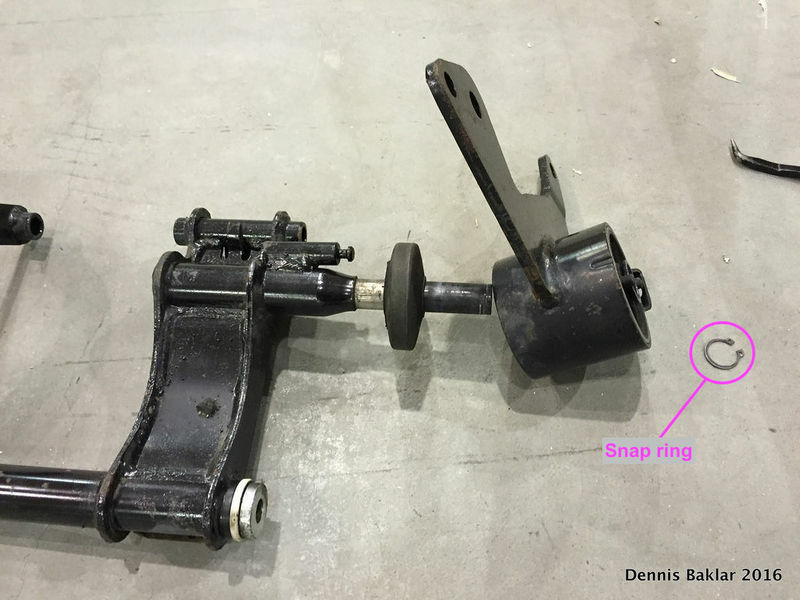 On the swing arm, what is a snap ring? 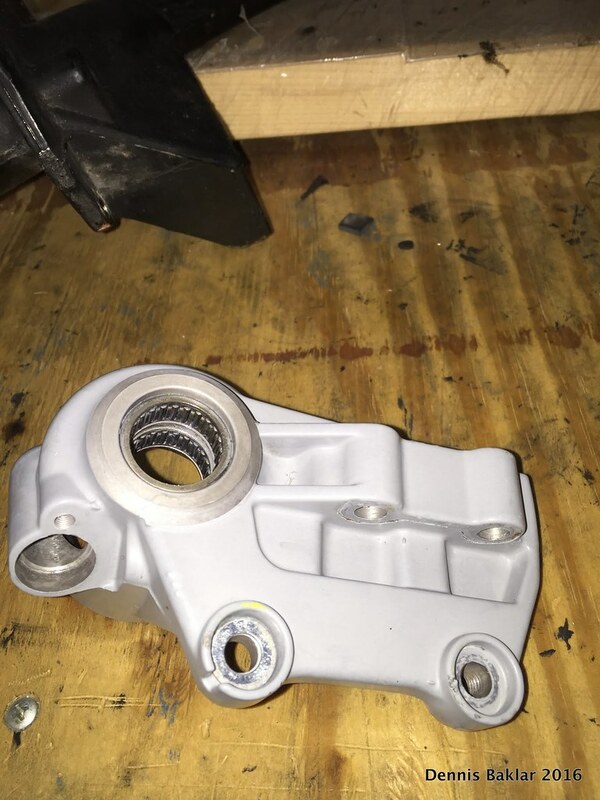 Is it the bracket(599249) holding the silent block or is it just the silent block (272750)or something else? 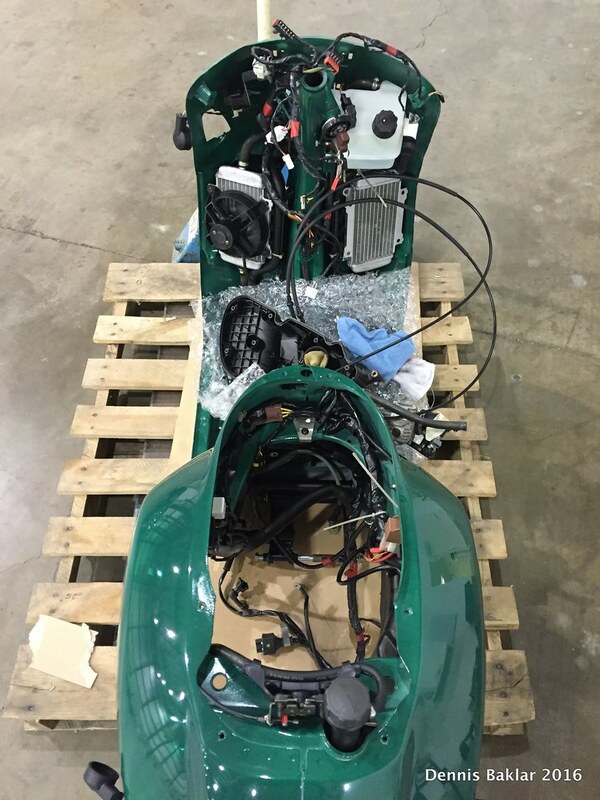 Outstanding rescue / restoration project! 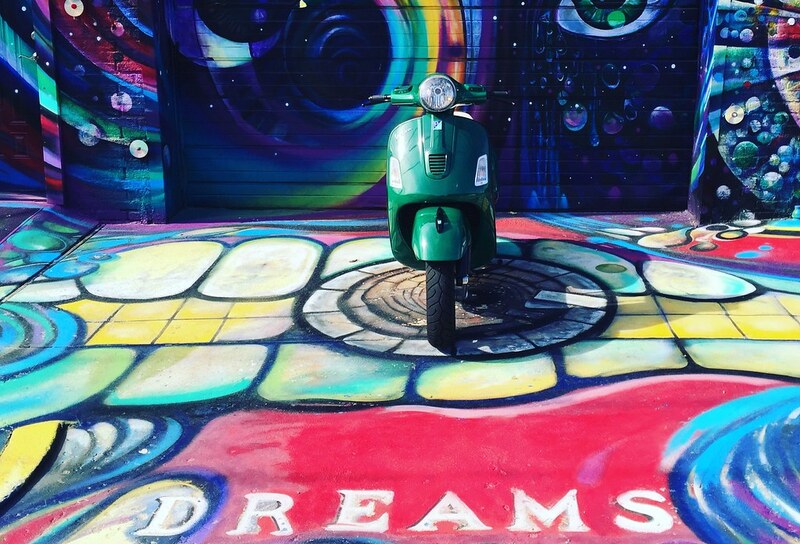 Thanks for sharing your triumph with us and giving life back to this gorgeous Vespa! 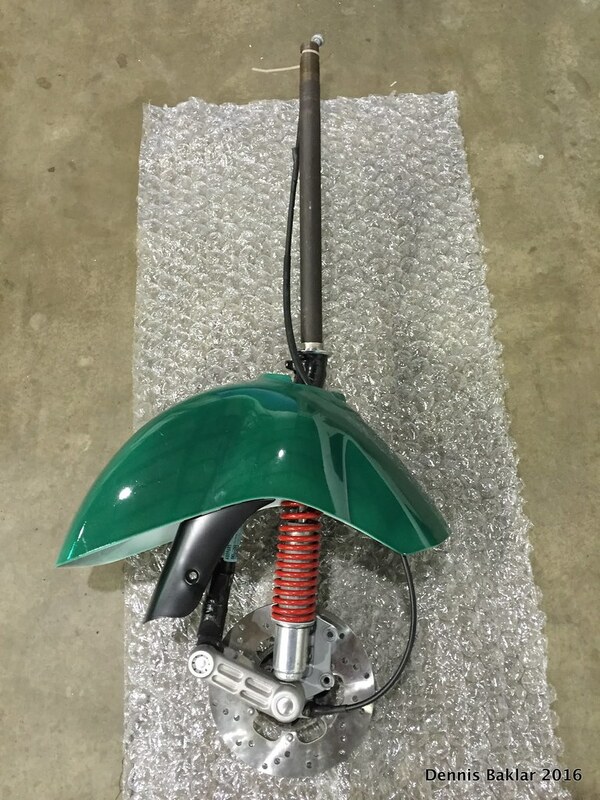 Congratulations on restoring what is now a beautiful scooter. Your hard work has obviously paid off. Love the color. Even better was your thorough write-up and attention-to-detail photos. Both greatly informative and inspiring. I have red this post several times now, I have downloaded the project files so that if and when I have the guts and the capacity to pull something like this off I'll have a reference to go to. 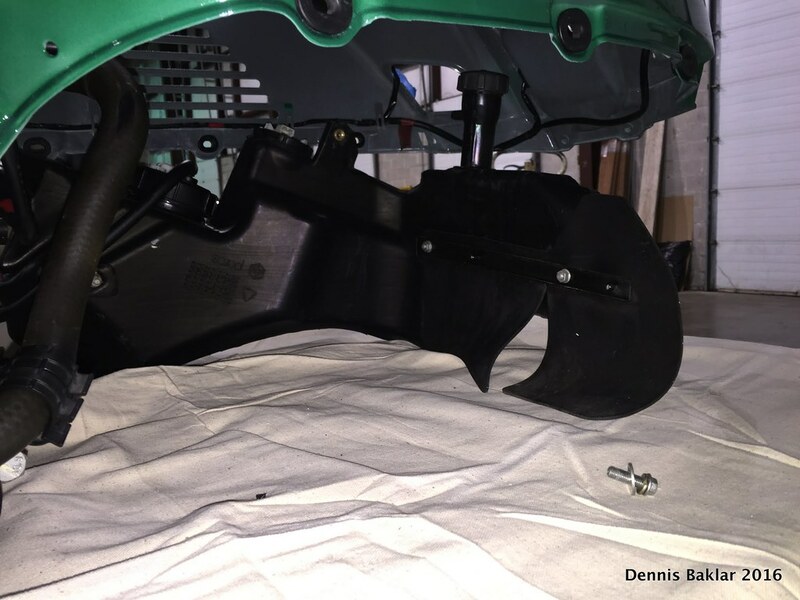 I keep coming back to read it as I find it fascinating in terms of the focus, dedication and organization of parts etc to be pulled off by "1wheel_drive"
Hey Bronxbul. Glad this helped you!! 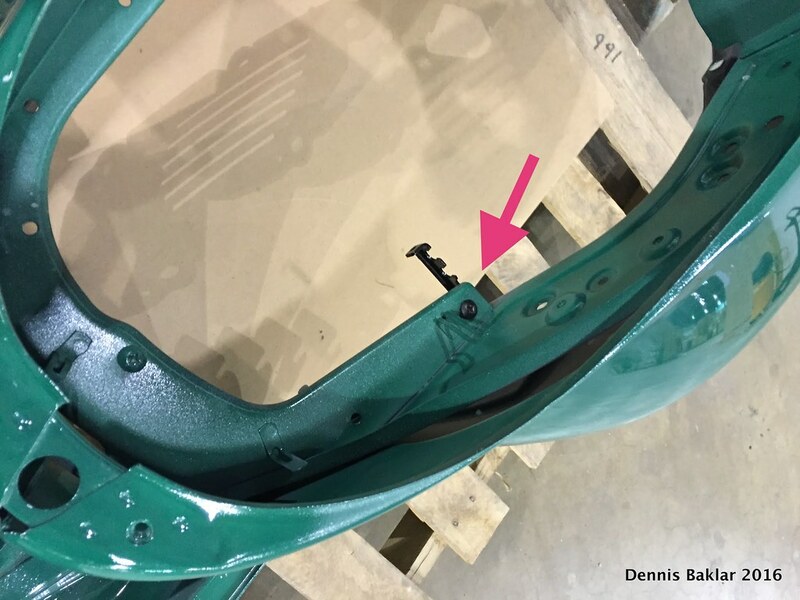 I circled the snap ring in the attached pic. Thanks so much, started my frame swap today. Hope to finish on Tuesday. Huge project, but your posts are my safety net! Excelente trabalho, muitos parabéns! Grande Partilha. 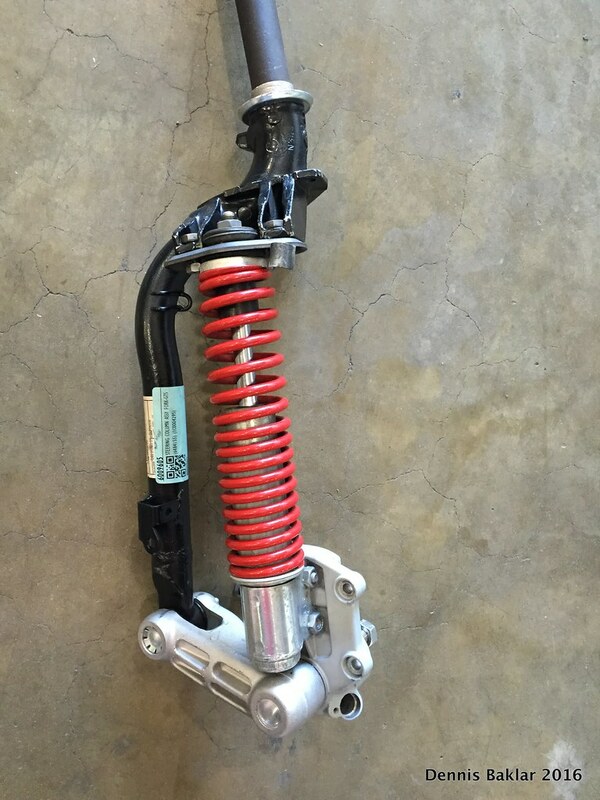 Vou começar a recontrução da minha GTS após um acidente. Excelent Work, congratulations! Great post, helps a lot. I started now a similar thing after an acident. great write up. 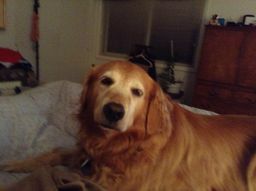 You did an awsome job and should be very proud of your work I do have one question. i am in Florida and you need a tag to ride on the street. How did you get around getting a plate? 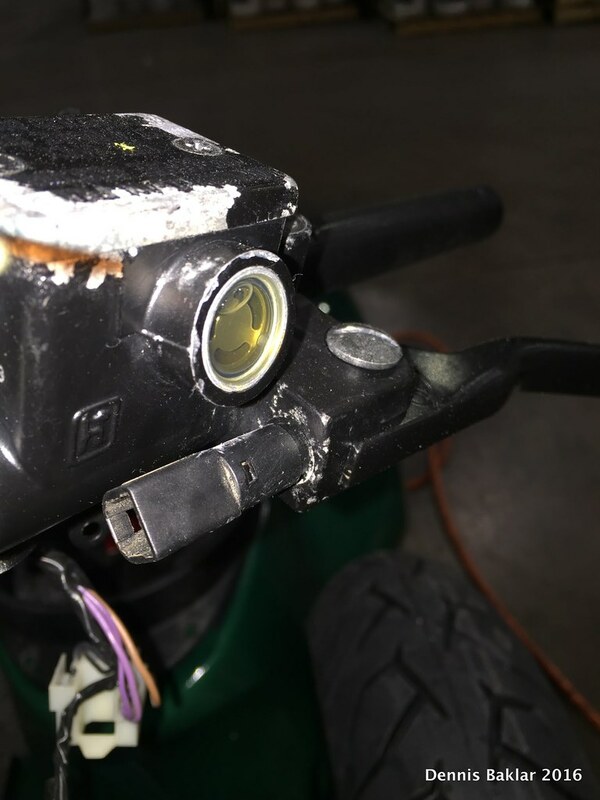 Are you not worried that the original owner may come and want his scooter back after you did all this work? Nice to know that you now own your great piece of art! AWESOME! I love it when something gets "saved". You went far above that and now have a unique, beautiful machine to run around on. Fantastic job on making it all happen. I appreciate you documenting with all the photos, and taking the time to explain why and how you did all this. A bit of the behind the scenes of the though processes and decisions to be made. Again, fantastic job, and thanks so much for documenting and sharing! I do have one question though... when you said "I acquired an abandoned 2012 GTS after it had spent several winters (and summers) adorning the sidewalk by my neighborhood laundromat." 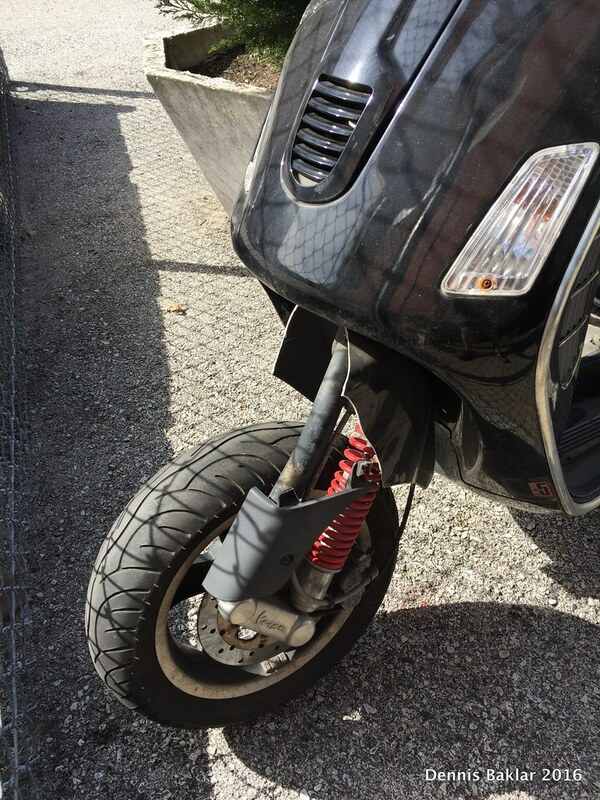 ...as in acquired from the owners?...or acquired by different method?...either way the scooter now live on better than ever. Nice work.